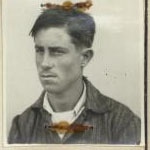 Some of the Fishermen pictured in the banner above are listed below. 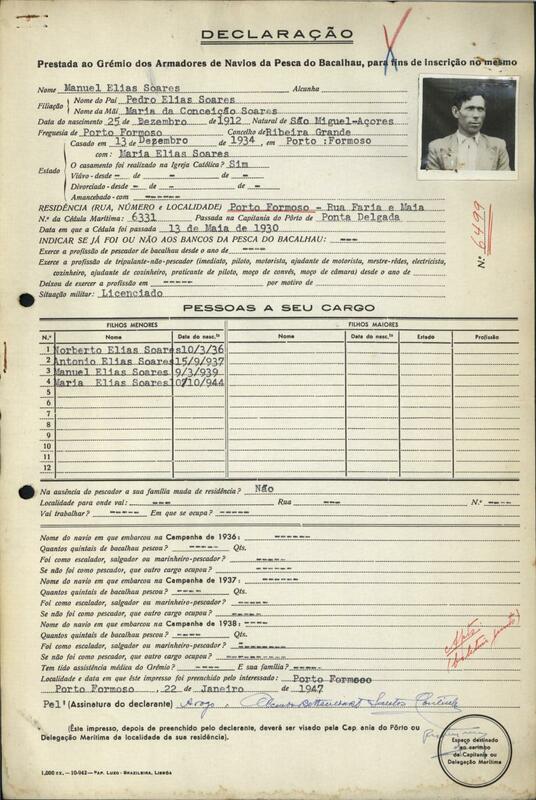 Names and details will be added as they become available. 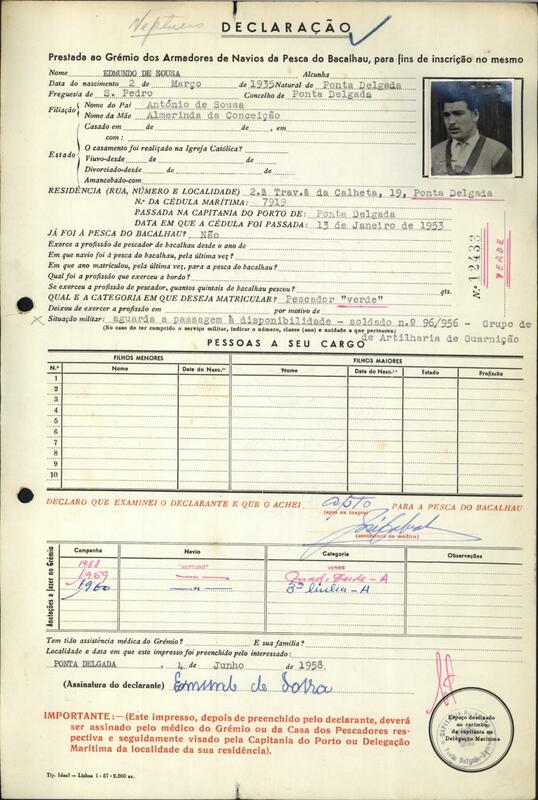 The information provided below is only a partial list of the hundreds of fishermen from the Island of São Miguel, Azores who registered with the Cod Fishing Ship Owners Guild (Grèmio dos Armadores de Navios da Pesca do Bacalhau). 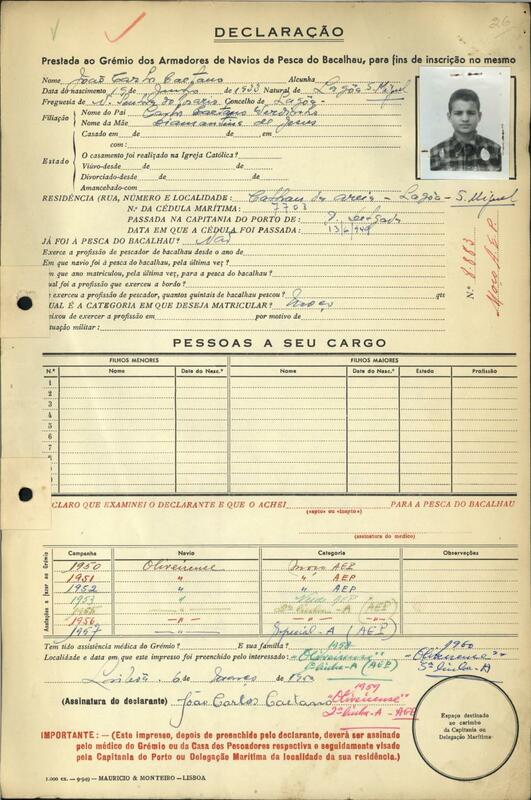 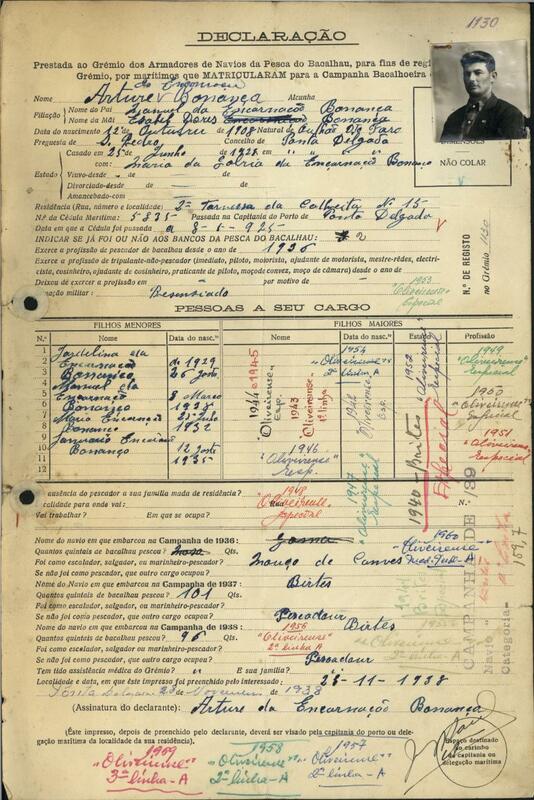 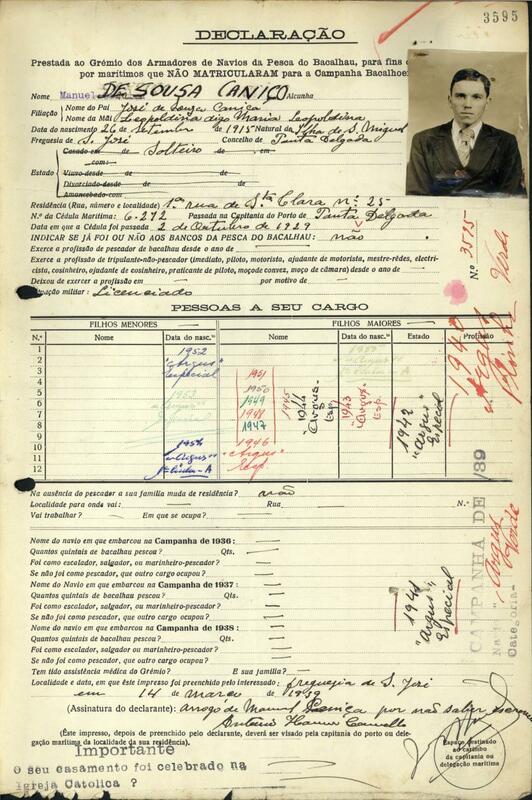 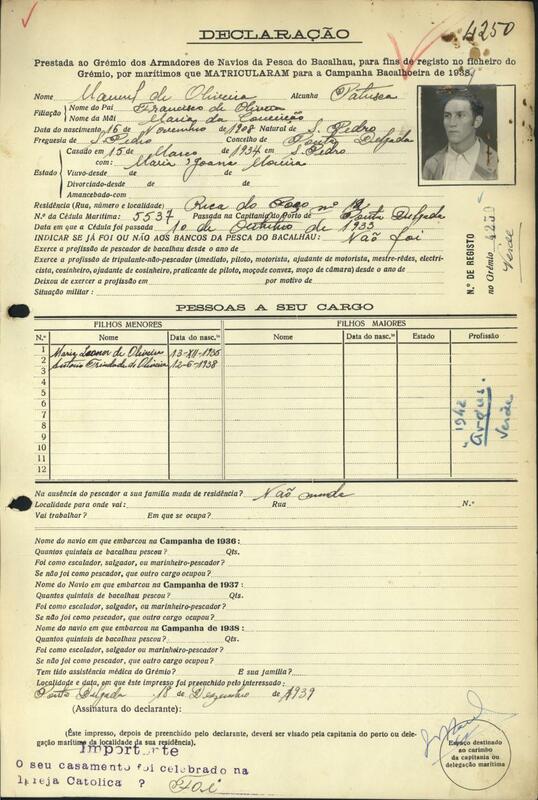 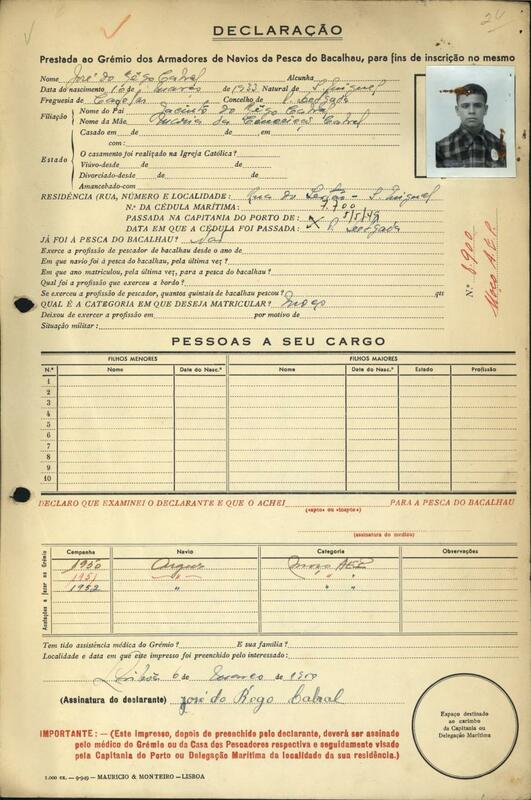 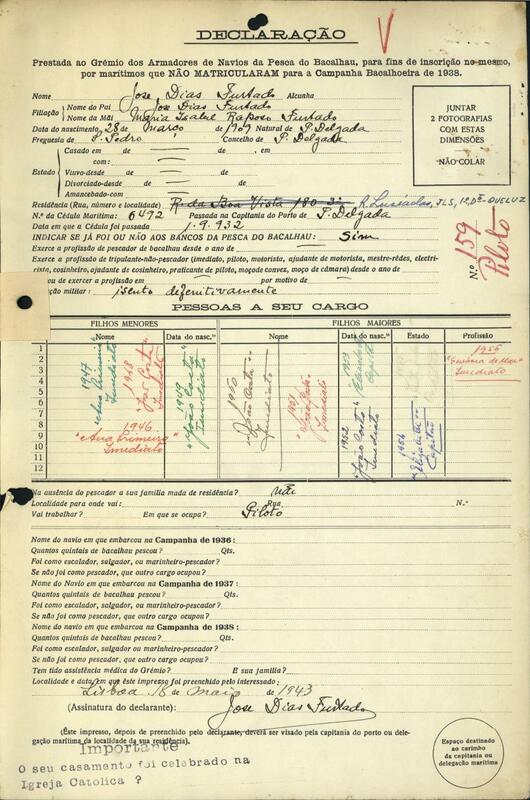 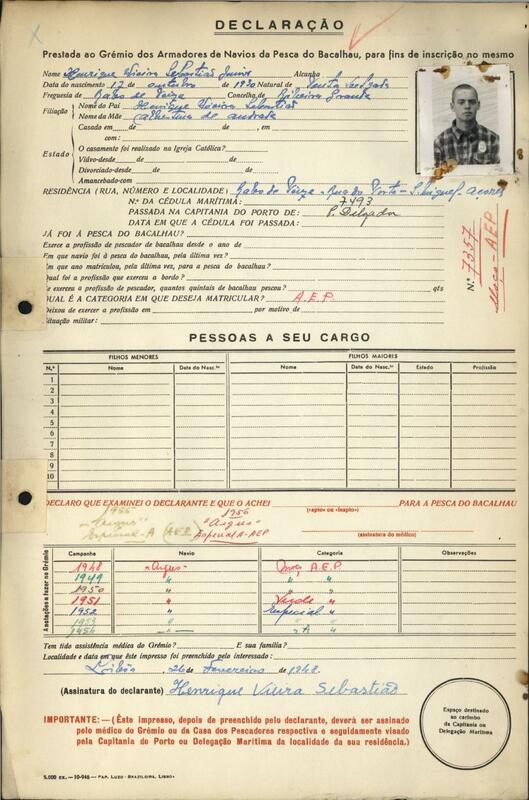 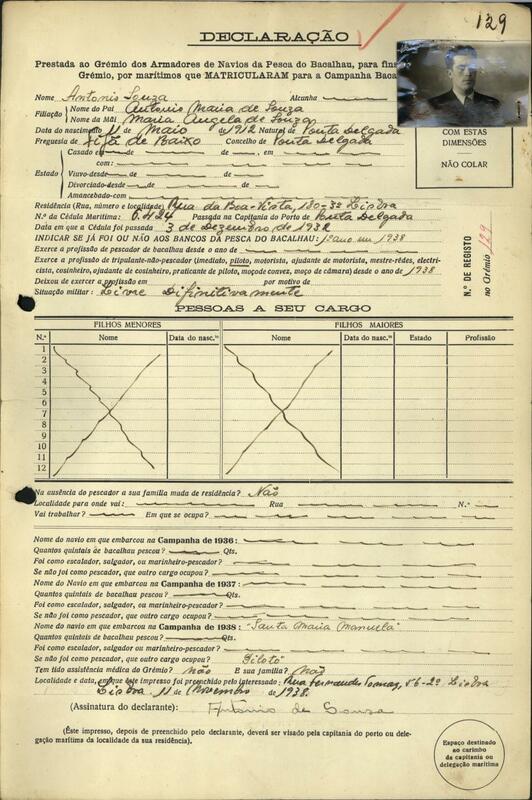 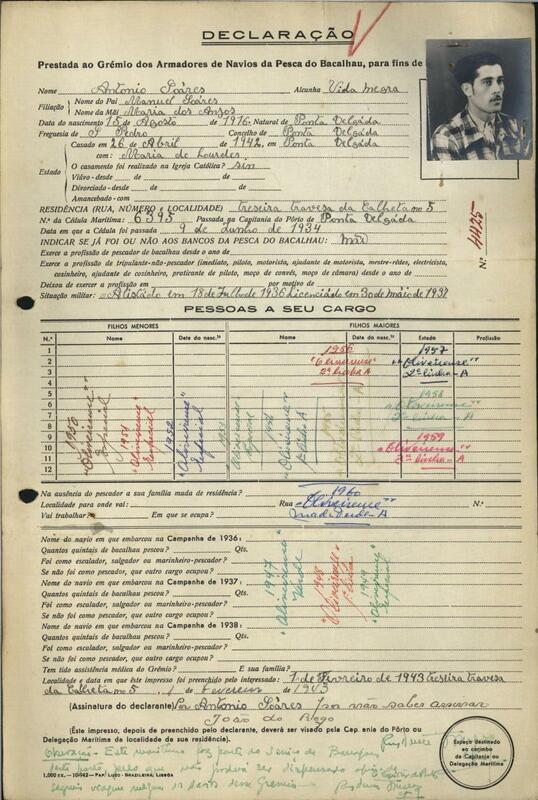 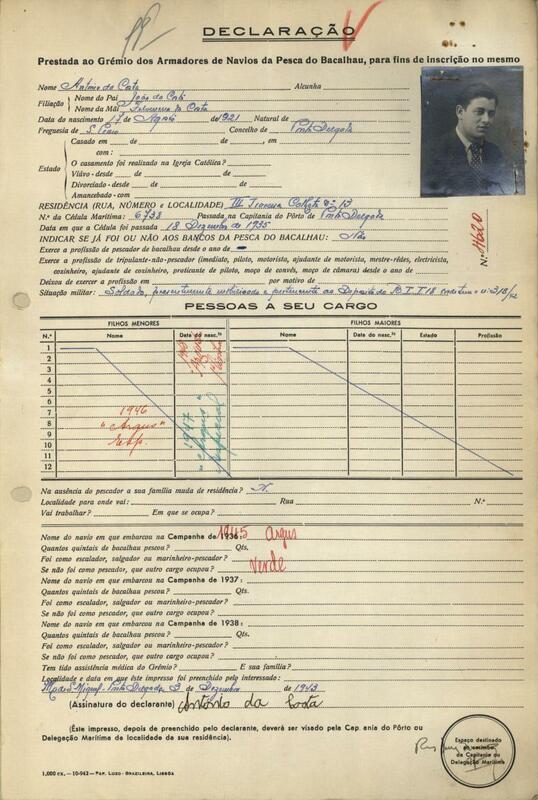 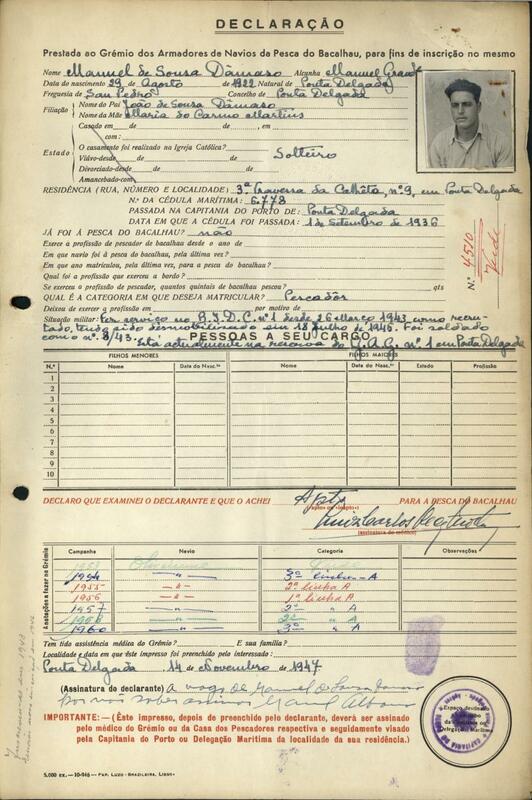 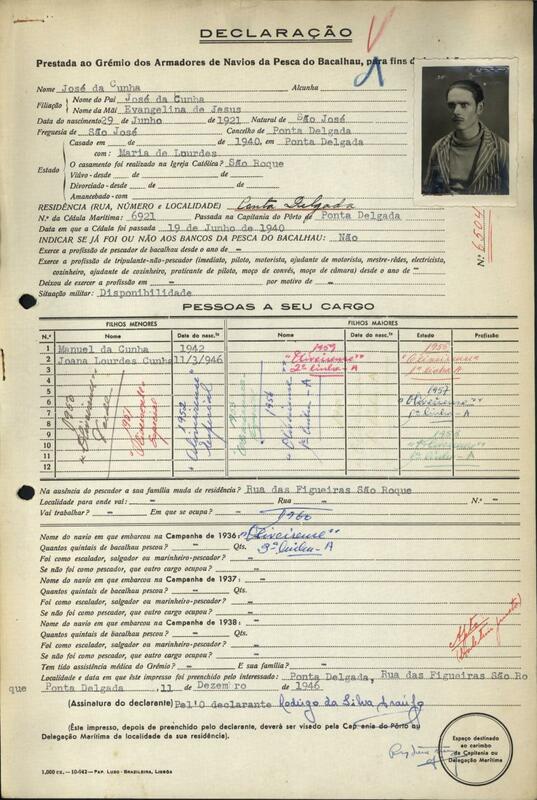 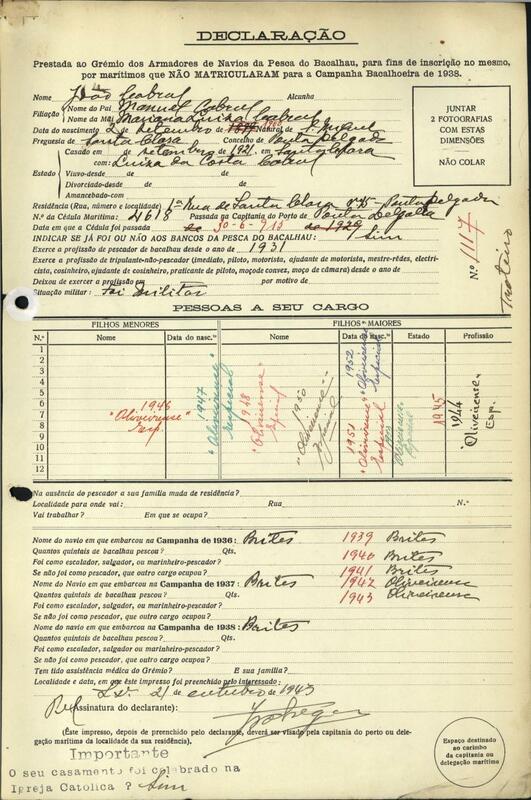 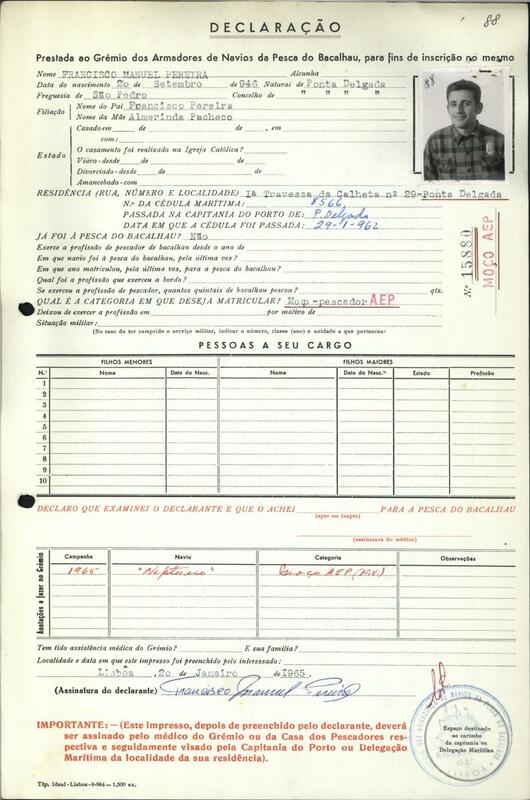 All data shown below was gathered from the original Portuguese Cod Fishing Fleet (Grèmio) registration cards, available at the Museu Maritimo de Ilhavo web site. 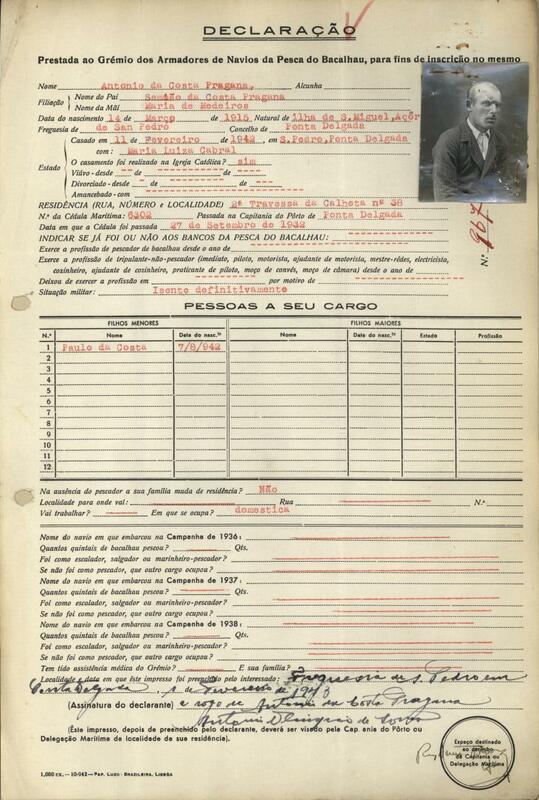 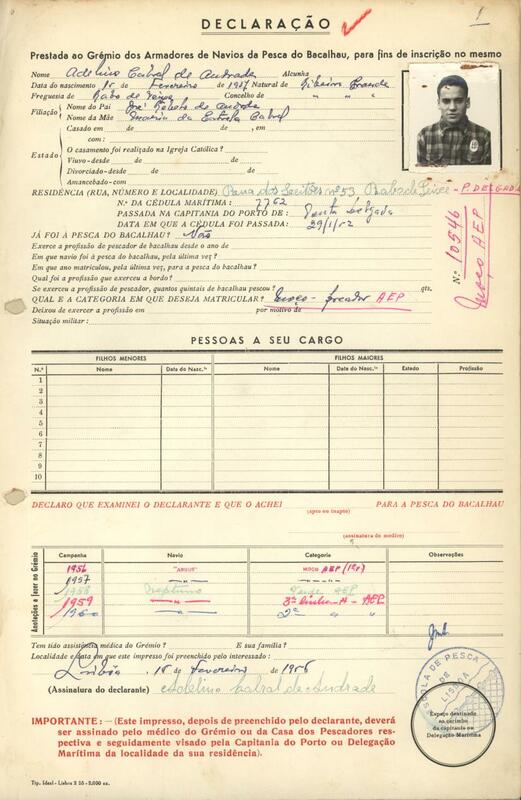 The original Grèmio registration cards were donated to the Museu Maritimo de Ilhavo and made available to the general public through their web site. 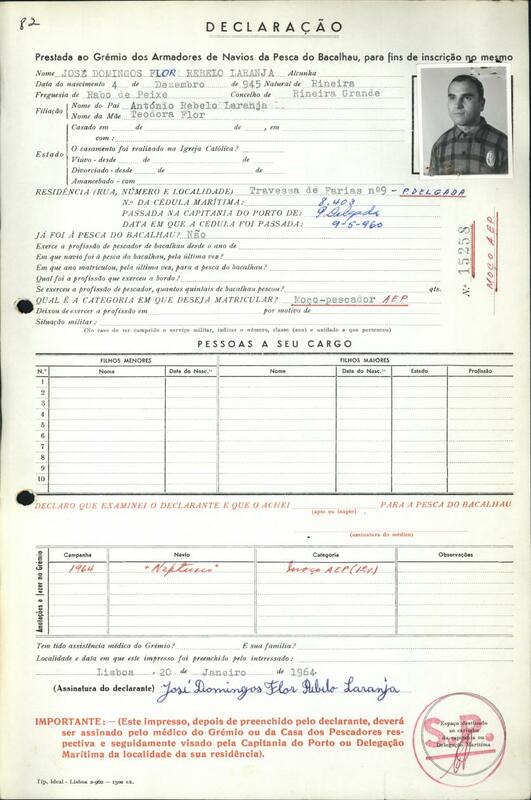 The search feature of the Portuguese Cod Fishermen database is somewhat limited to it's search results returned, this is due to the limited museum staff available to work on the database. 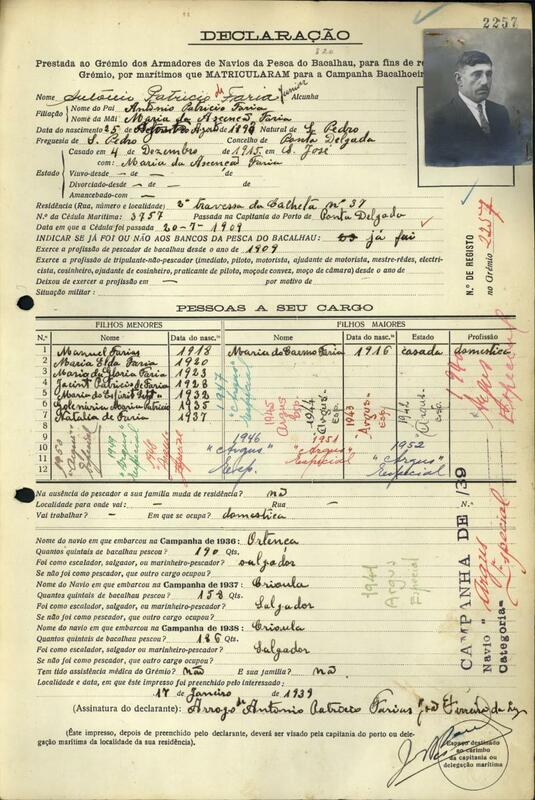 The staff at the Museu Maritimo de Ilhavo are working very hard and doing an excellent job and continue to update the database on a timely manner. 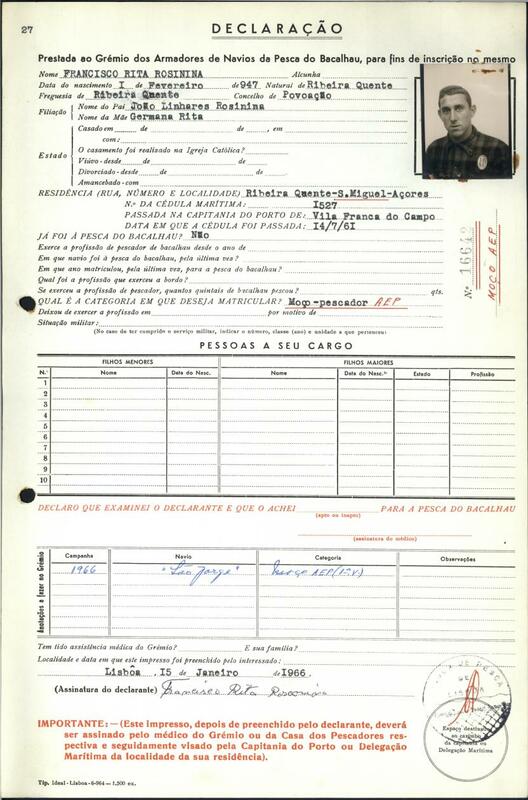 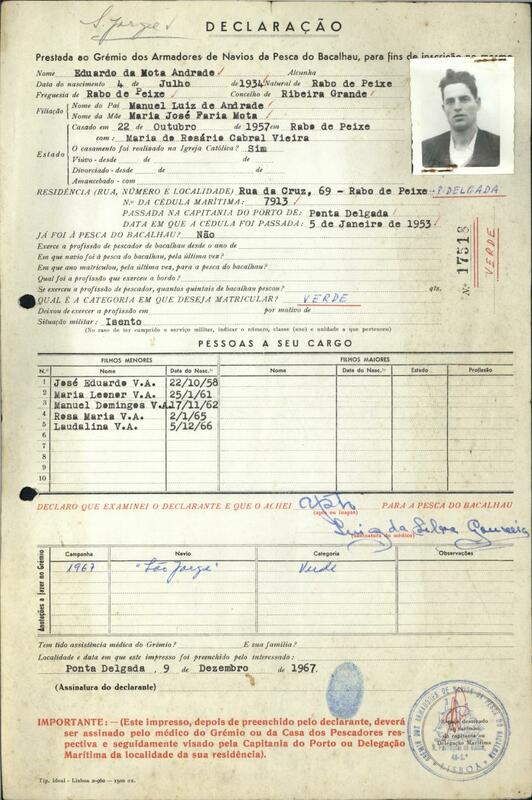 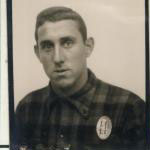 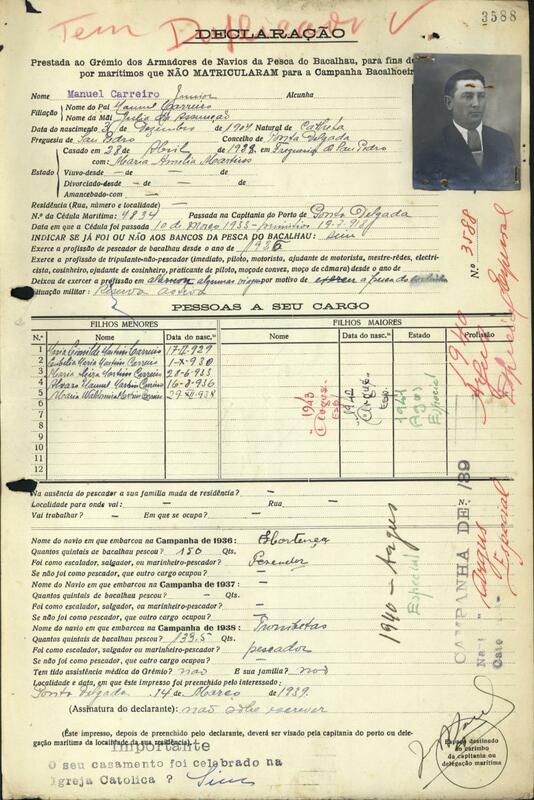 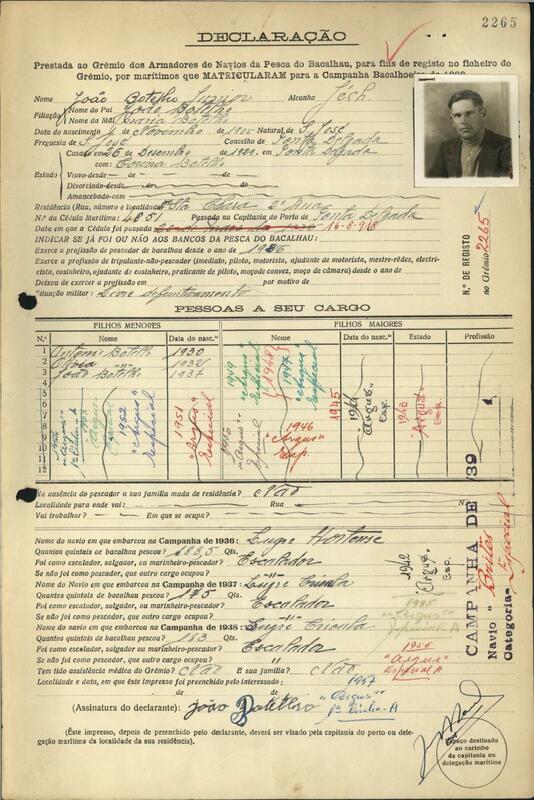 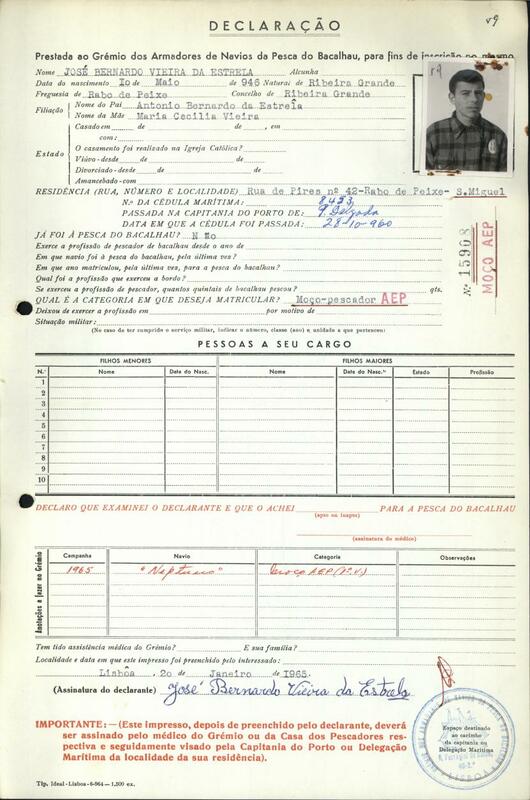 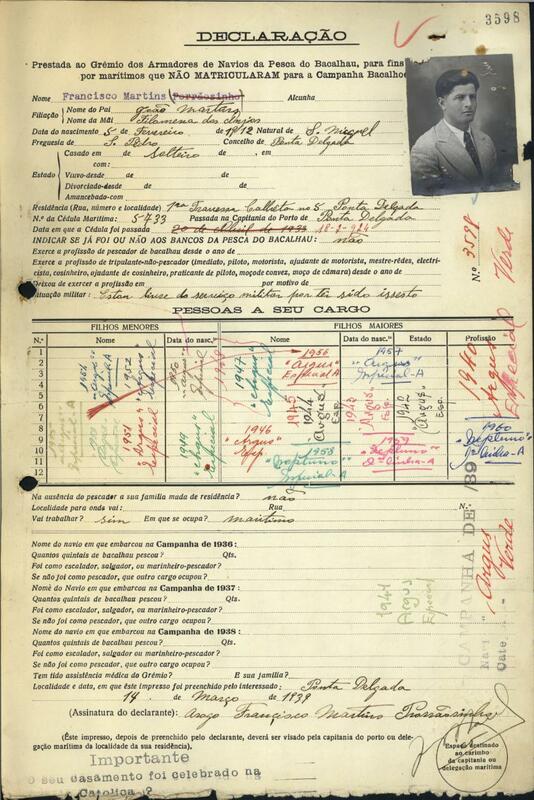 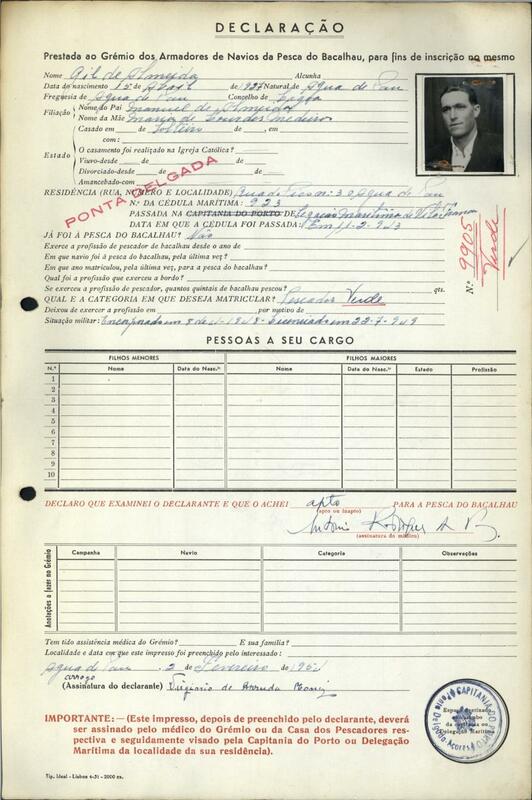 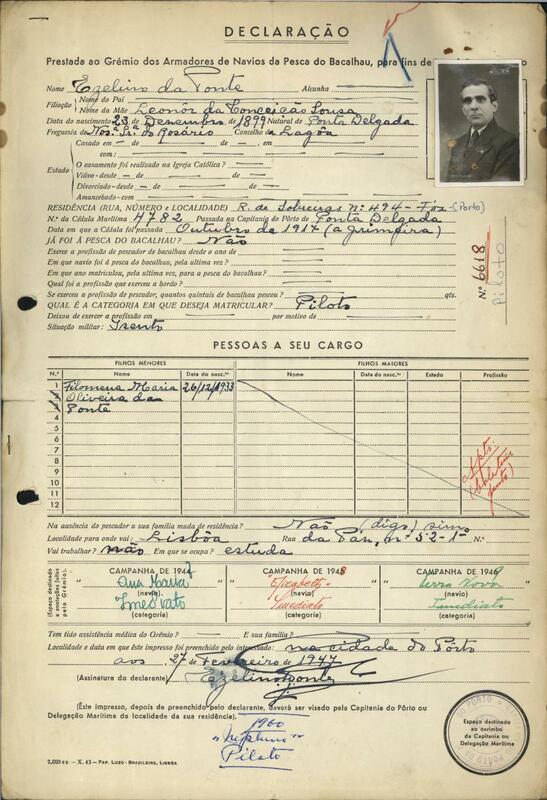 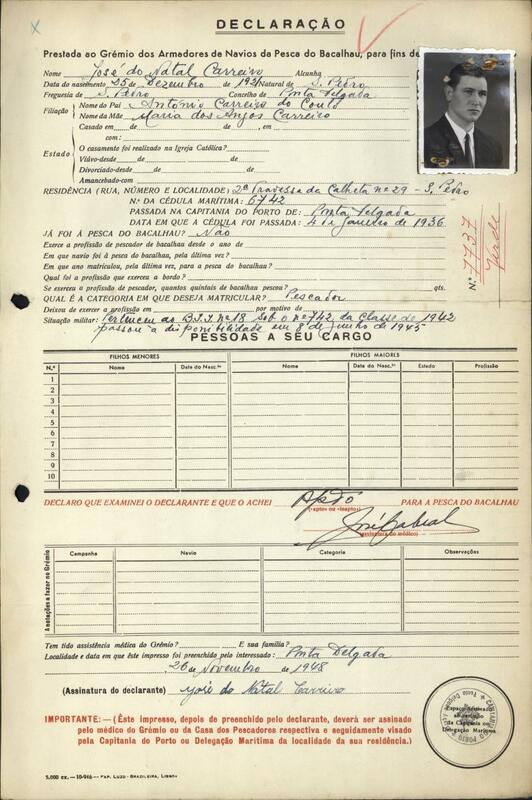 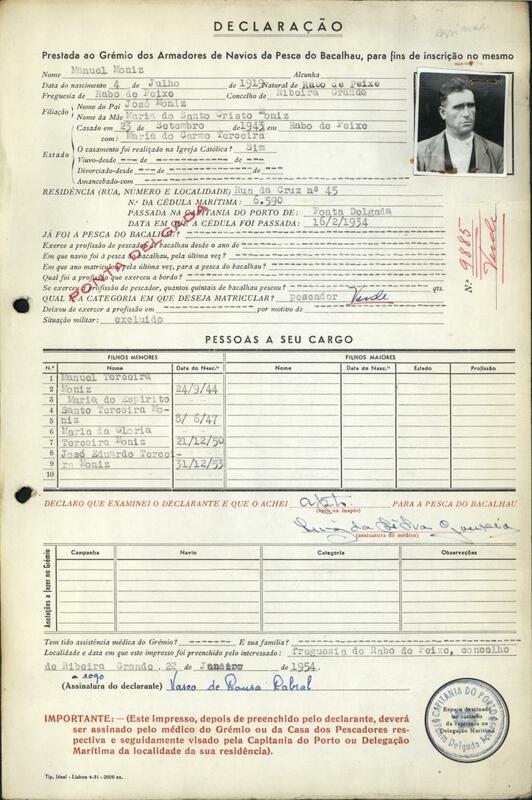 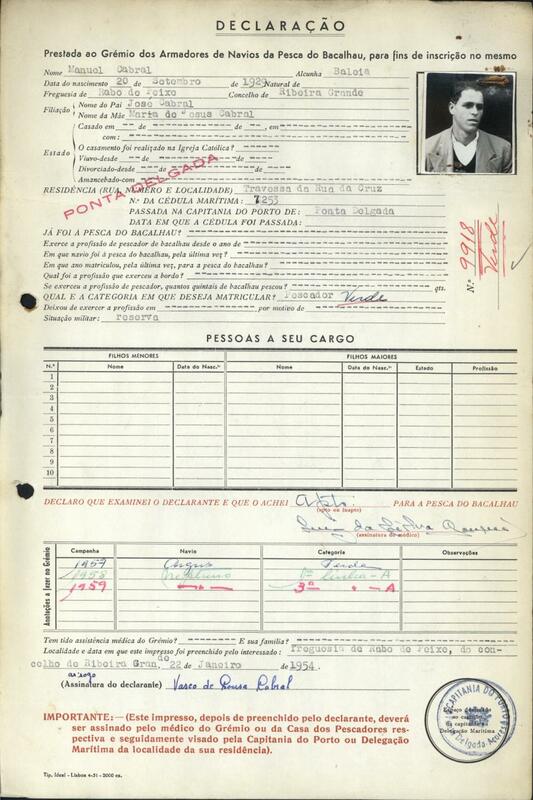 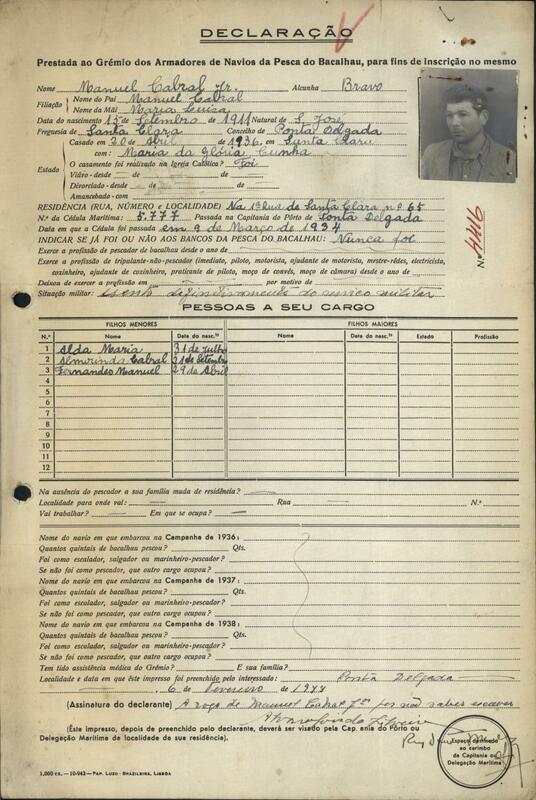 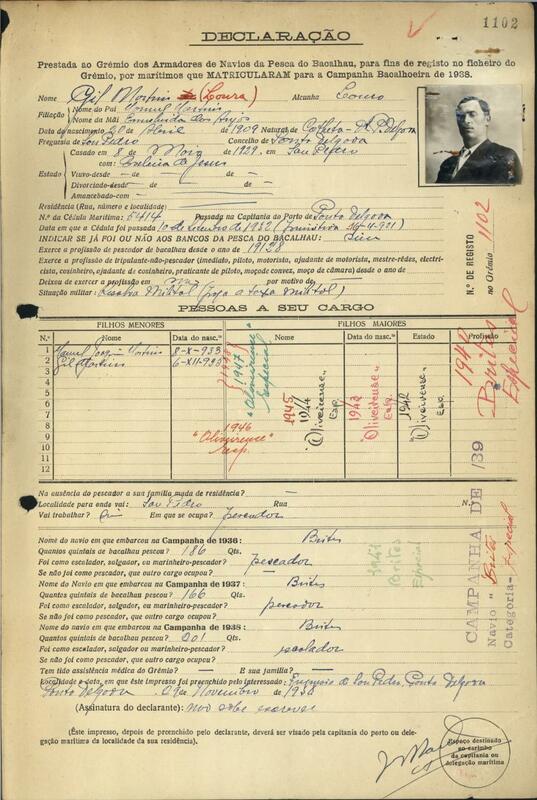 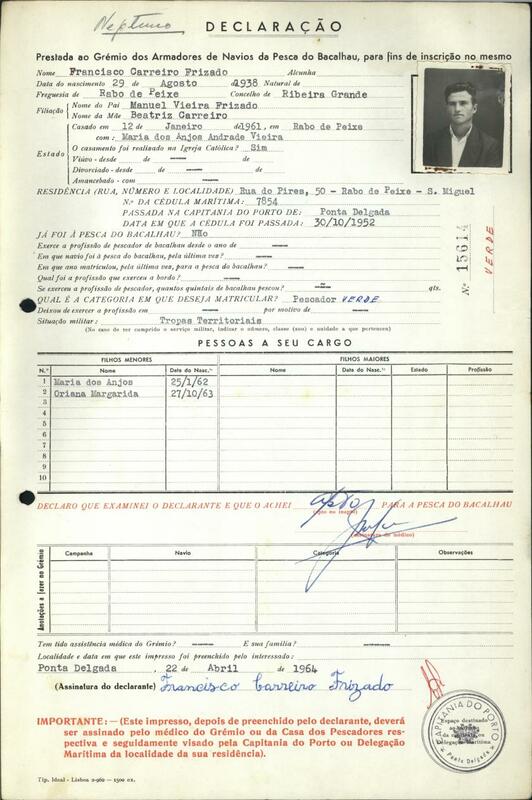 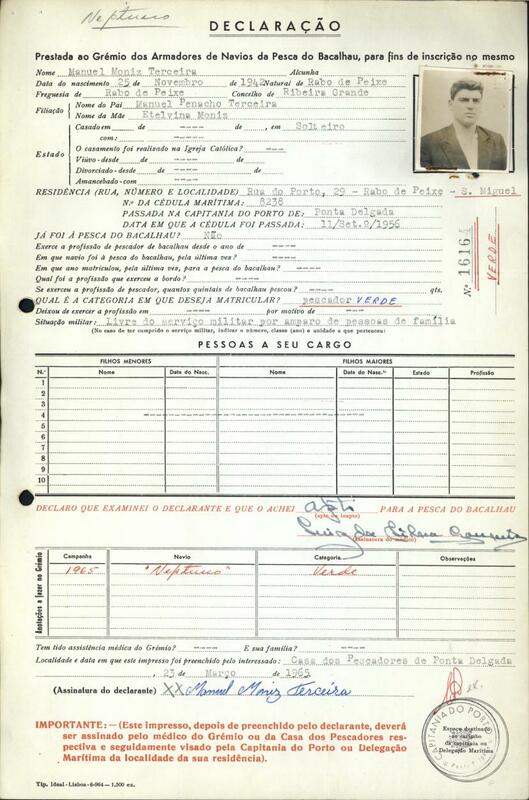 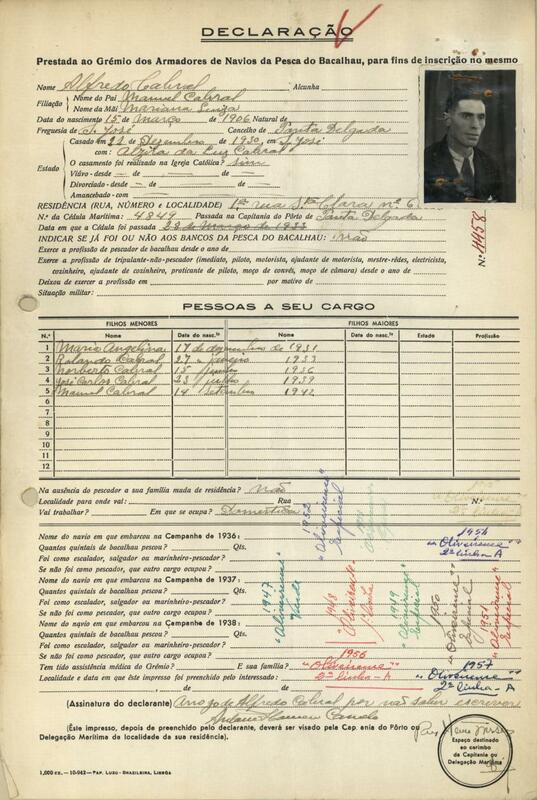 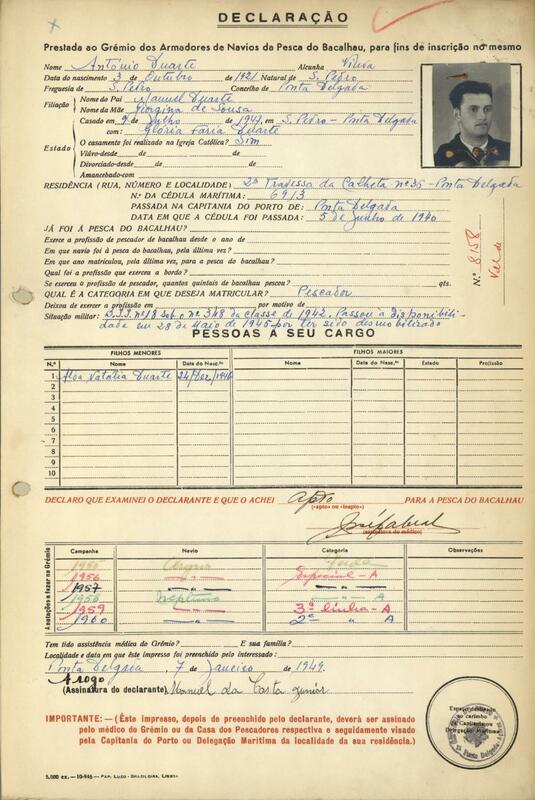 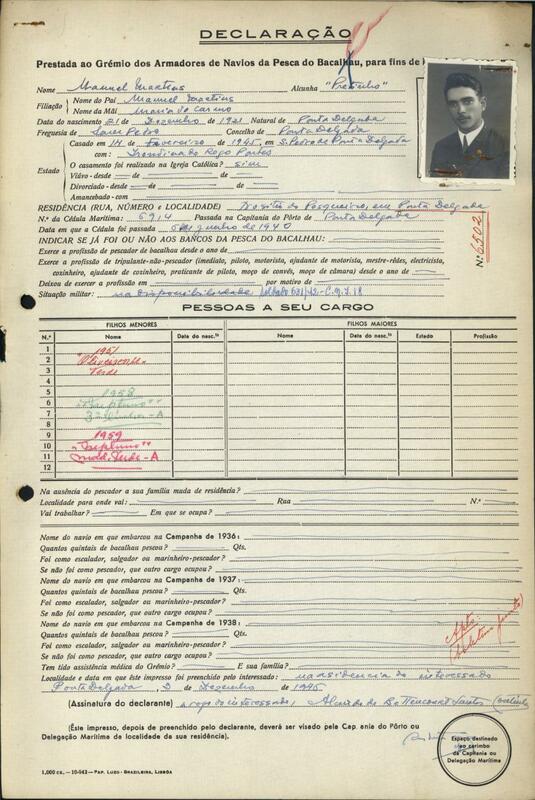 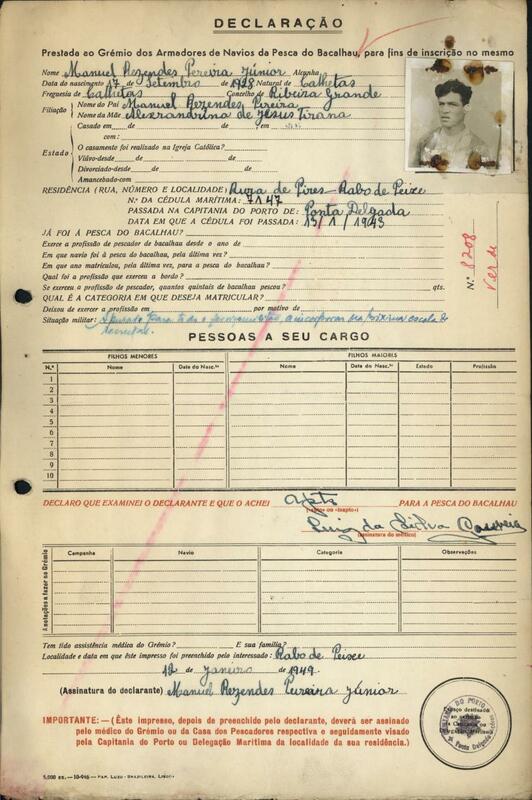 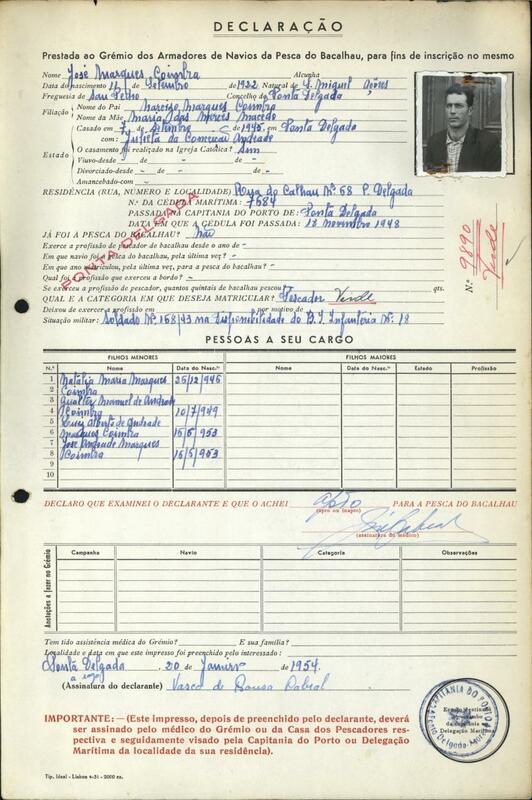 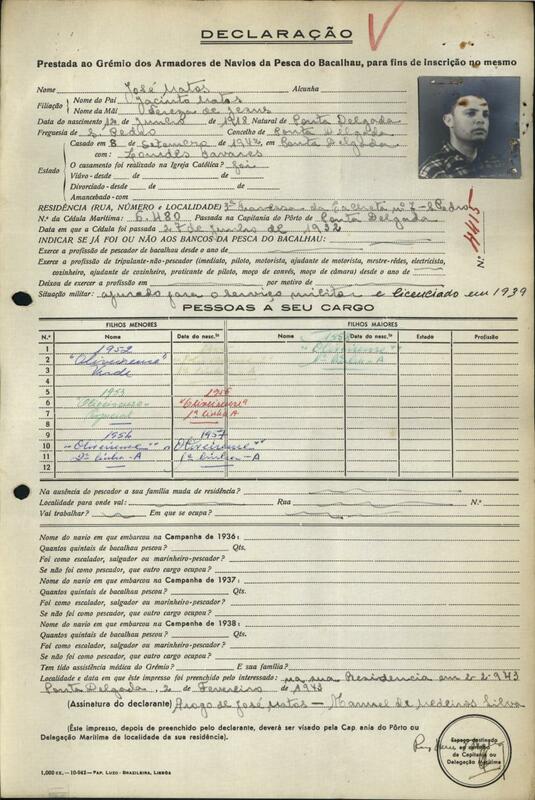 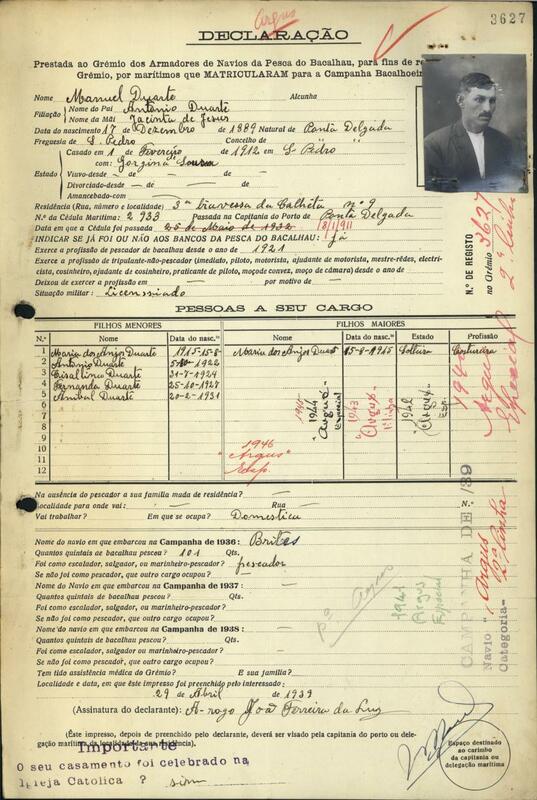 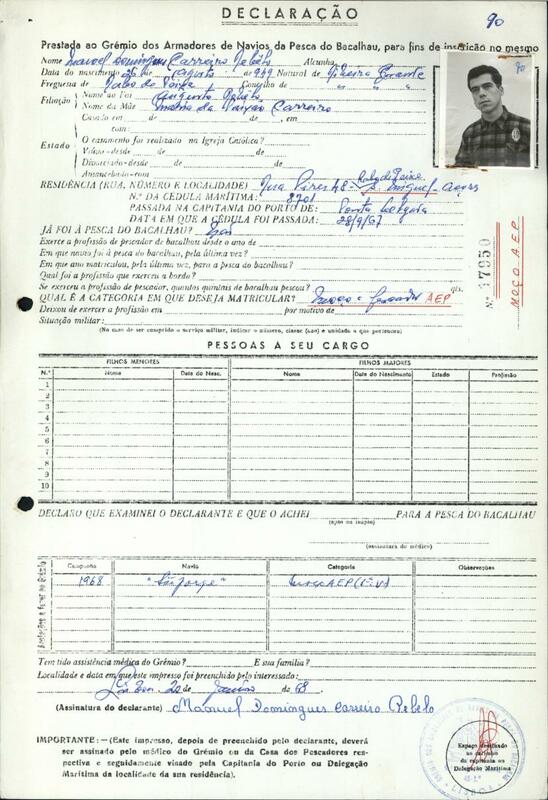 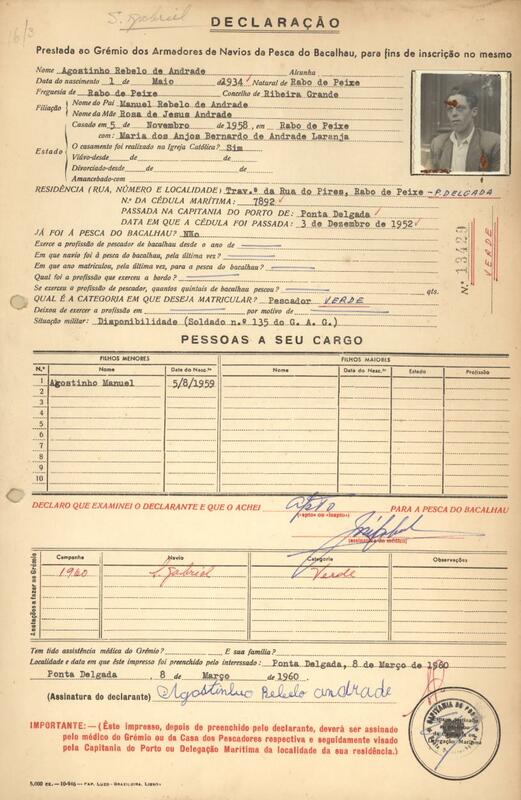 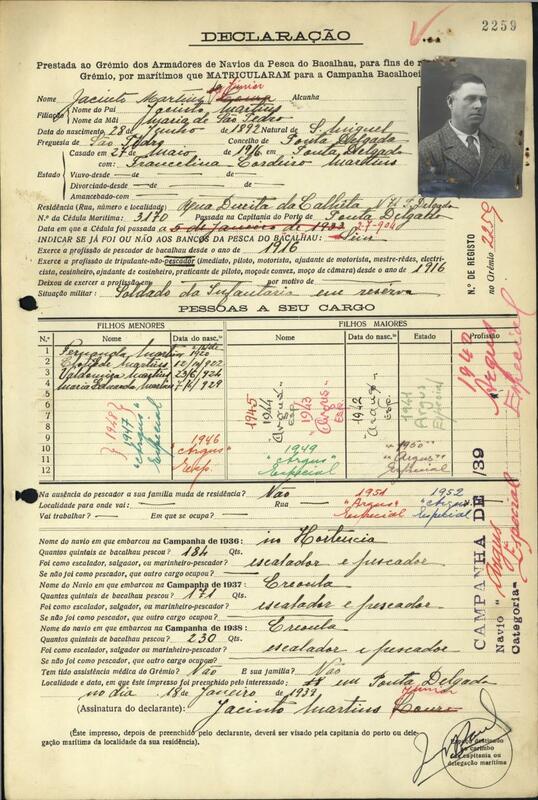 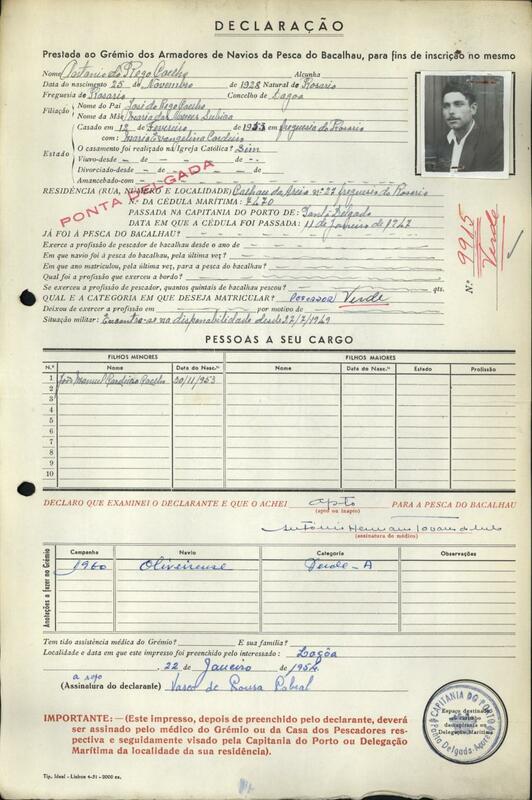 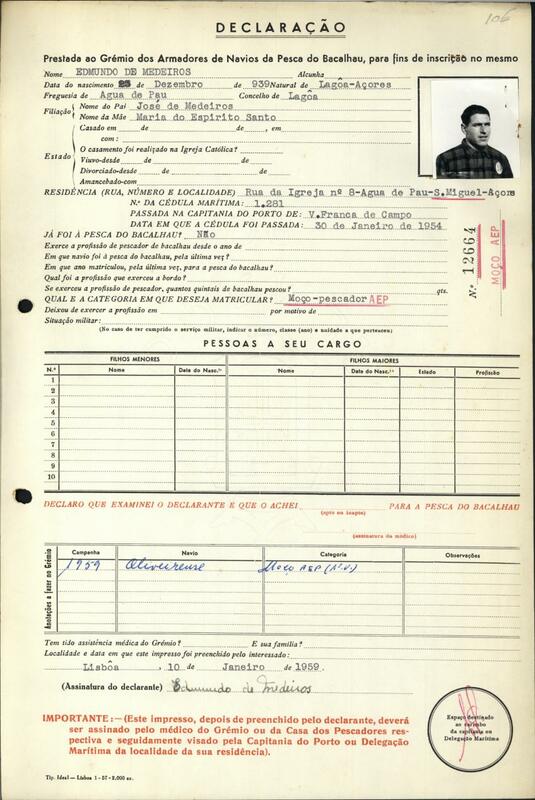 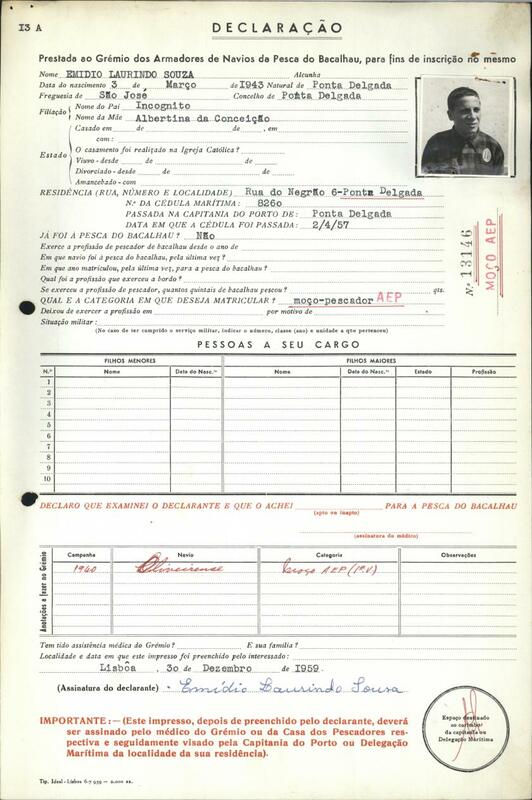 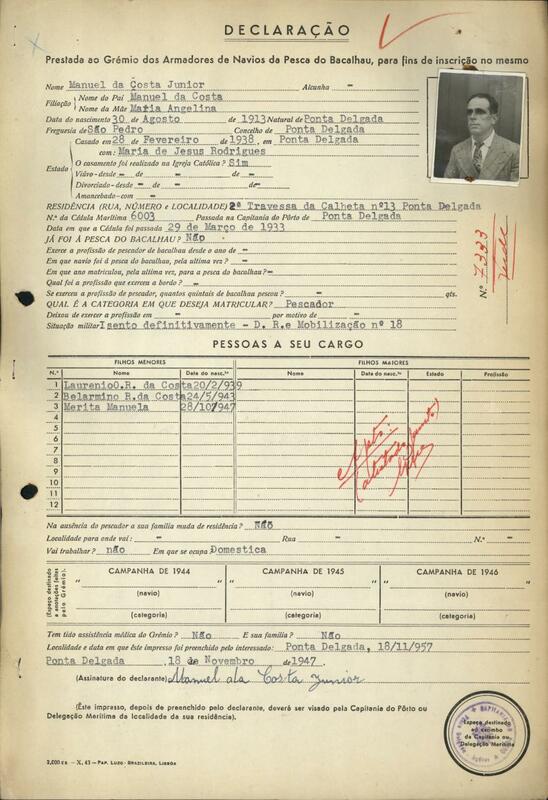 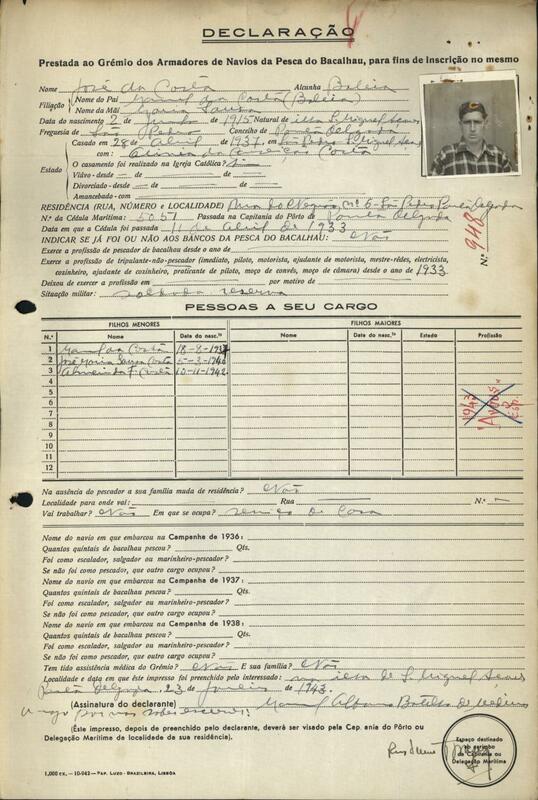 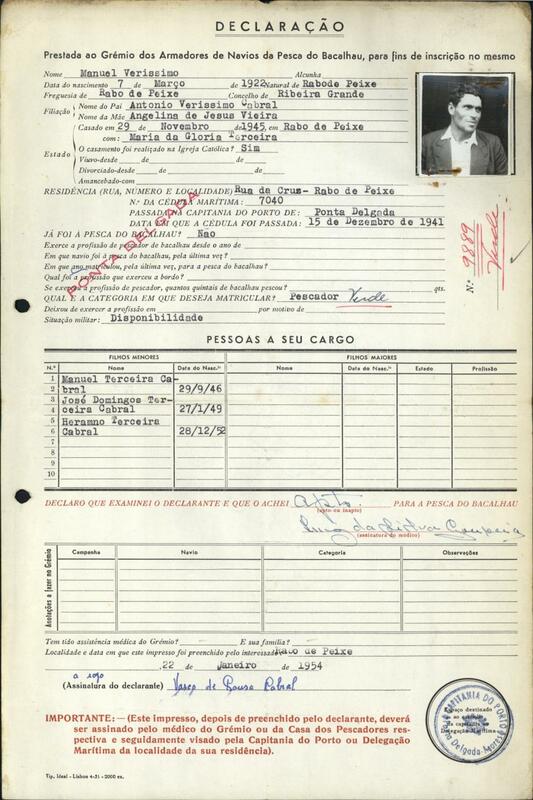 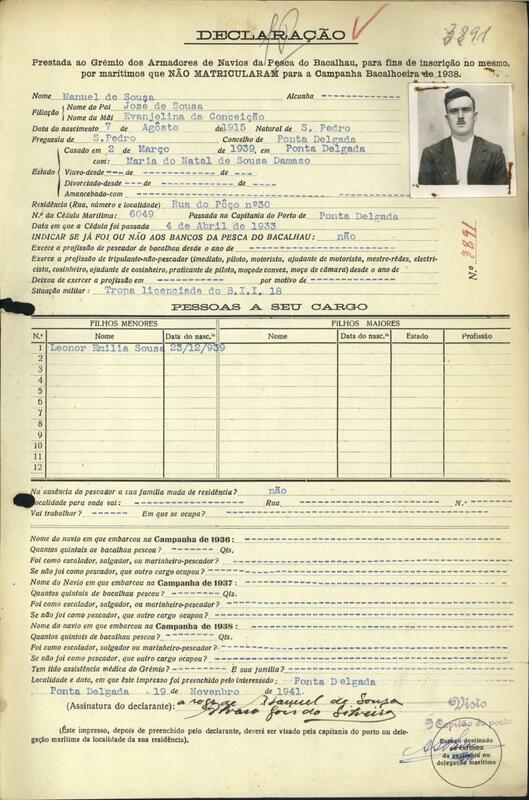 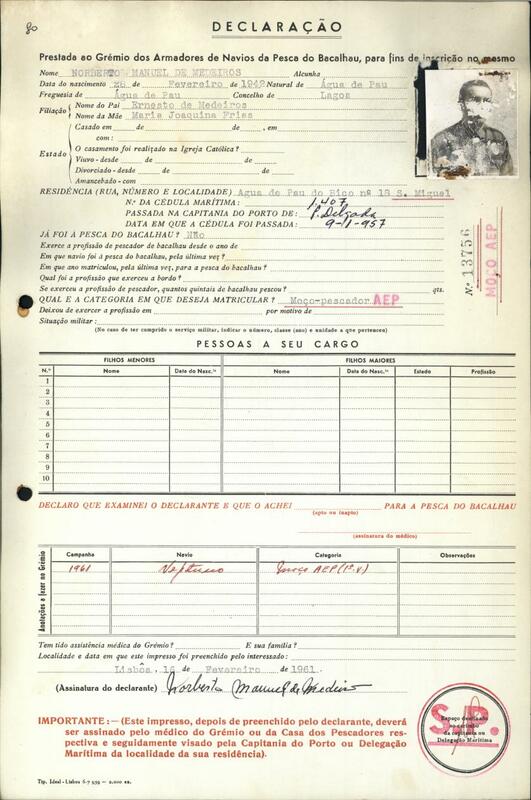 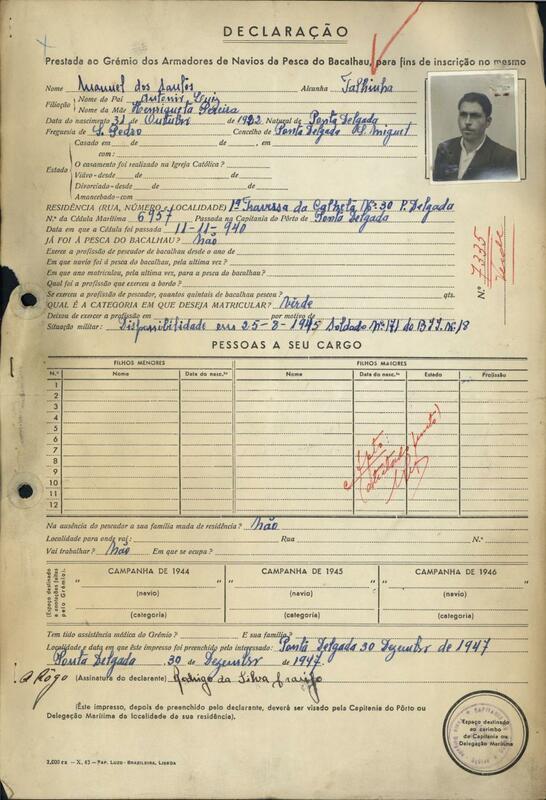 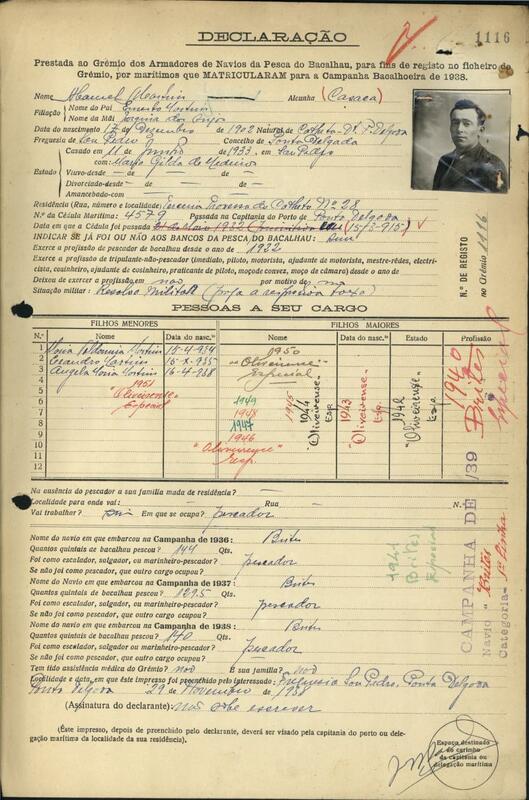 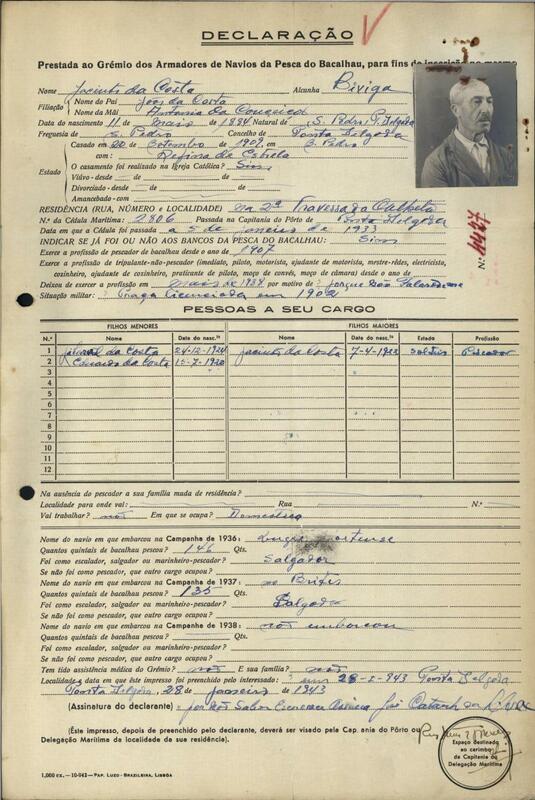 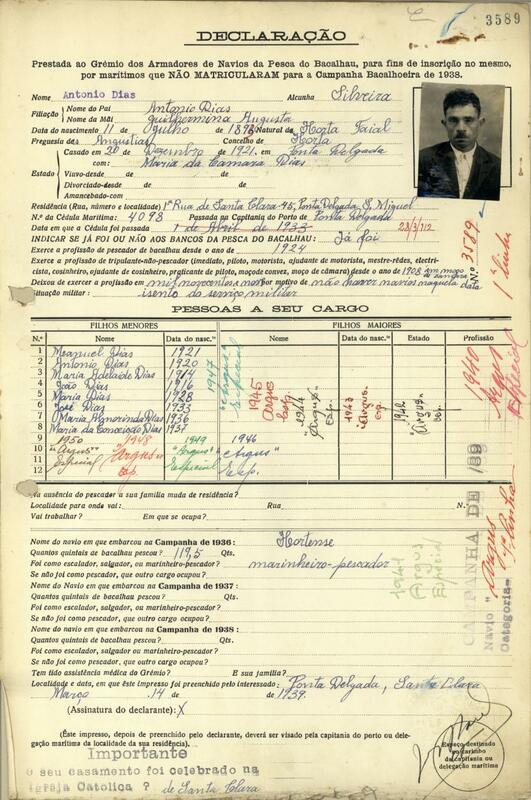 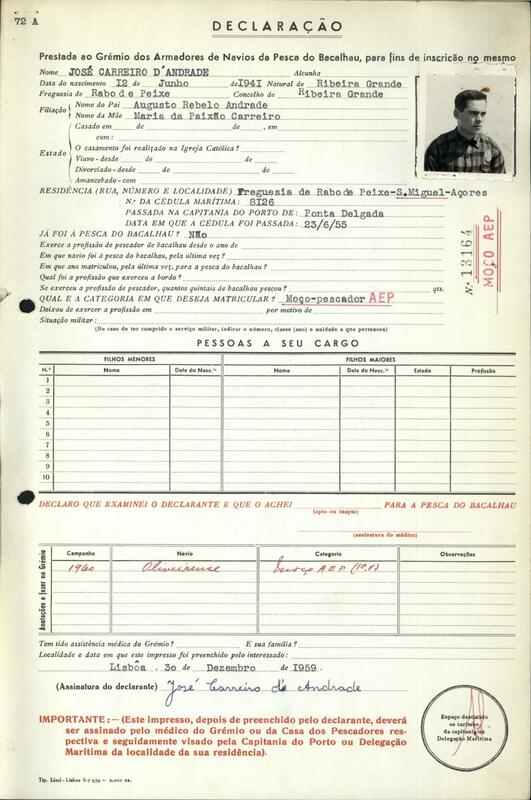 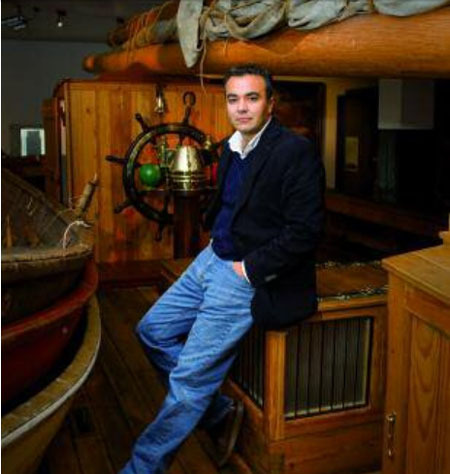 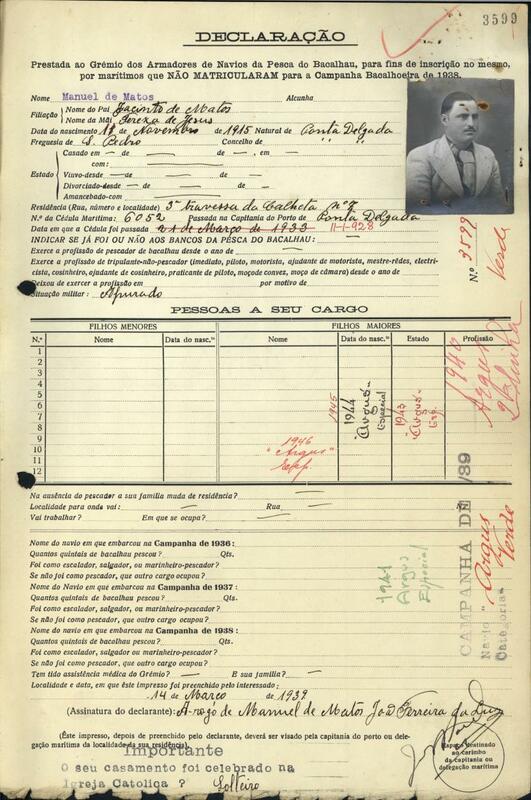 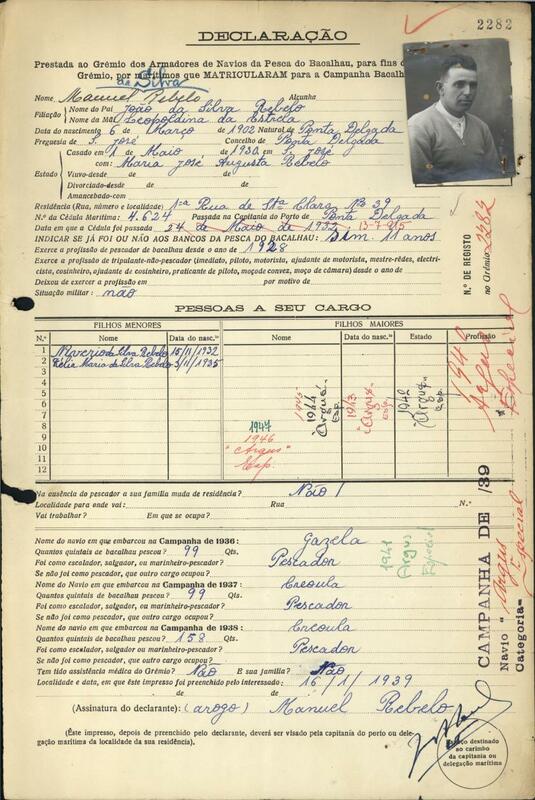 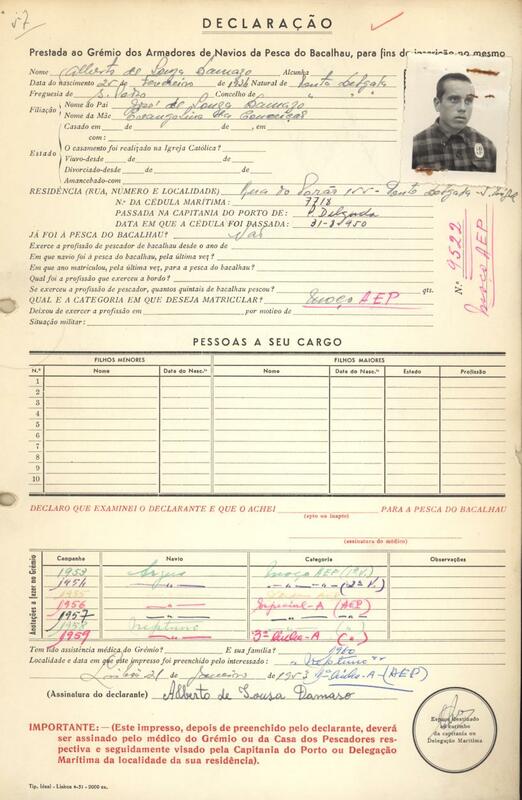 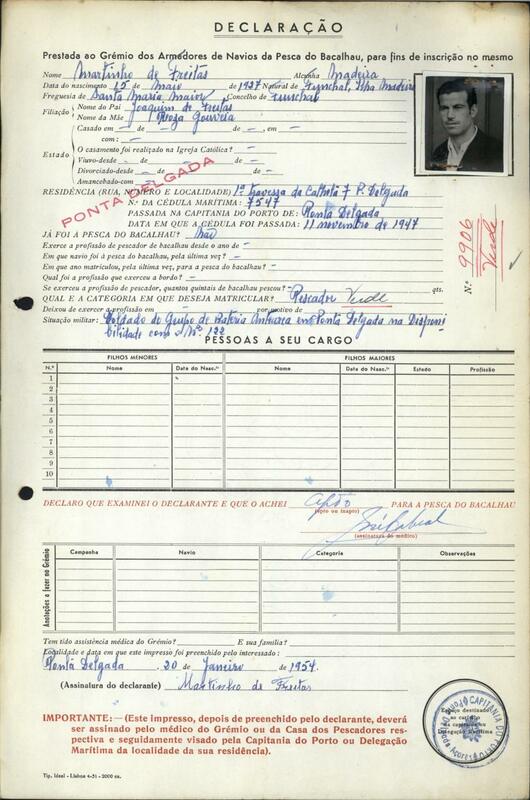 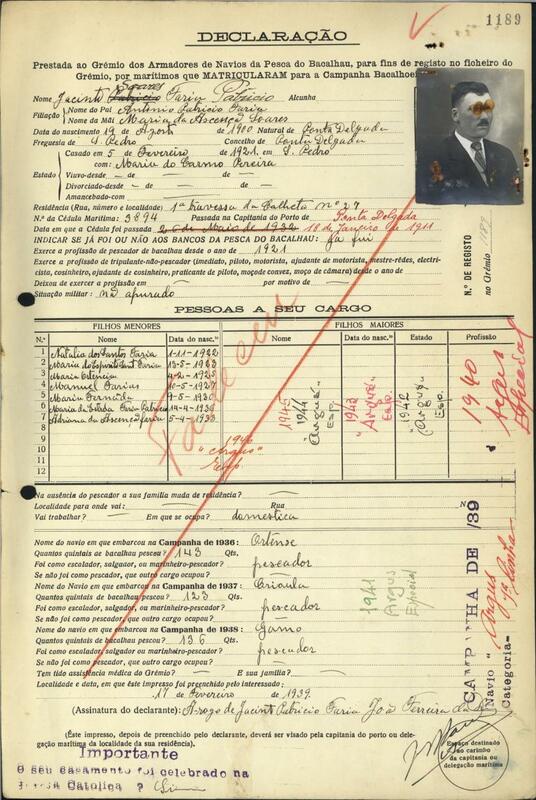 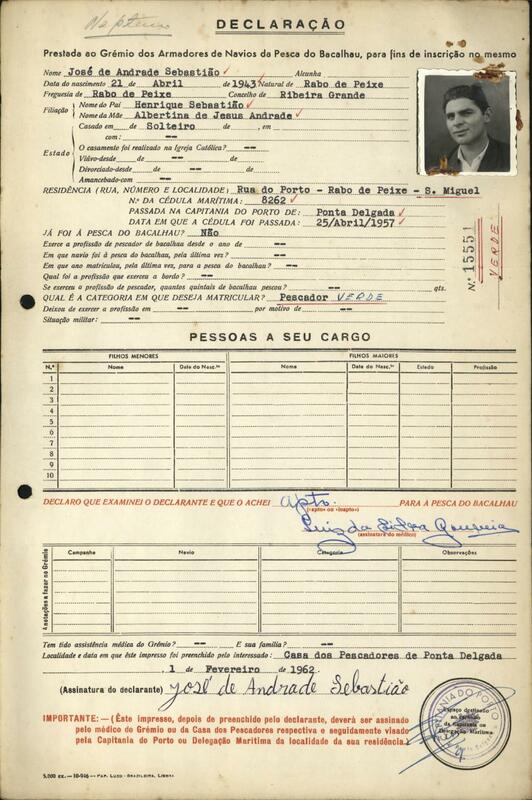 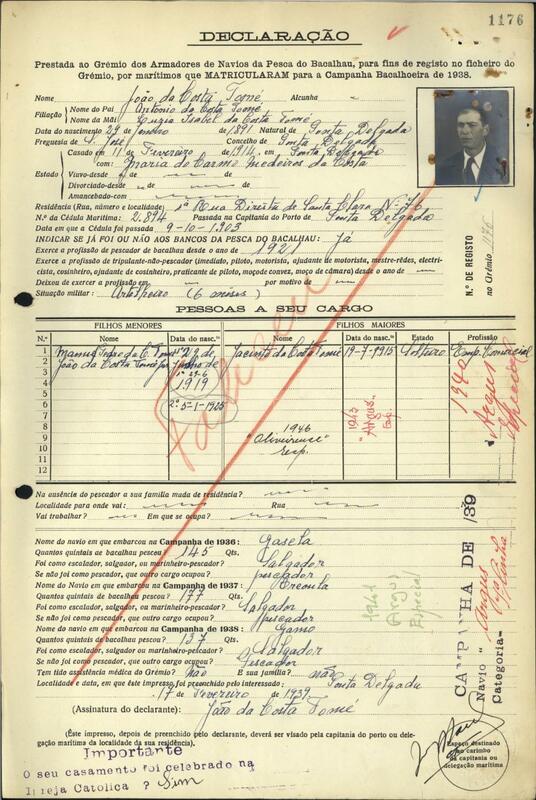 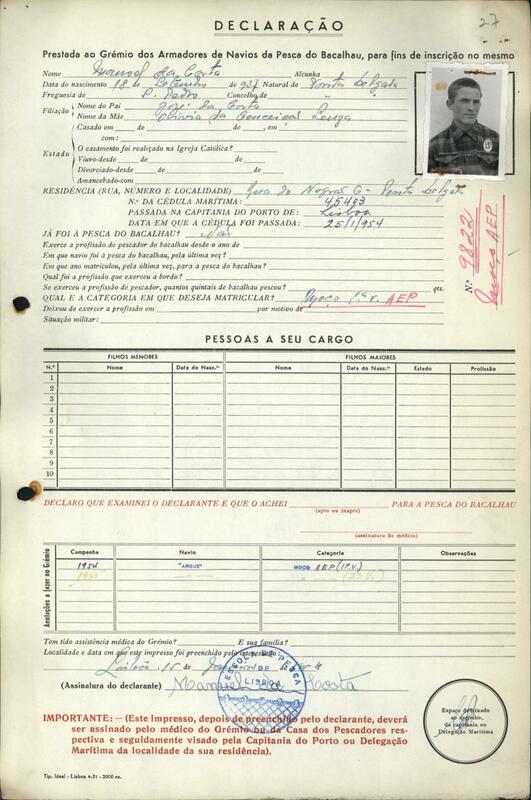 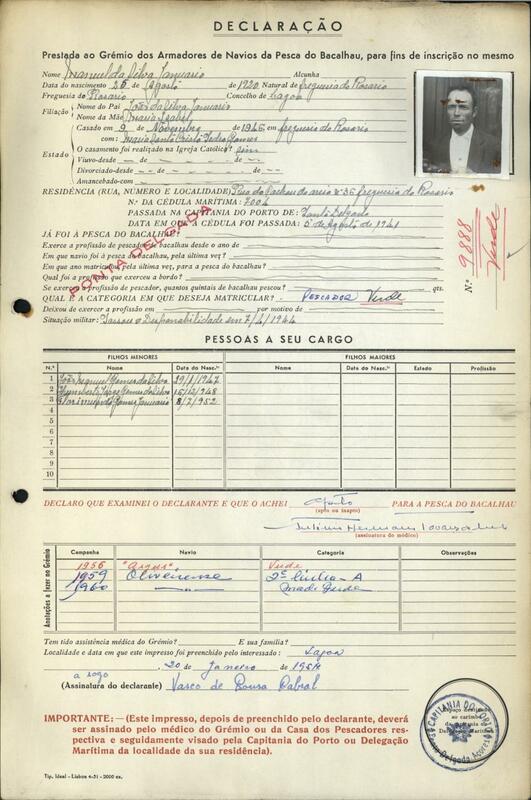 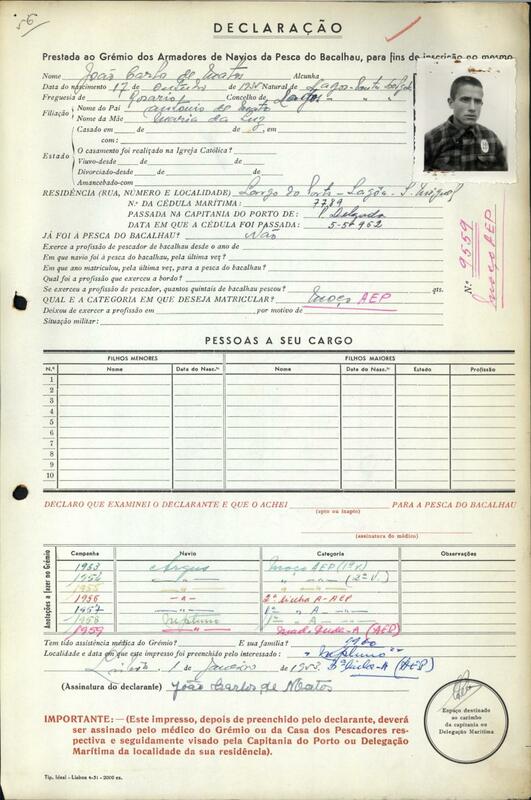 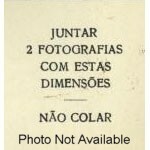 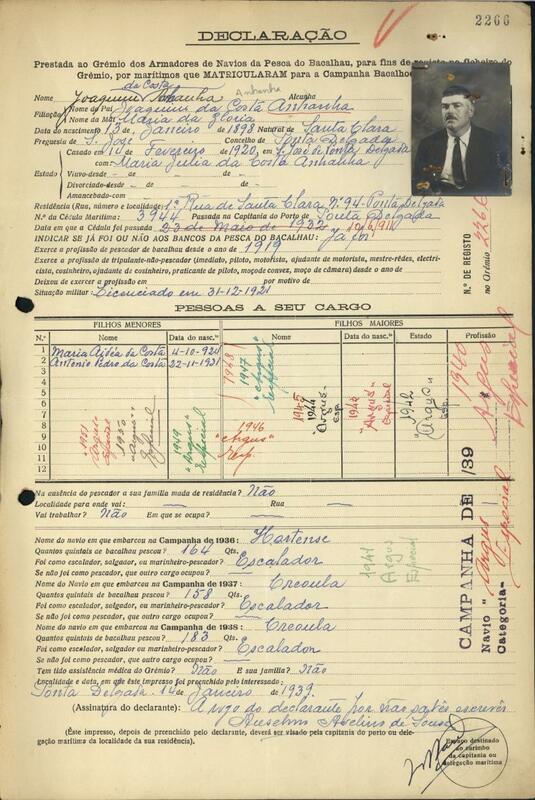 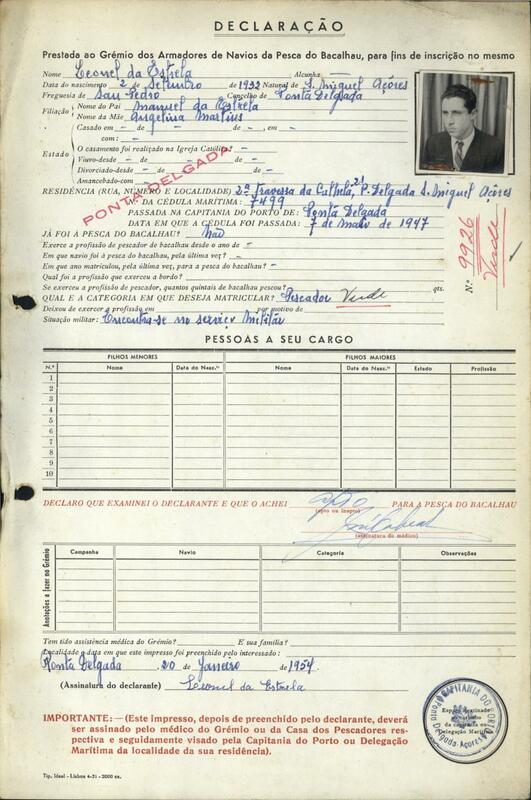 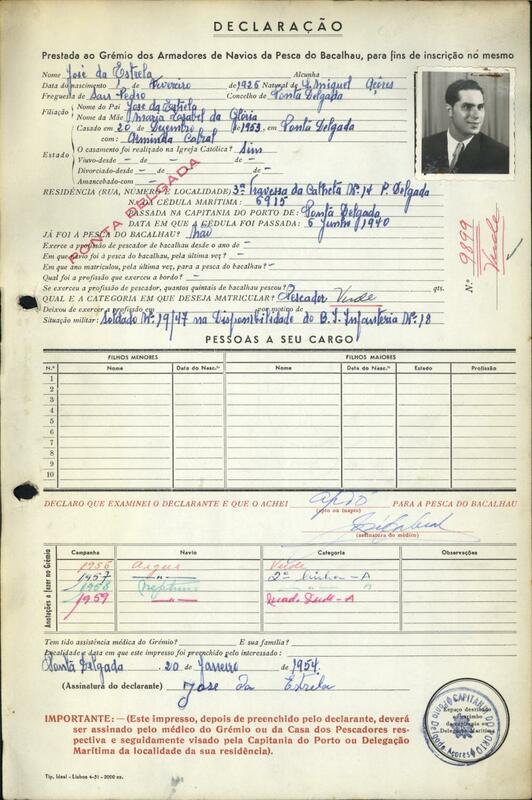 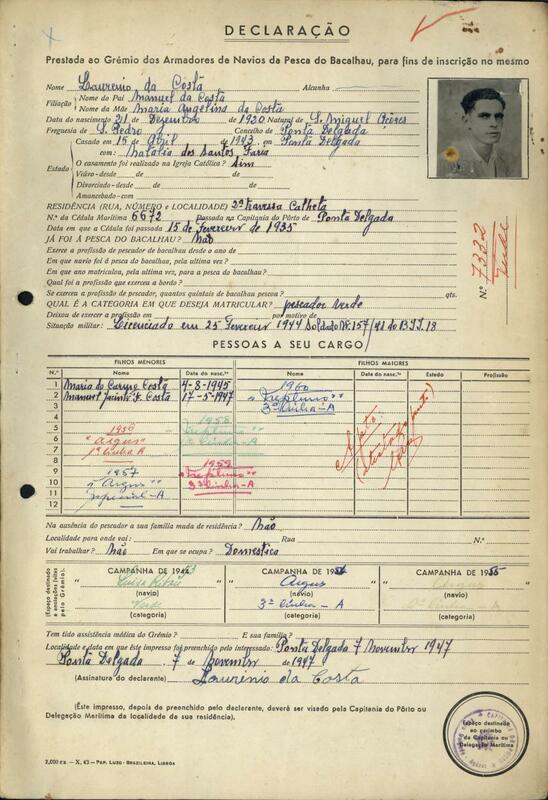 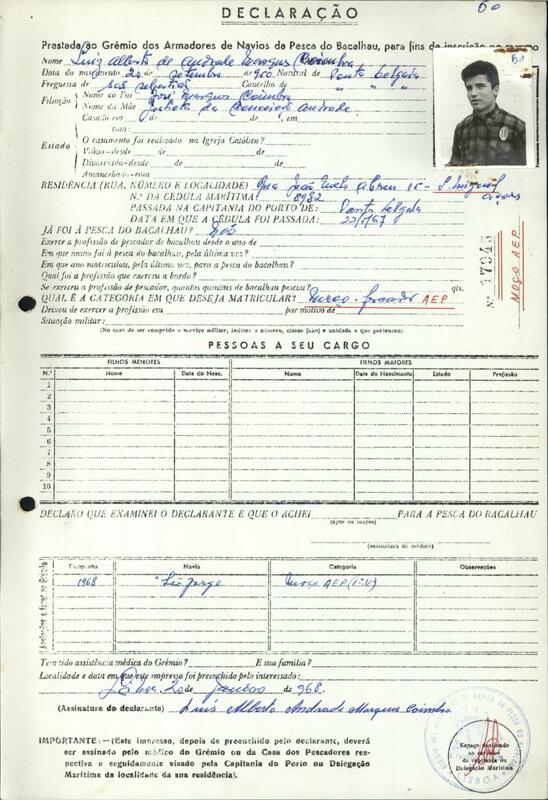 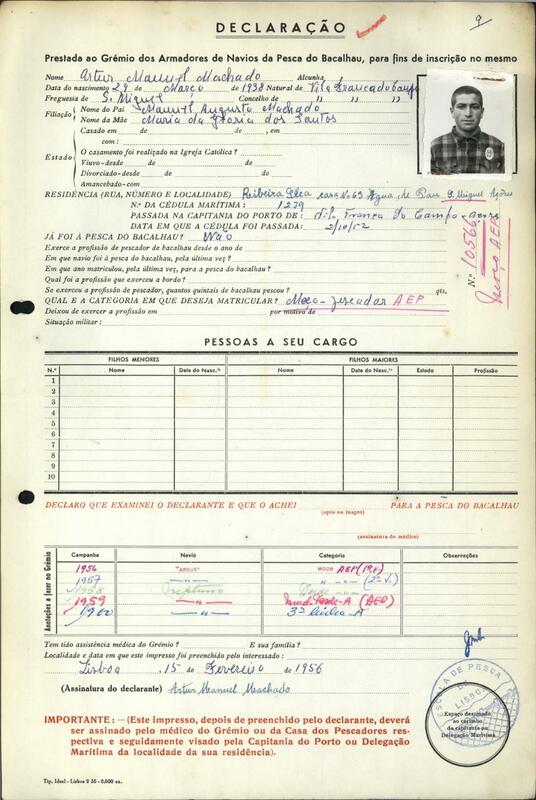 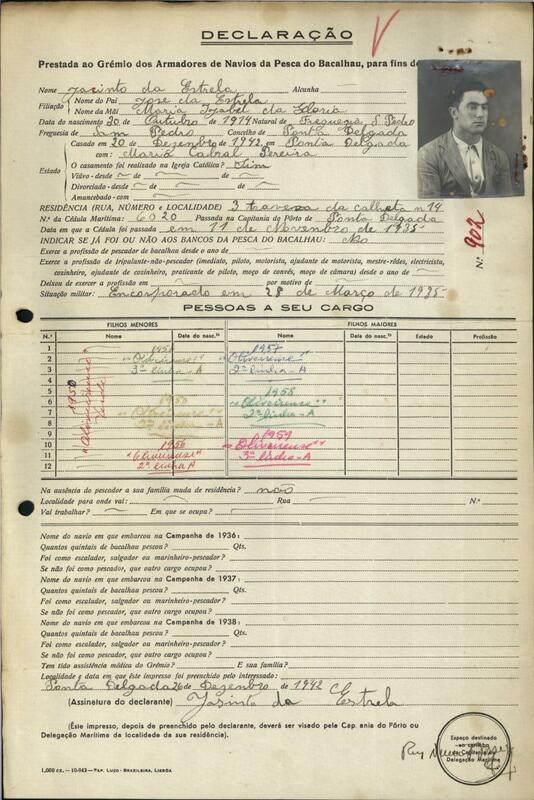 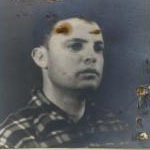 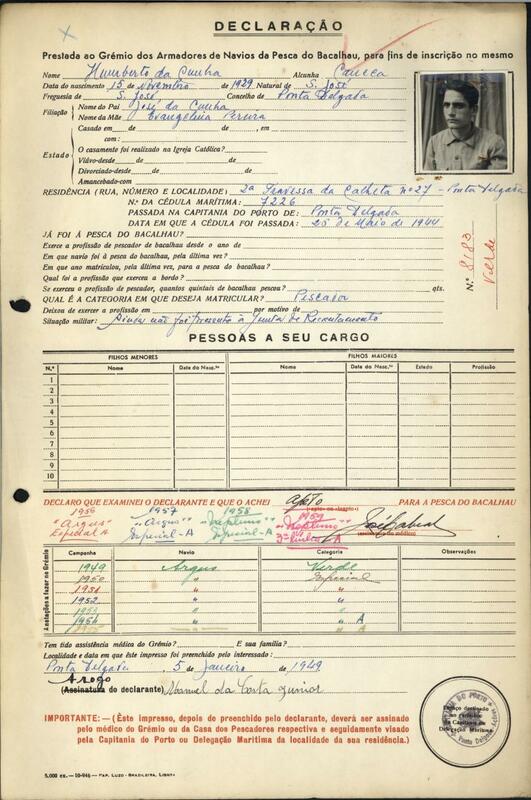 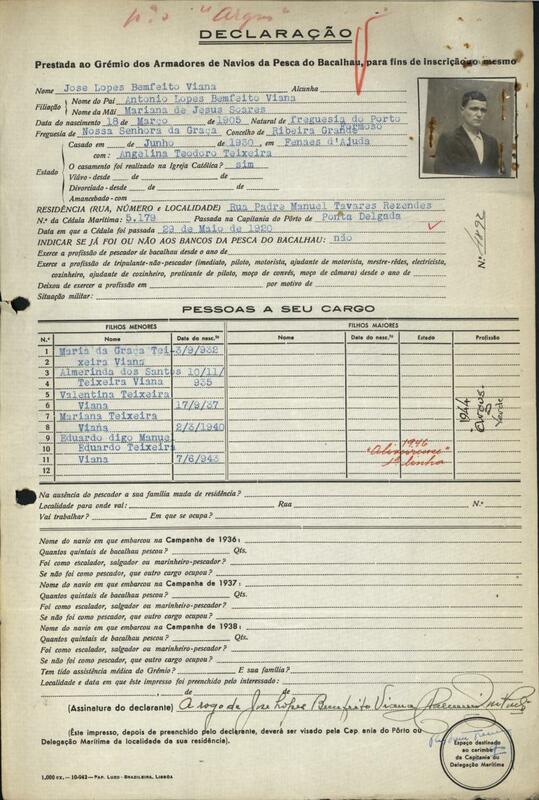 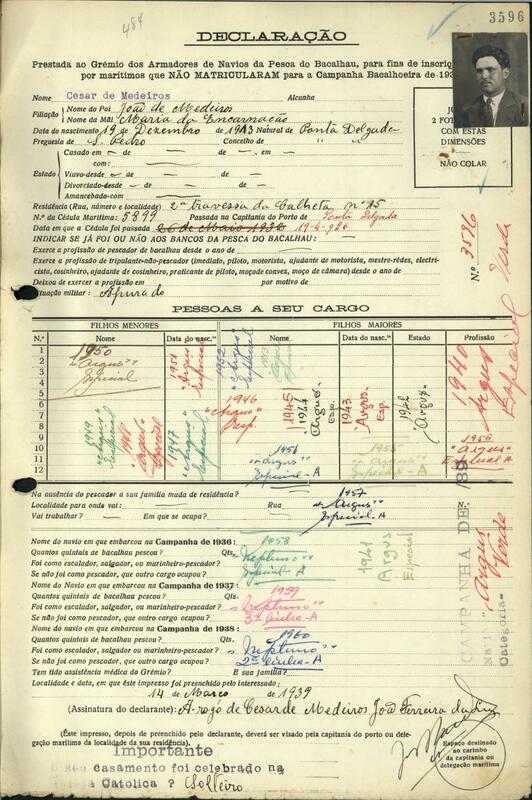 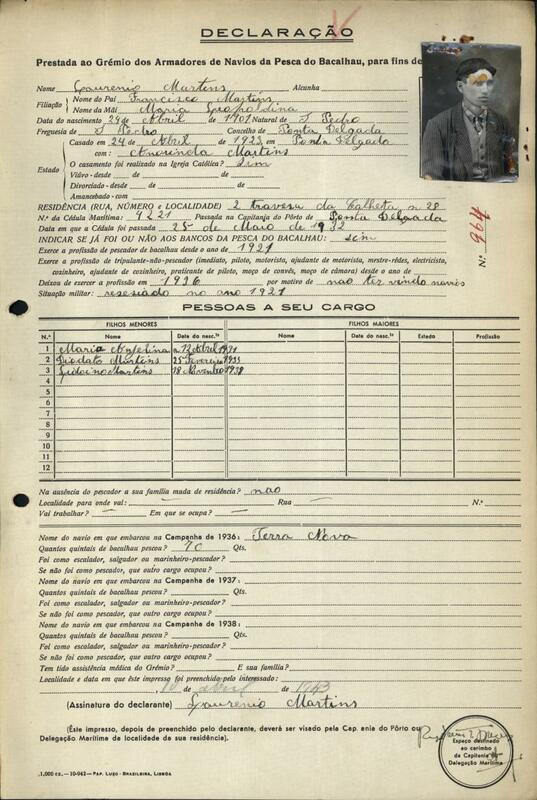 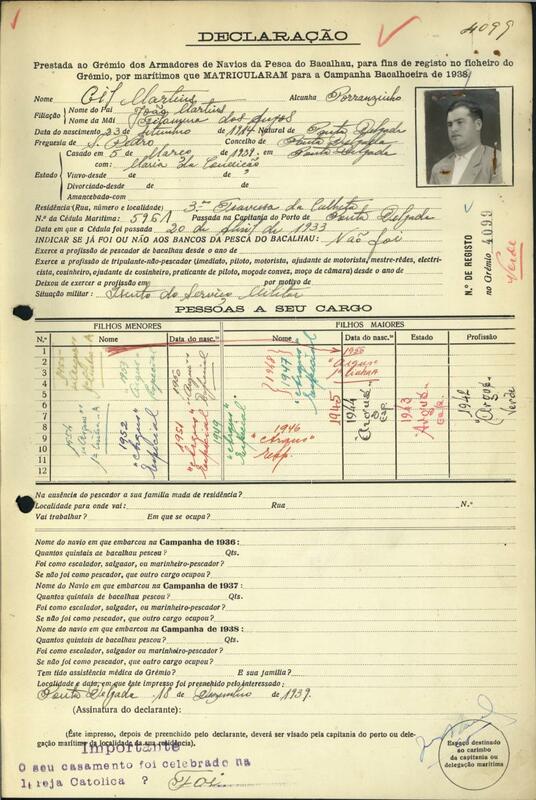 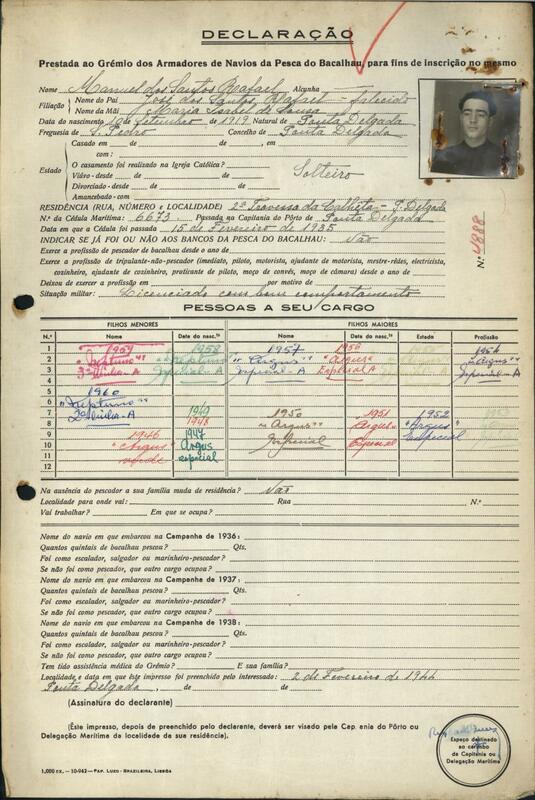 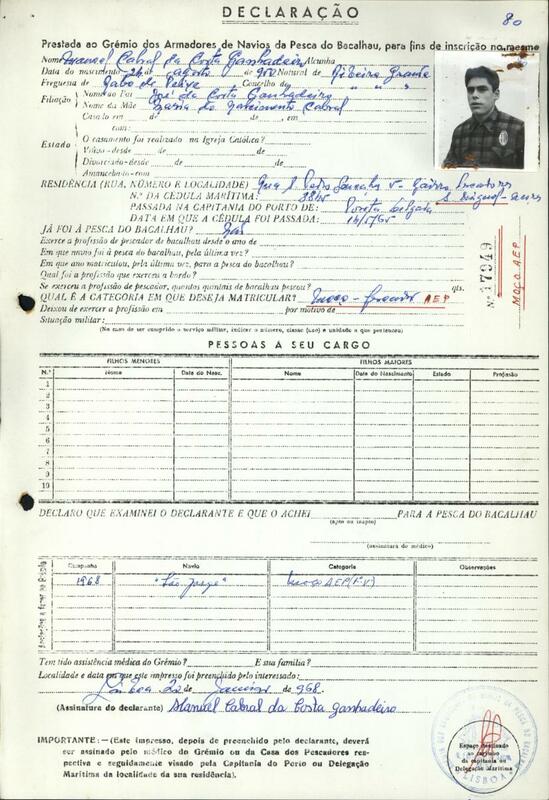 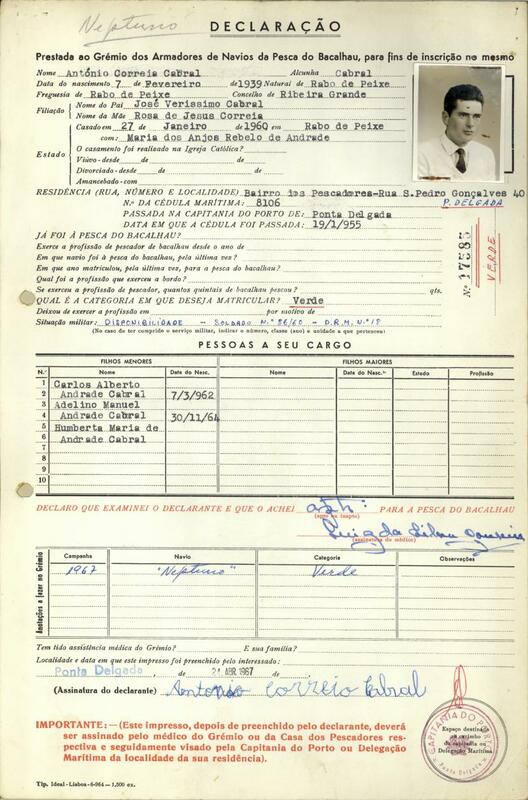 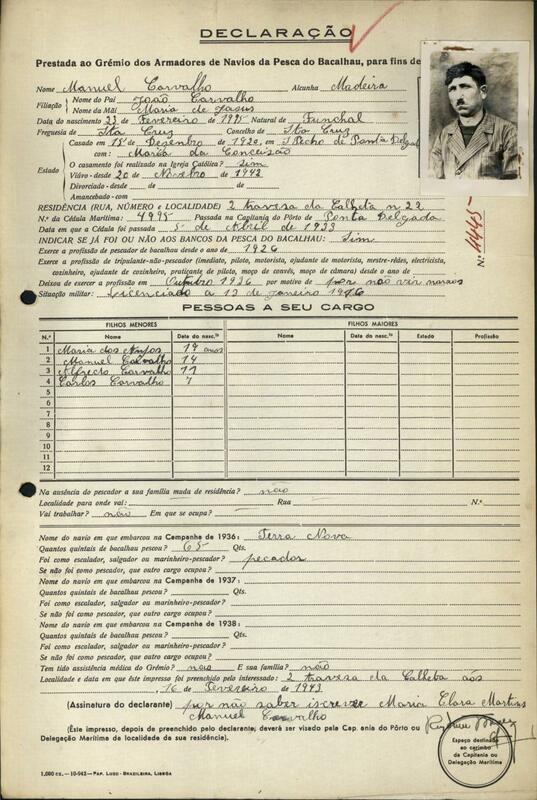 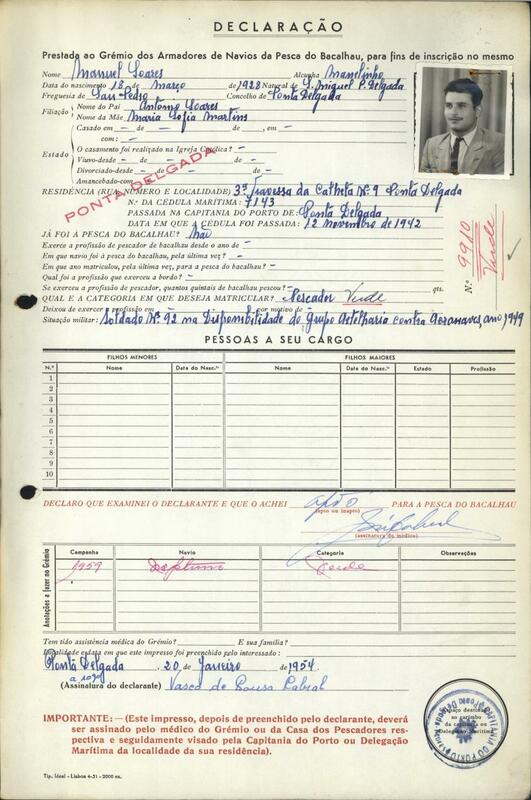 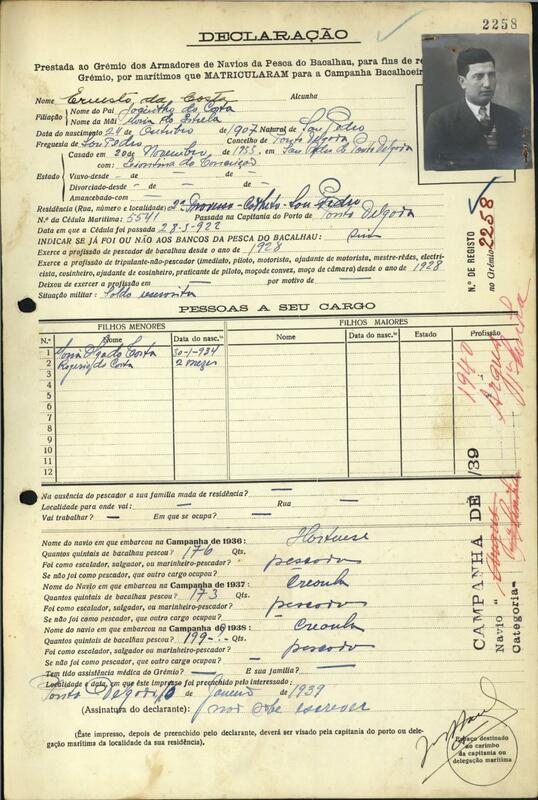 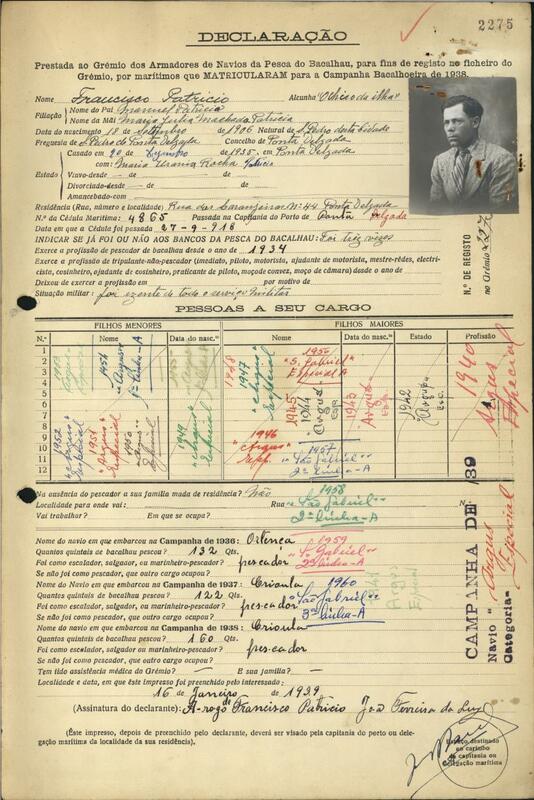 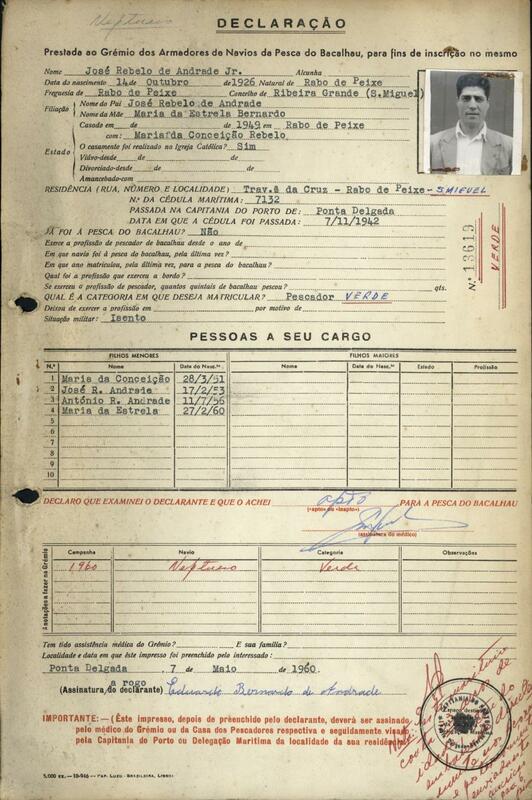 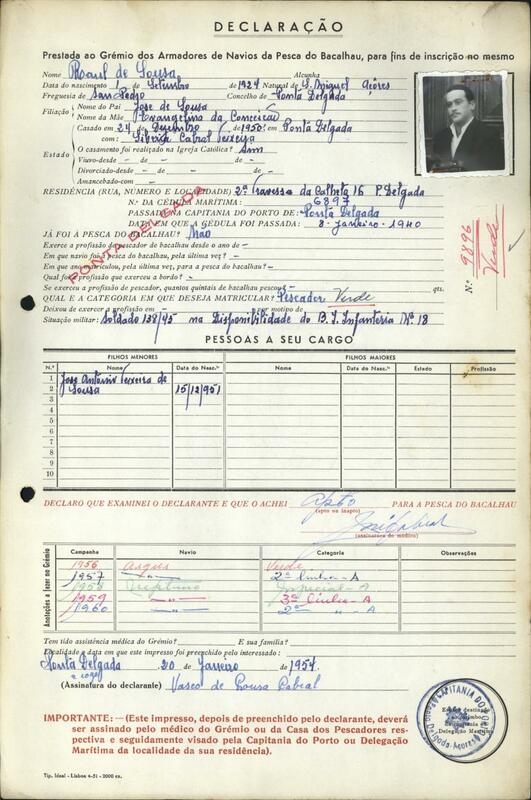 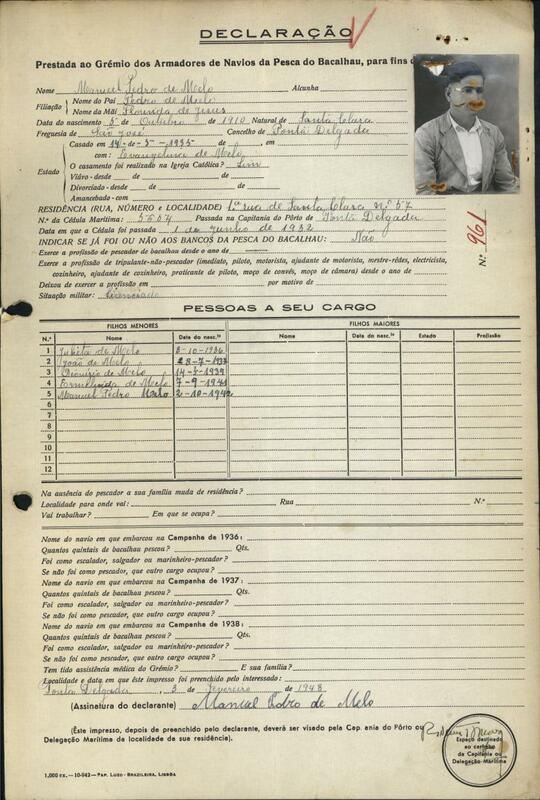 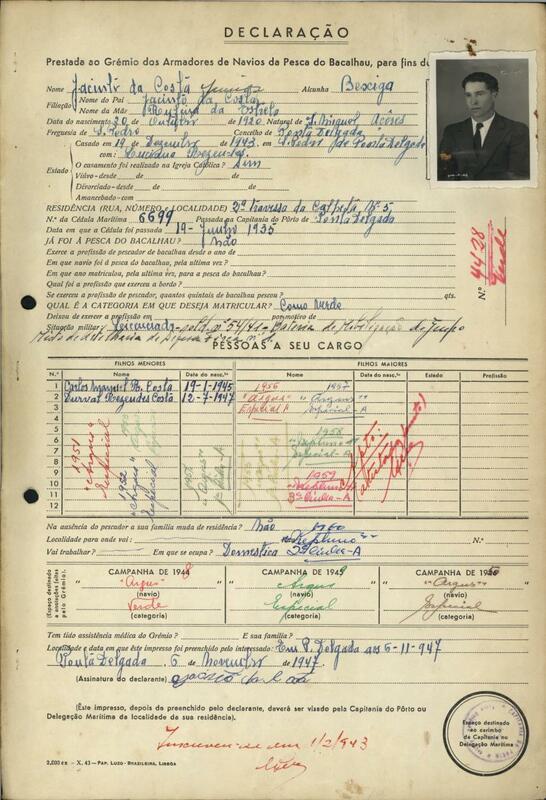 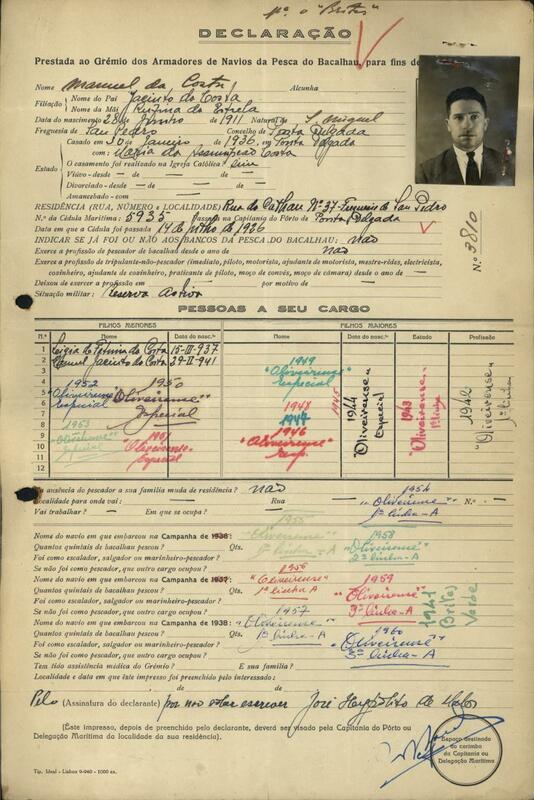 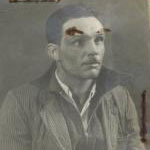 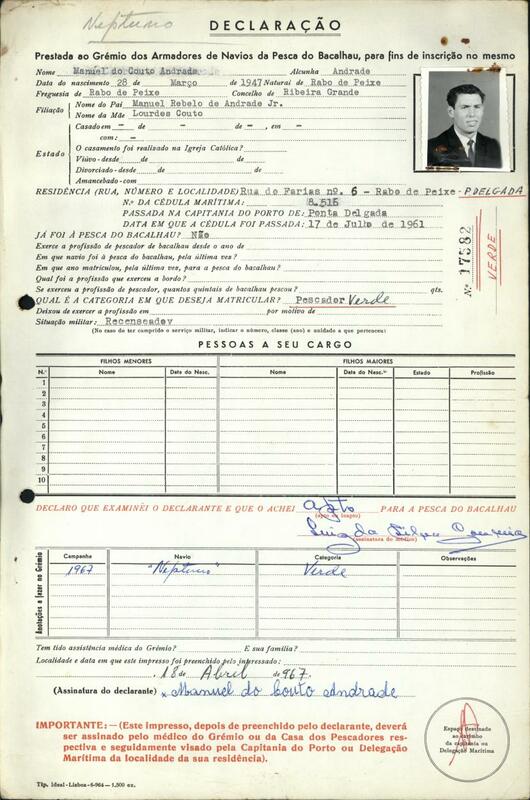 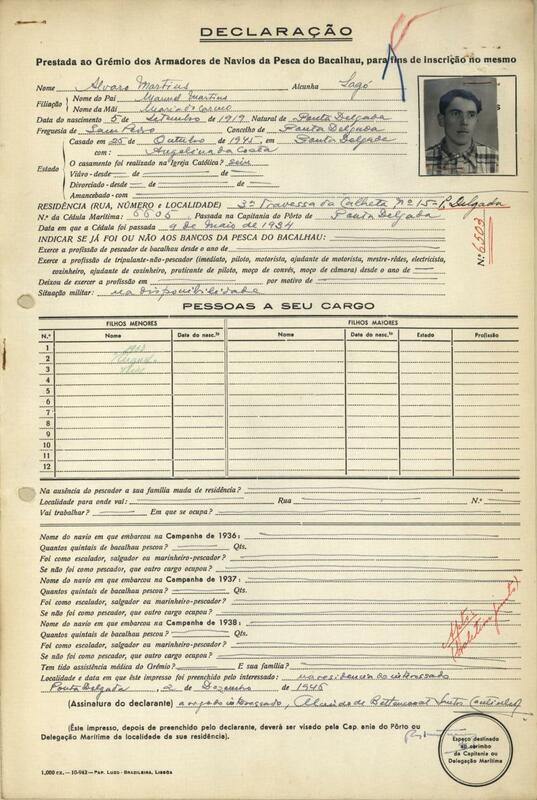 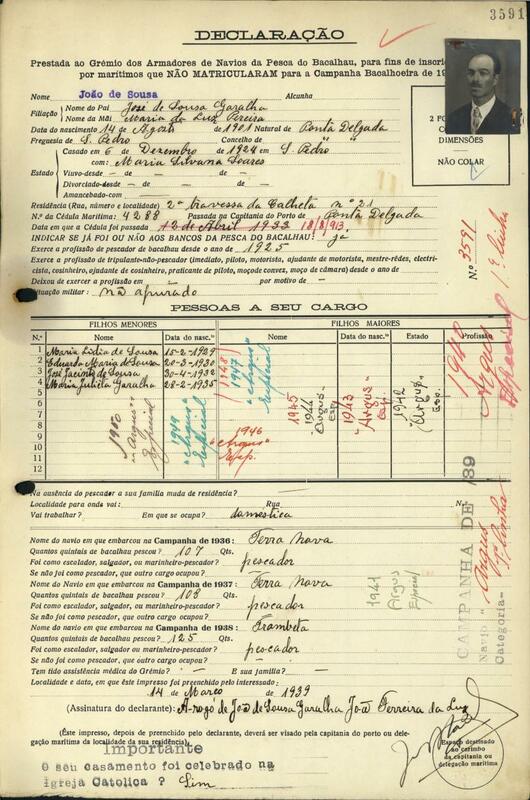 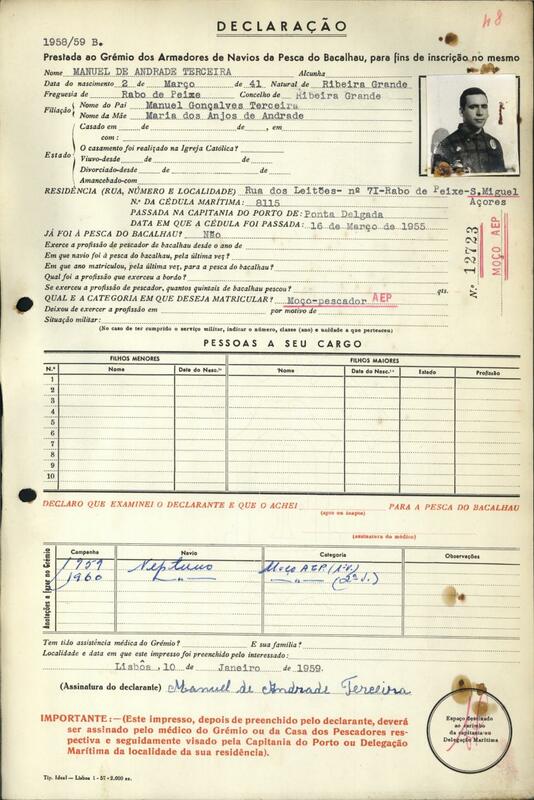 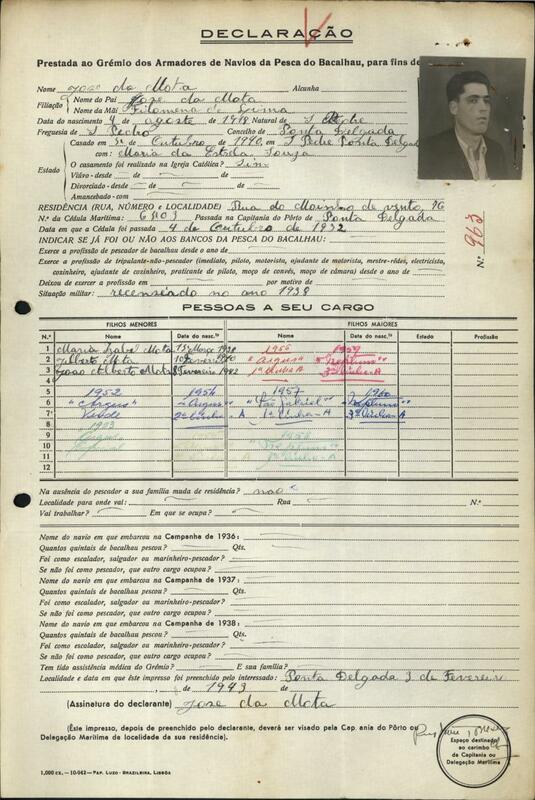 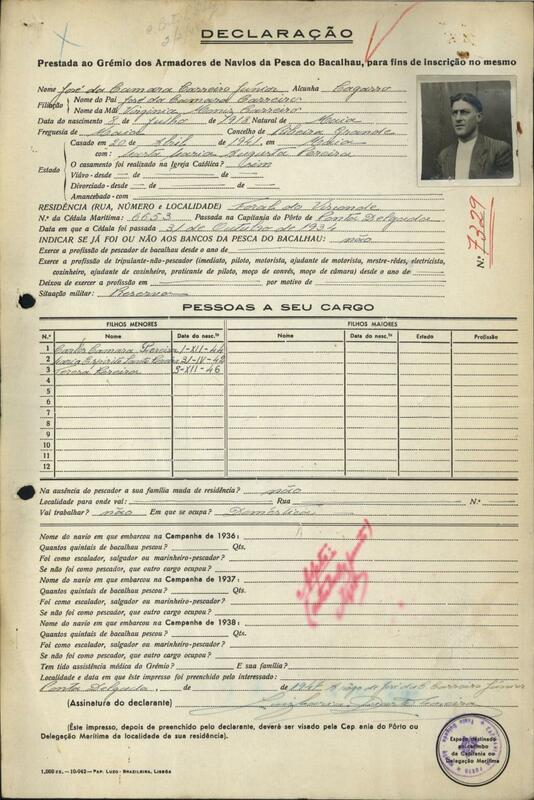 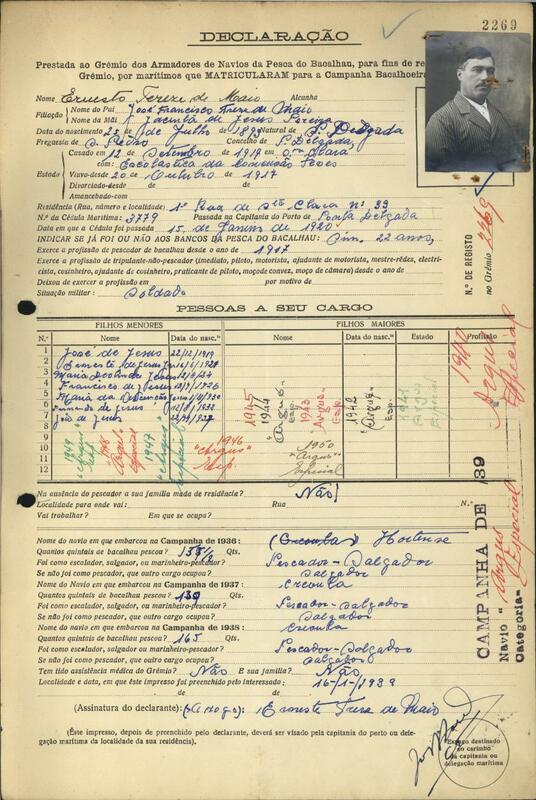 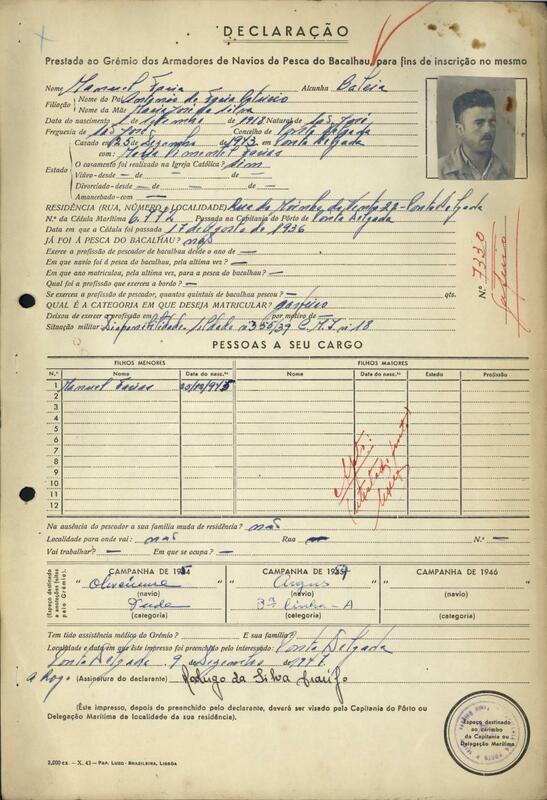 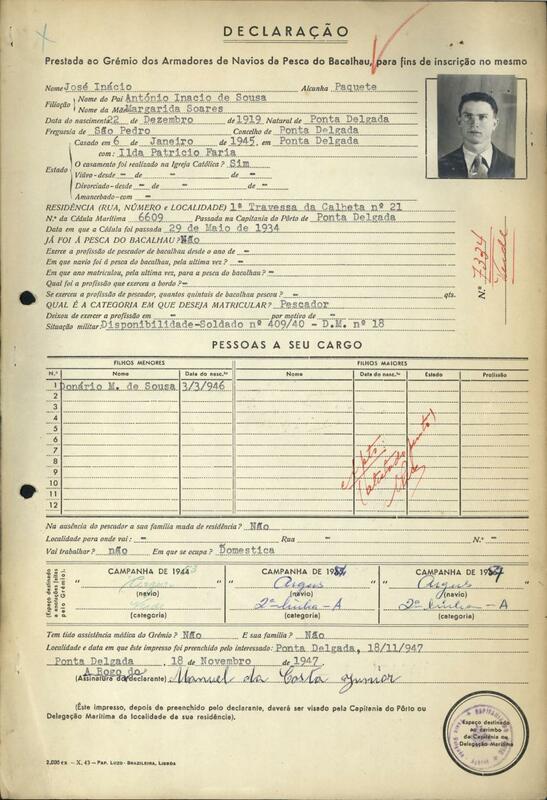 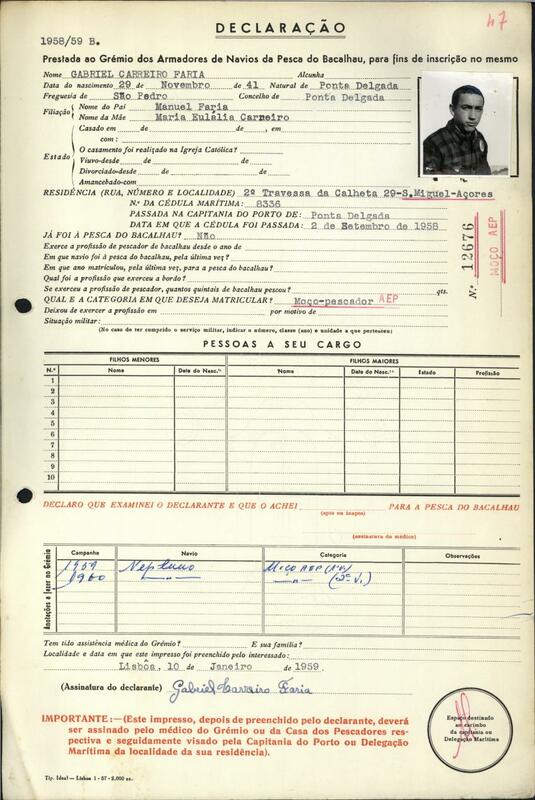 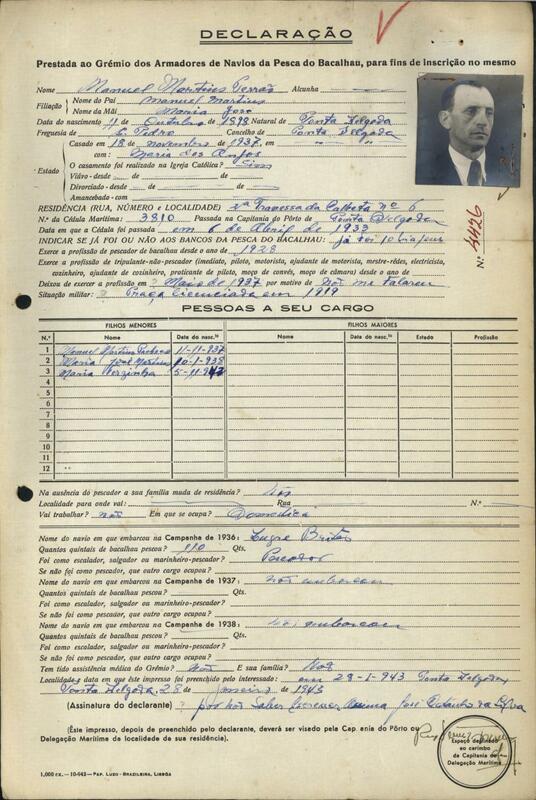 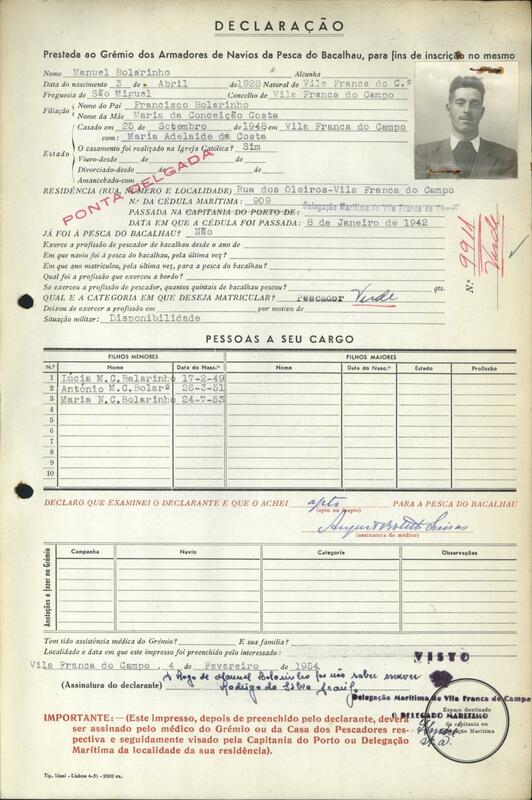 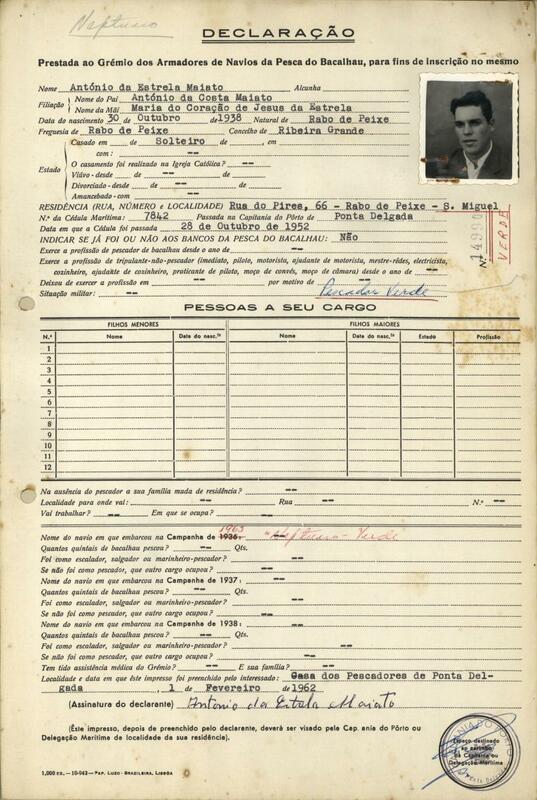 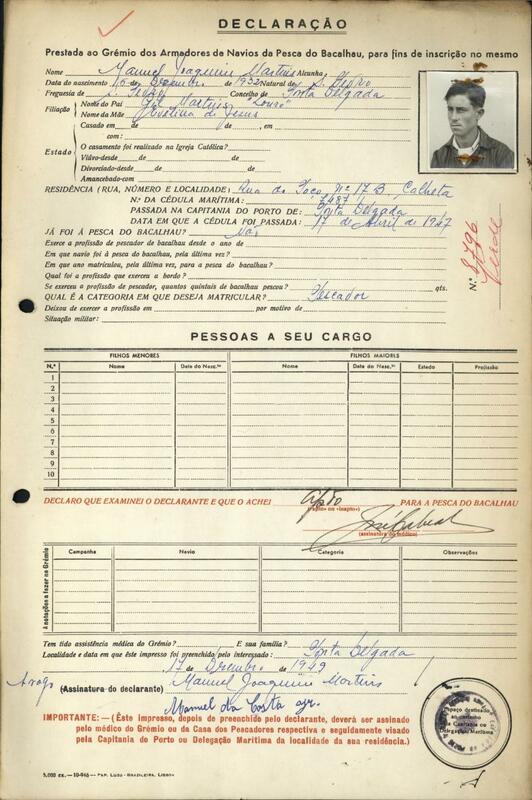 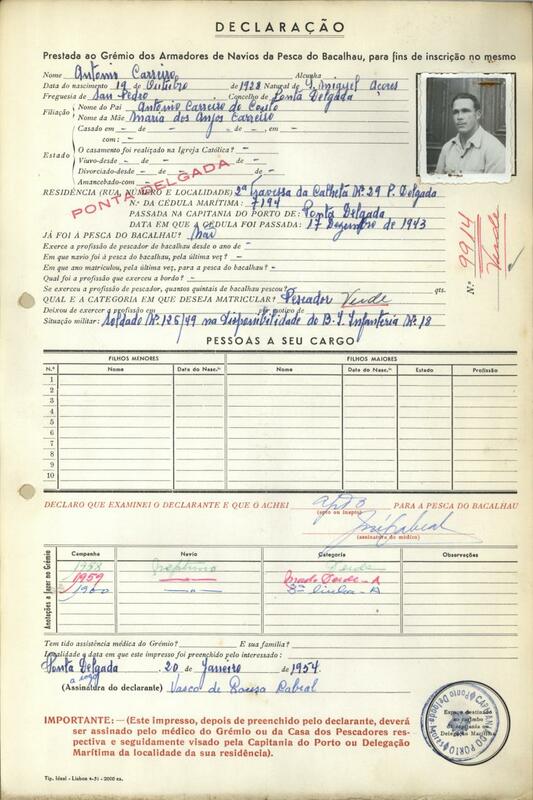 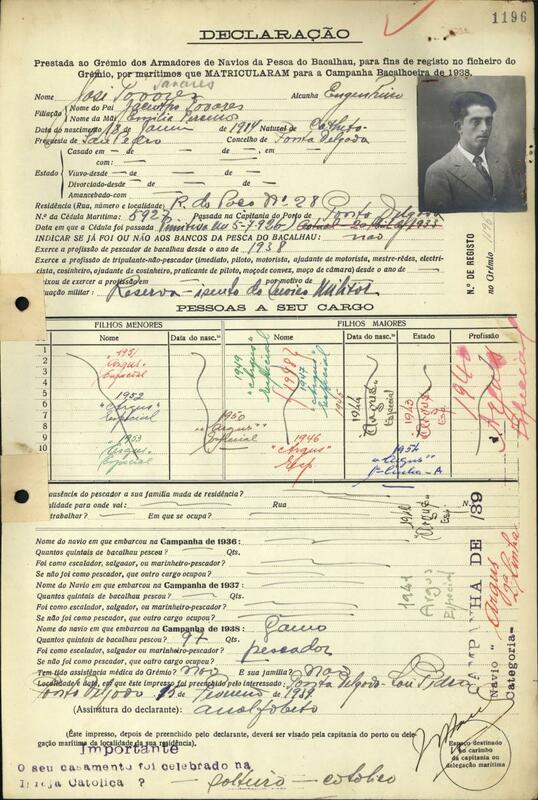 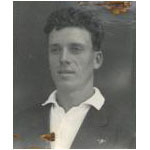 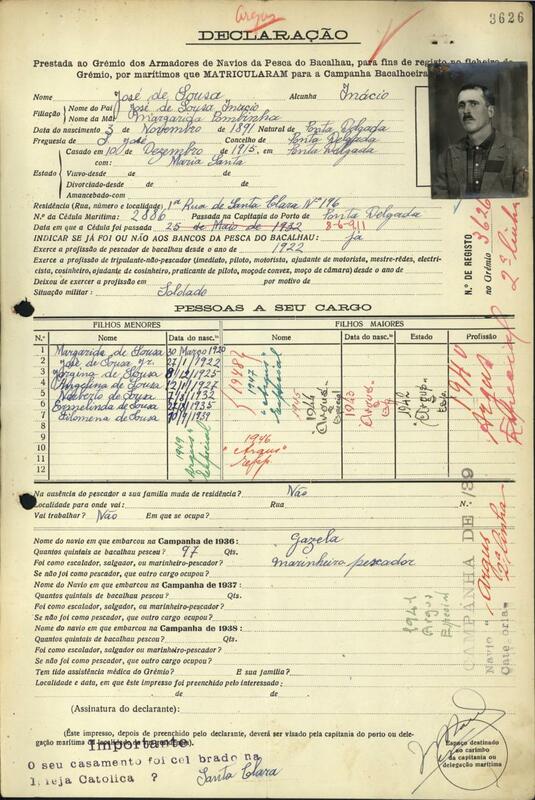 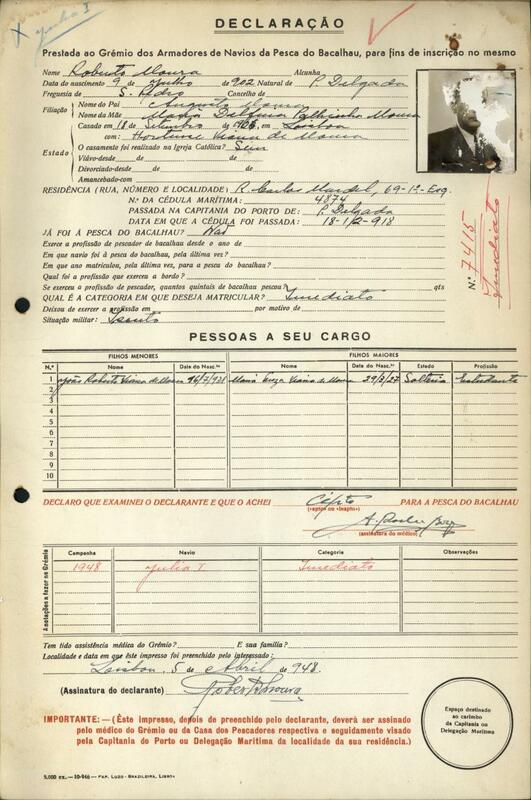 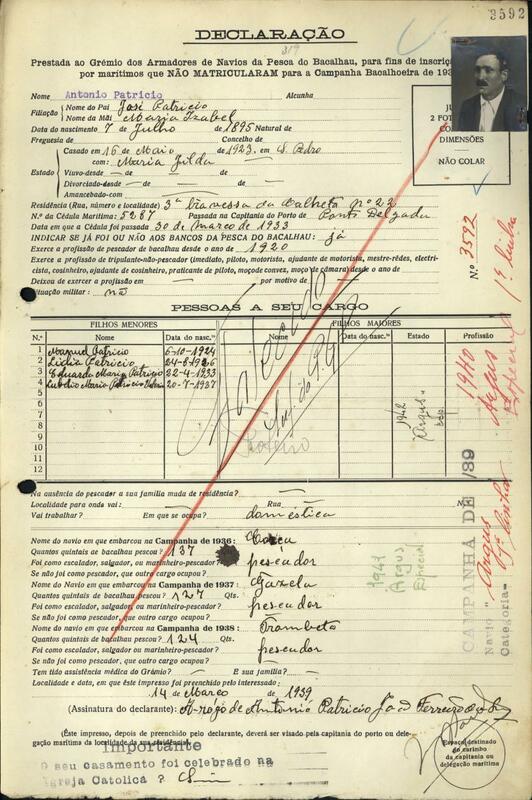 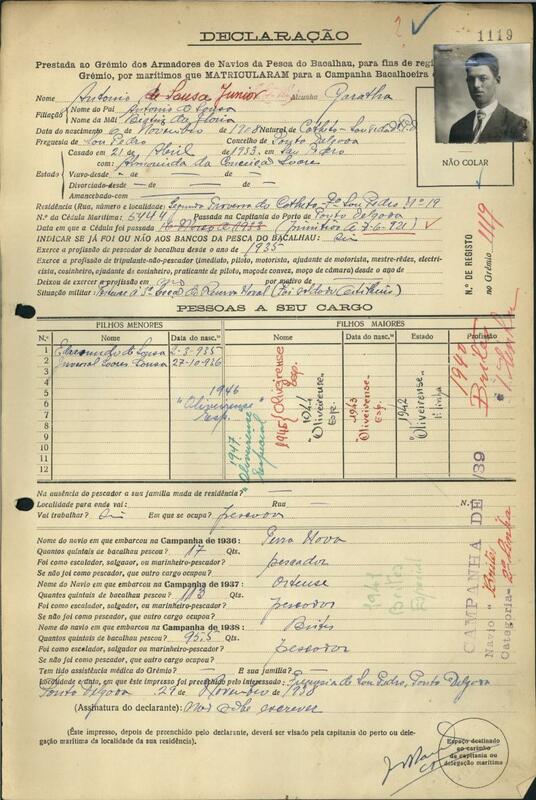 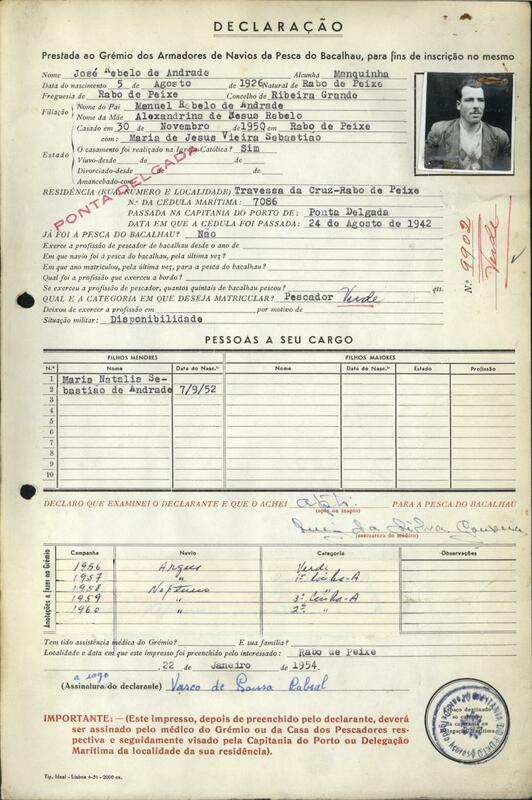 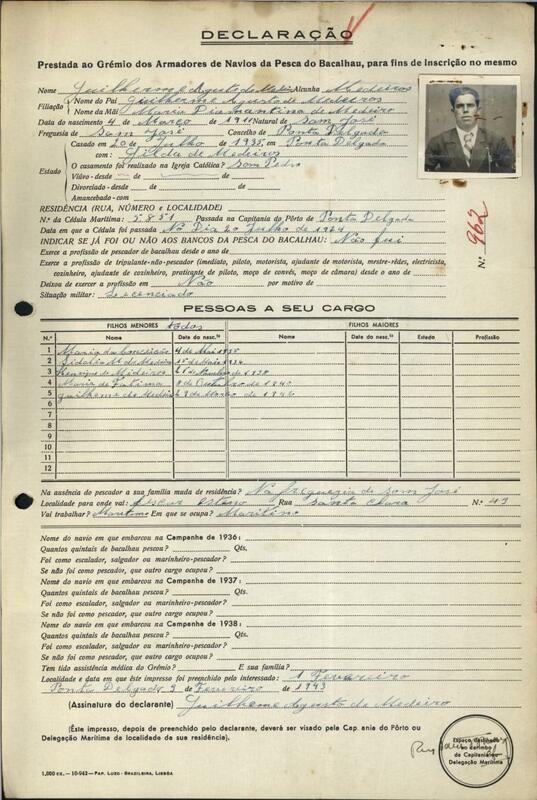 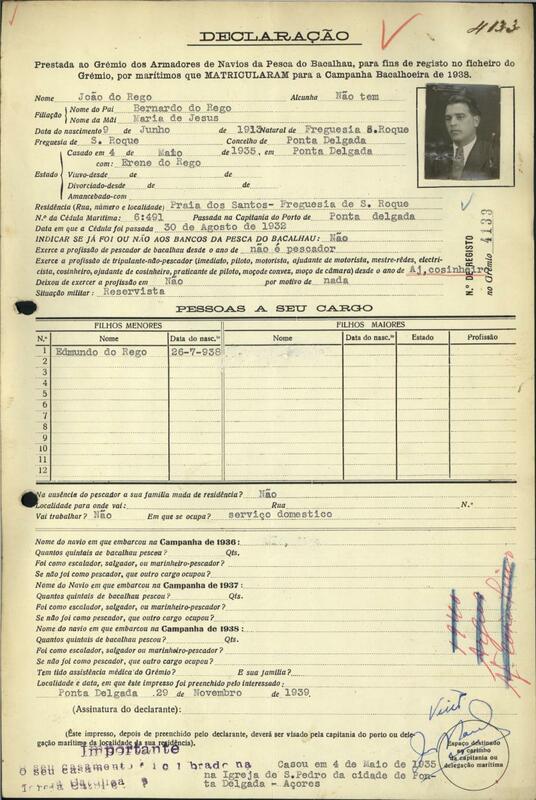 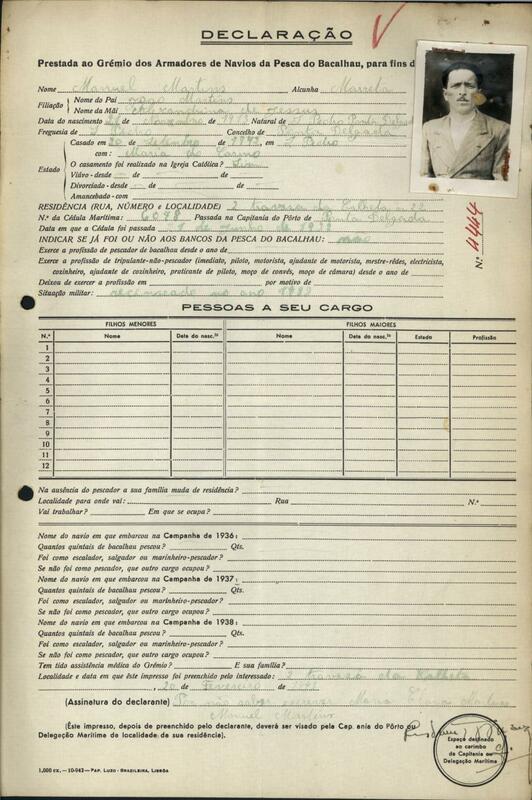 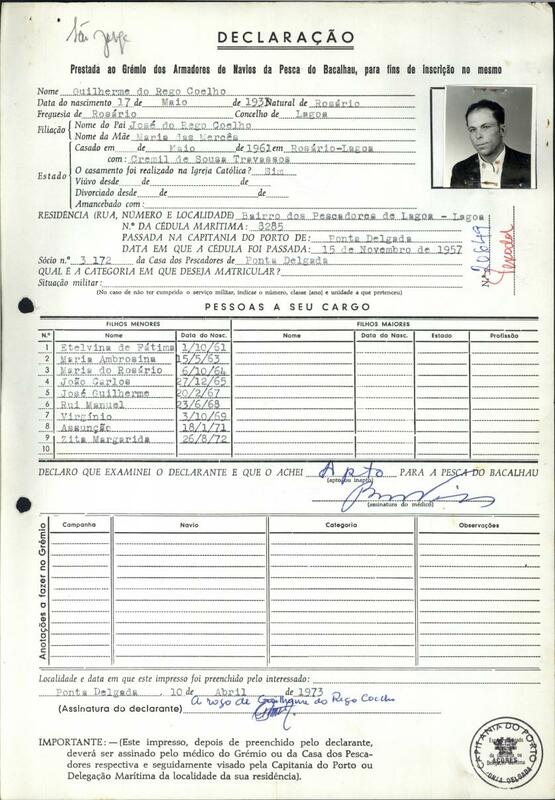 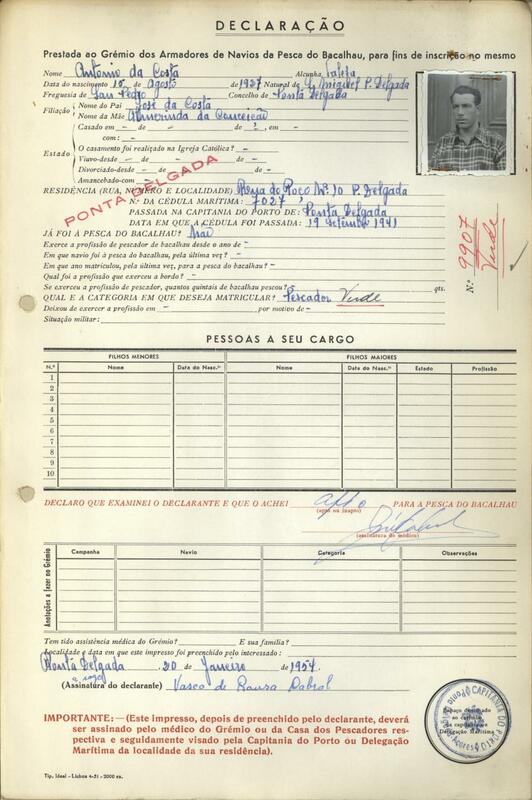 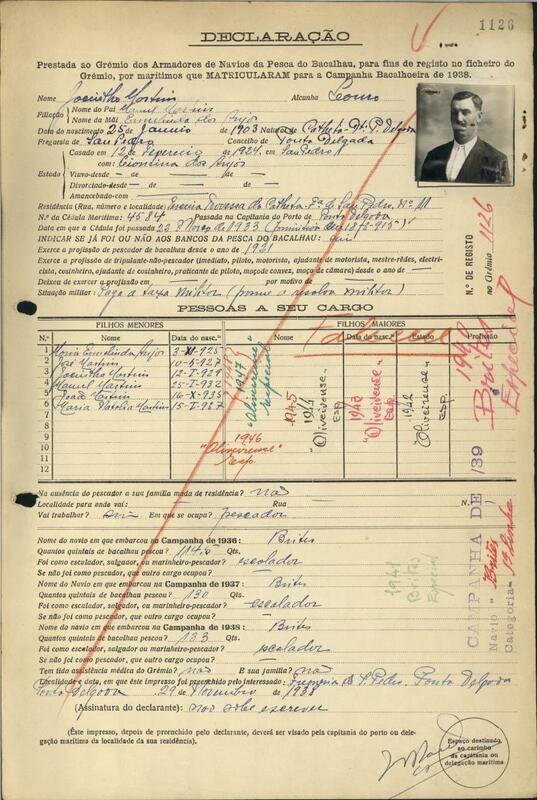 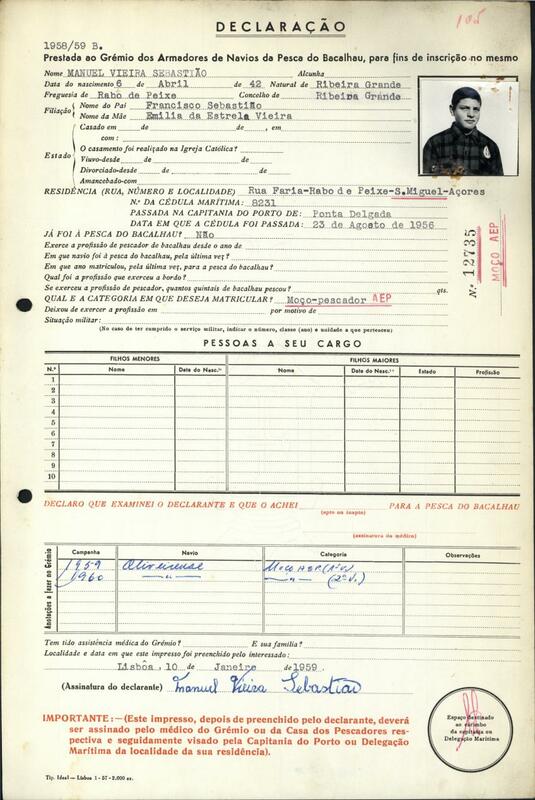 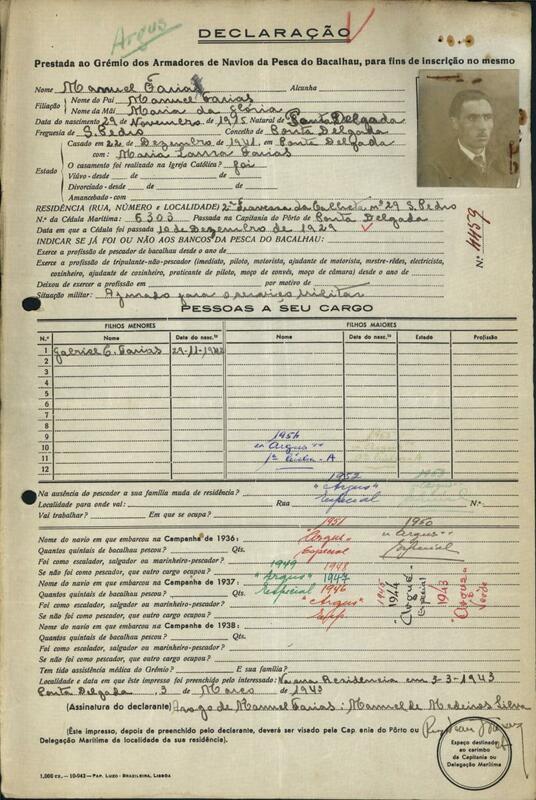 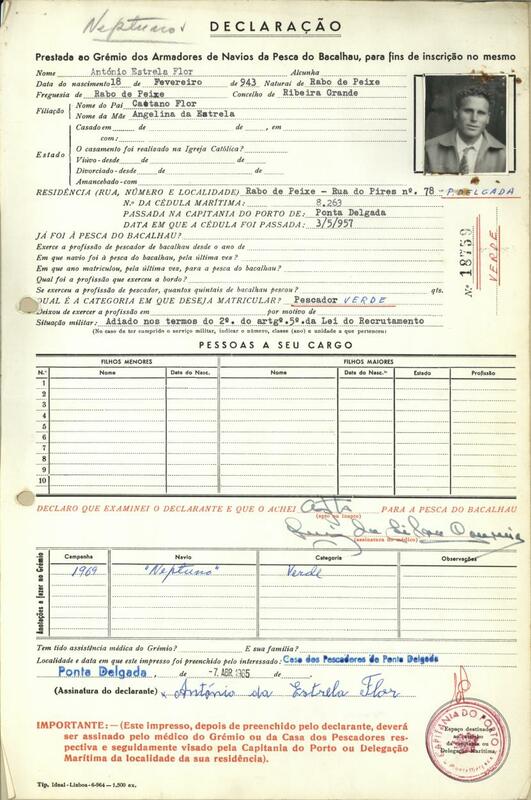 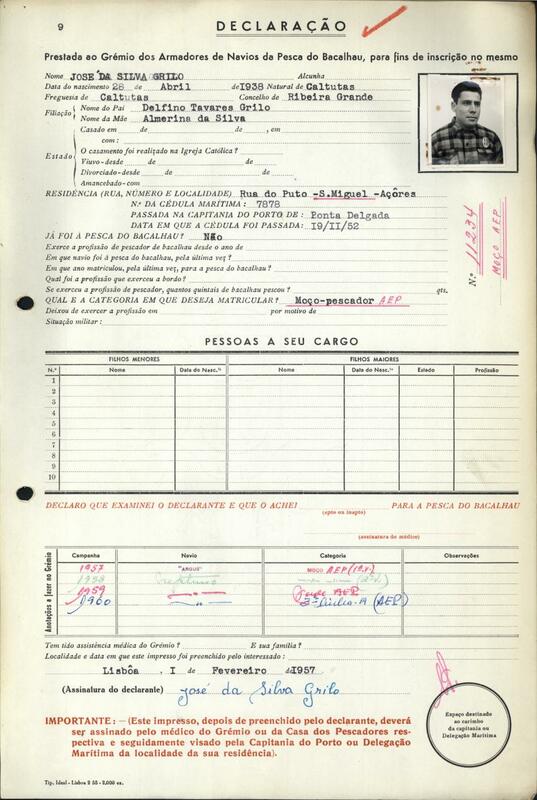 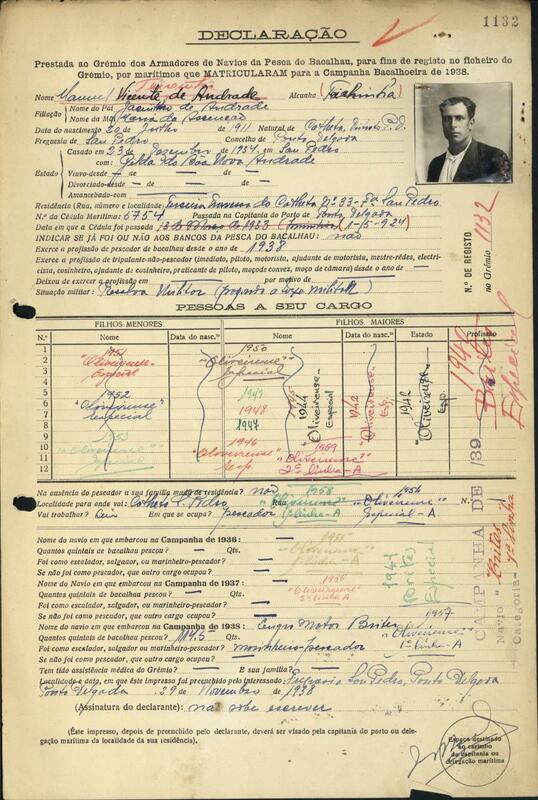 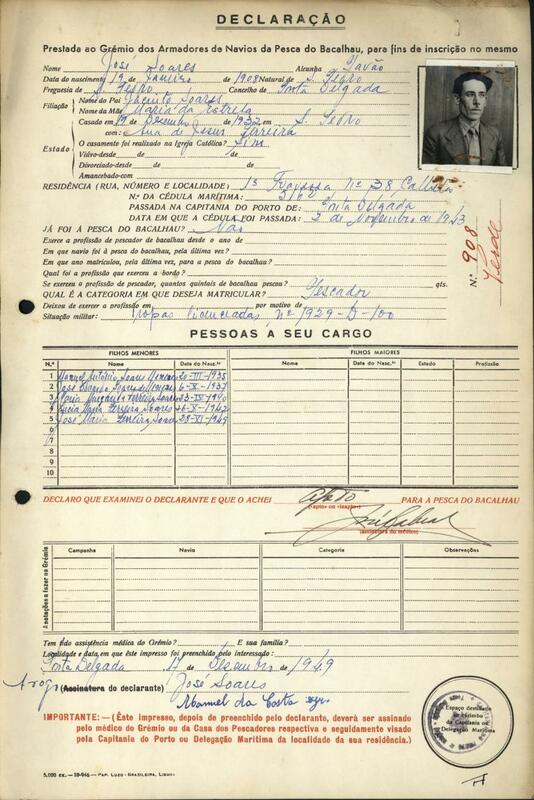 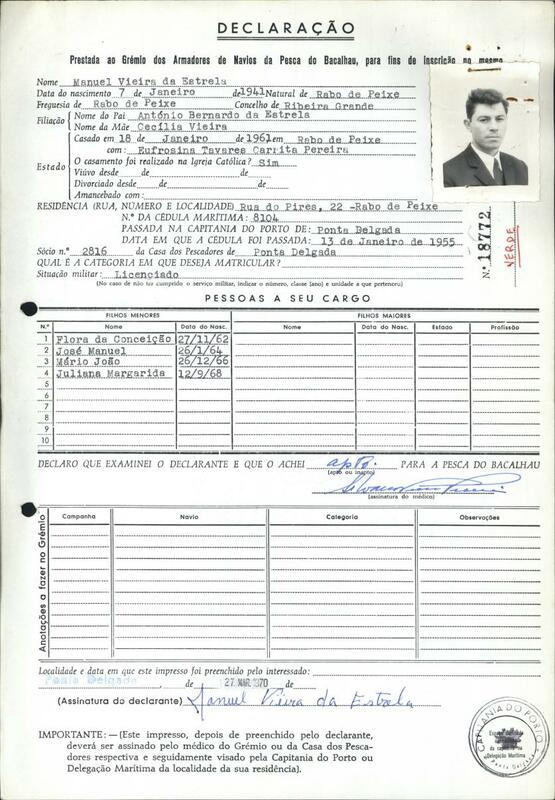 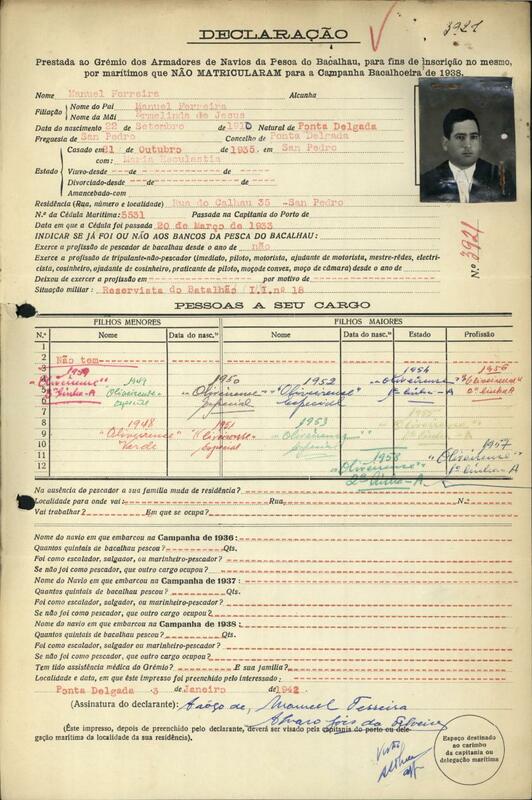 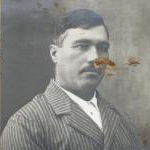 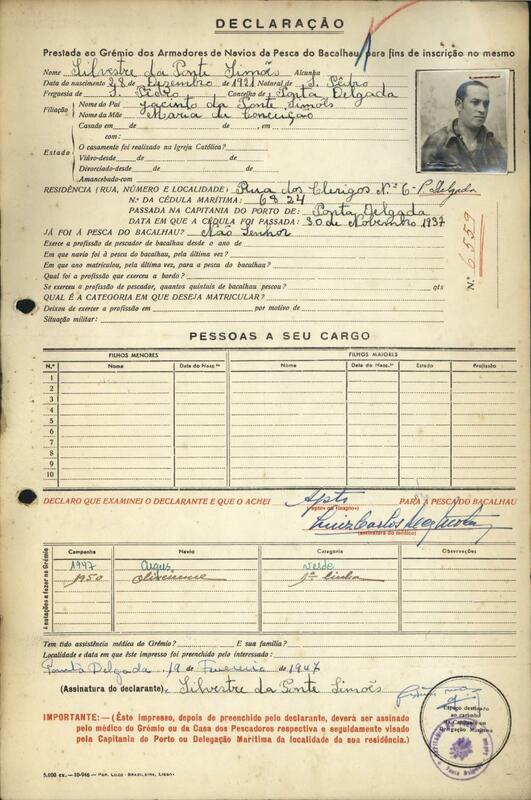 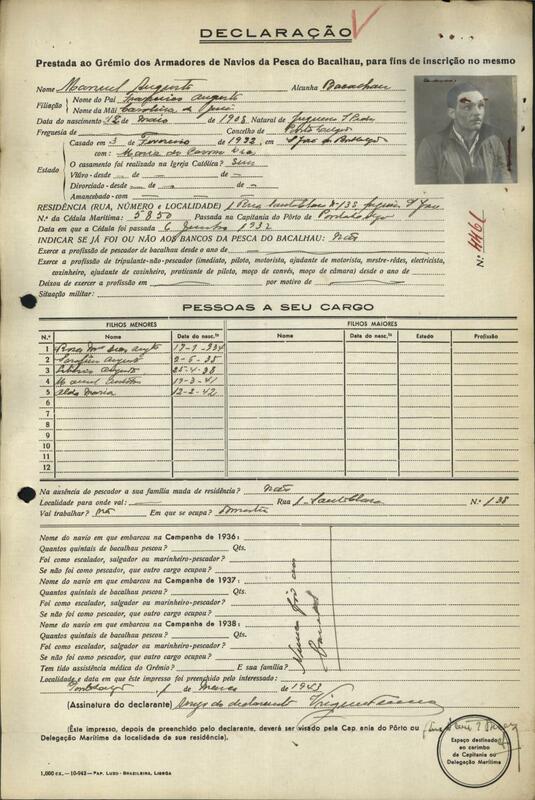 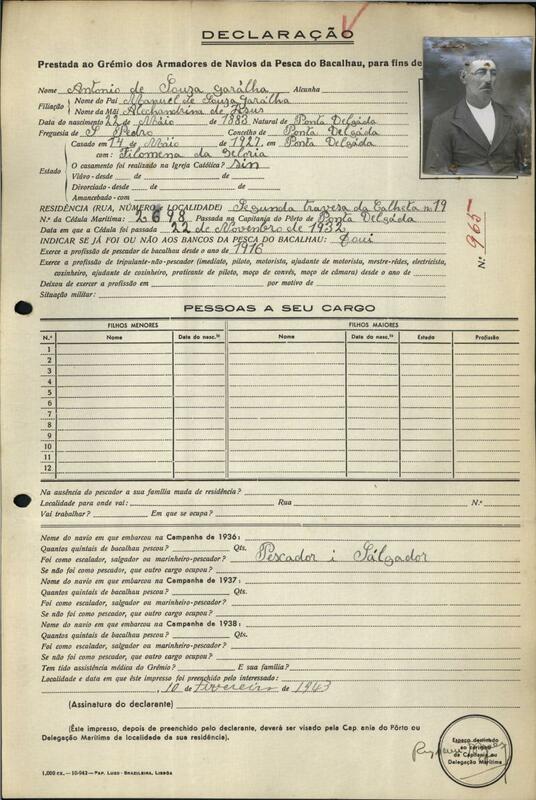 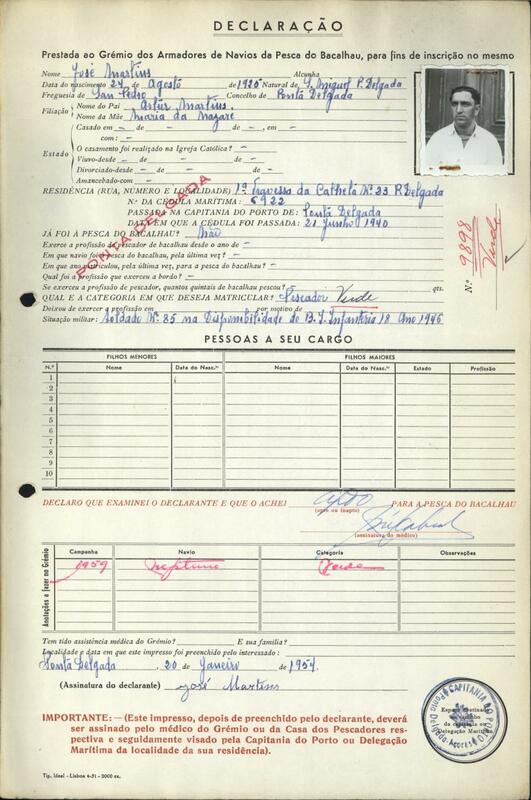 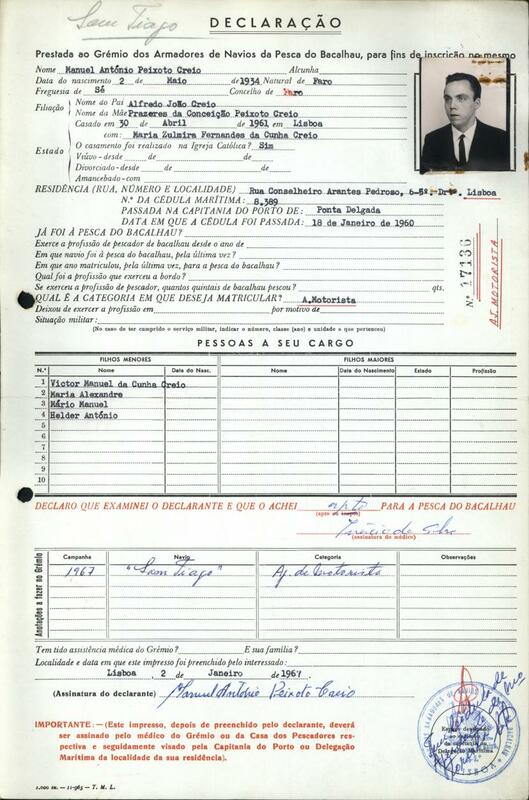 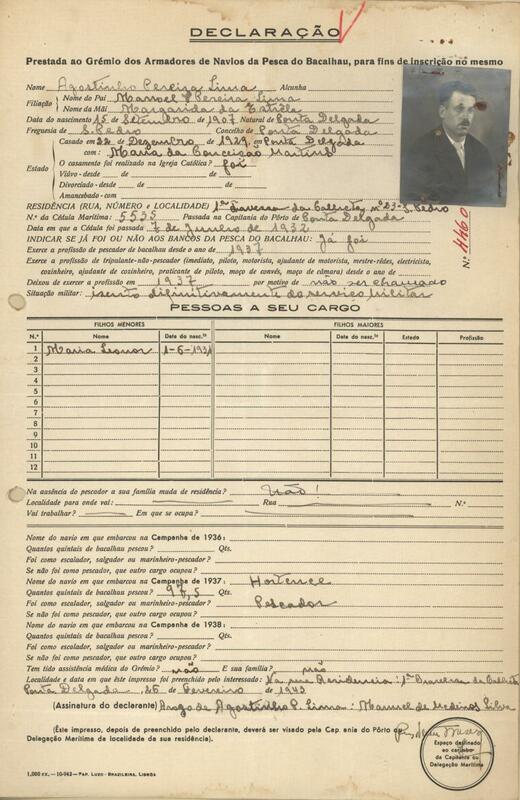 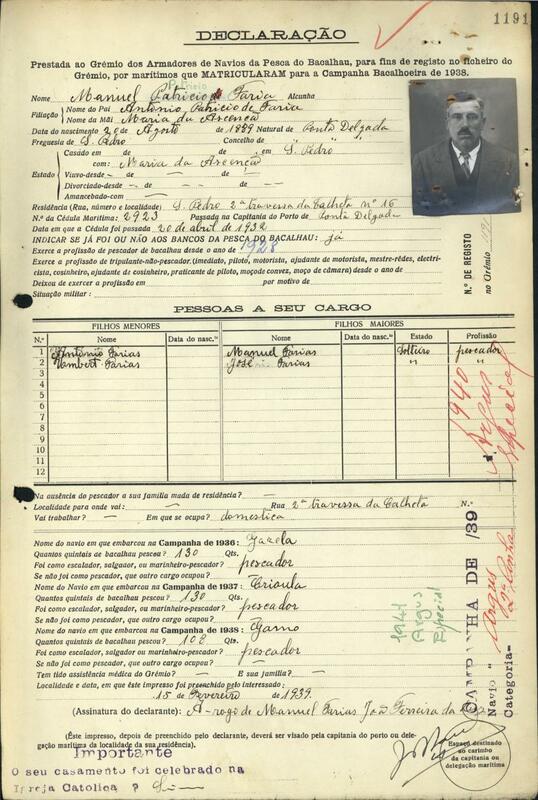 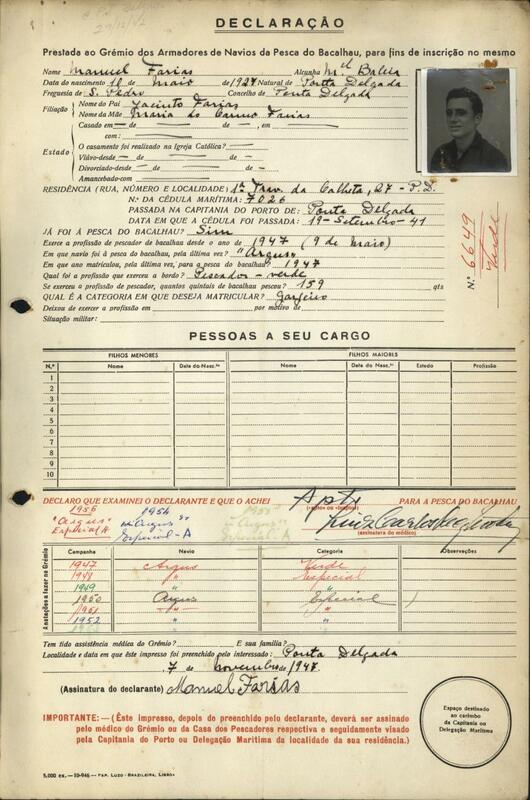 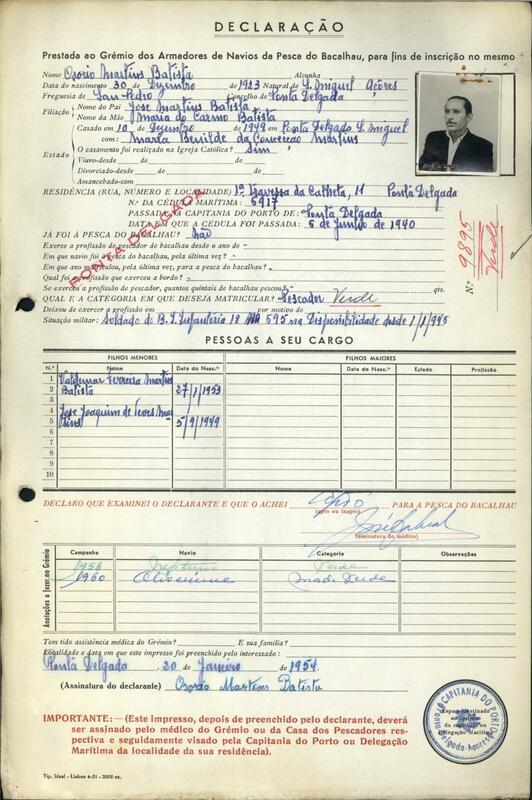 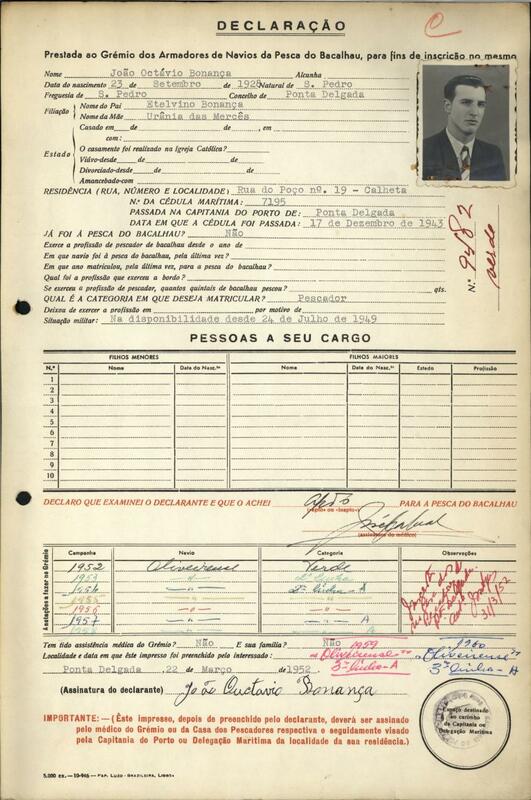 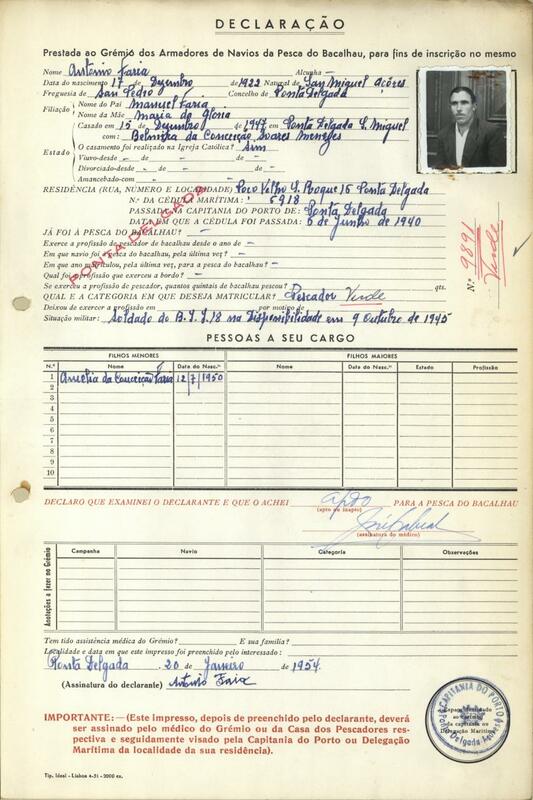 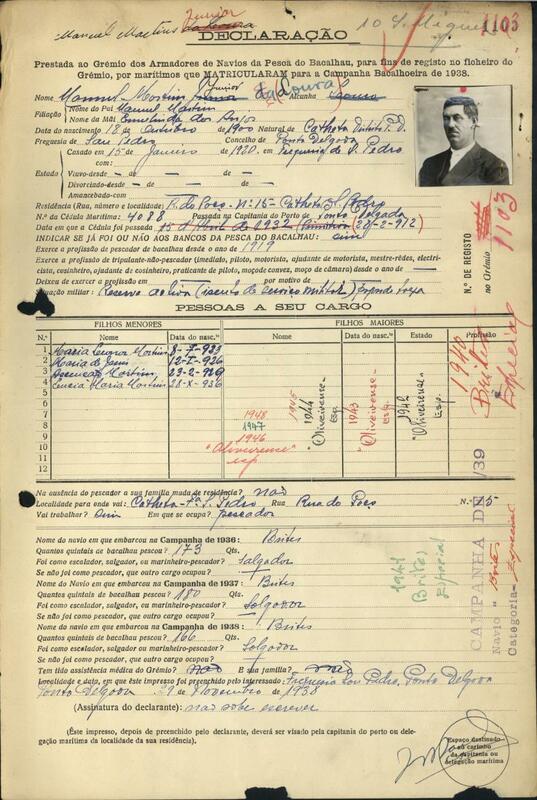 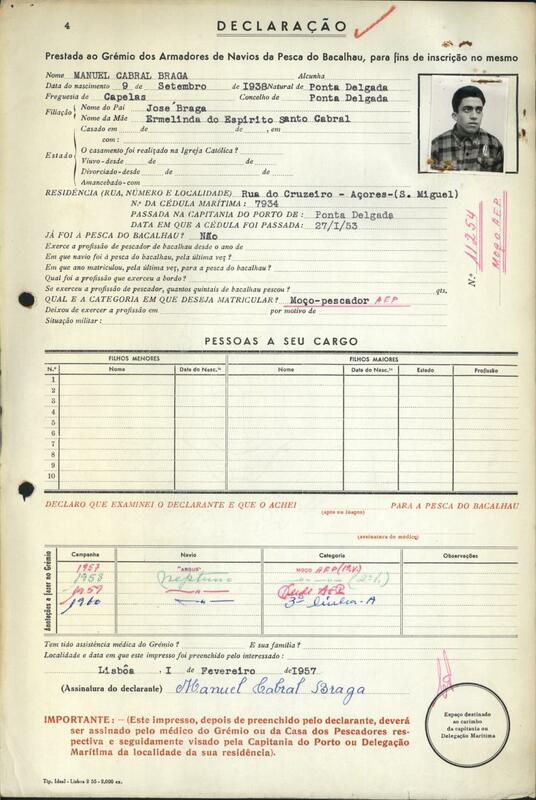 I would like thank Mr. Alvaro Garrido, director of the Maritime Museum of Ilhavo for his help in locating and providing me and my family with a copy of my Grandfather, Antonio Patricio, original Grèmio registration card with the only photograph of my Grandfather known to exist. 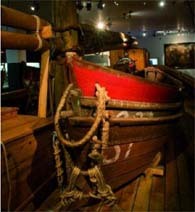 A big Thank You to the staff of the Museu Maritimo de Ilhavo for their hard work in perpetuating the memory of the Portuguese Cod fishermen who endured enormous hardships and loss of life to bring the Bacalhau to tables across Europe and the world. 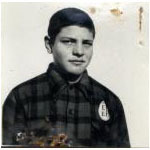 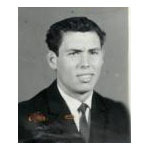 Notes: Antonio Patricio "Gazela" is the older brother of Josè Patricio Jr. "Valerio" below. 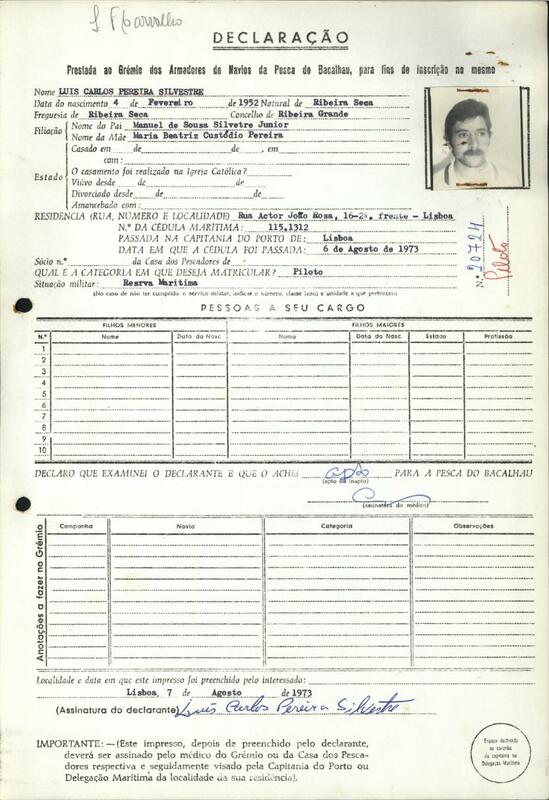 Notes: Manuel Patricio "Toni" is the only son of Antonio Patricio "Gazela" above. 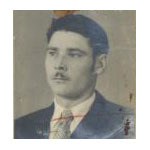 Notes: Josè Patricio Jr. Valerio is the younger brother of Antonio Patricio "Gazela" above and Father of Josè Patricio III Valerio below. 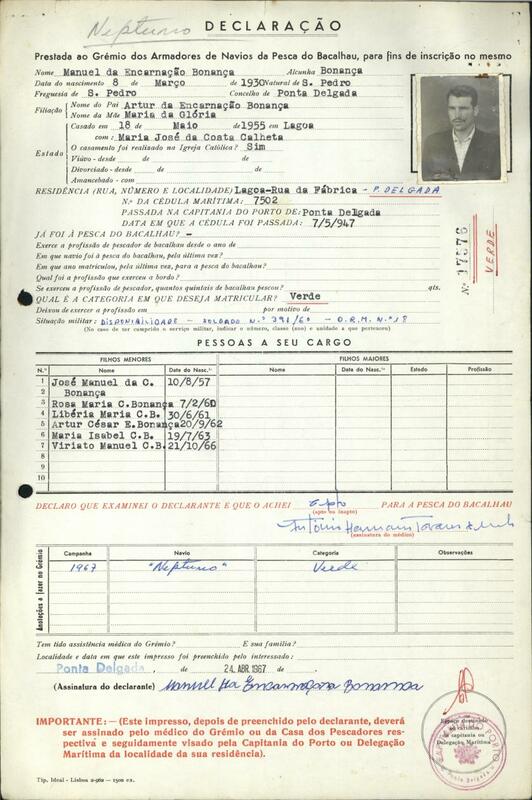 Notes: Jose Patricio III Valerio is the son of Jose Patricio Jr. Valerio above. 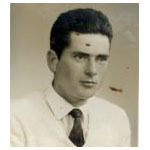 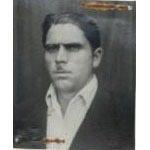 Notes: Josè de Sousa "Damaso" is the Father of Manuel De Sousa "Damaso", Francisco De Sousa "Damaso", Raul de Sousa "Damaso" Albert De Sousa "Damaso" below. 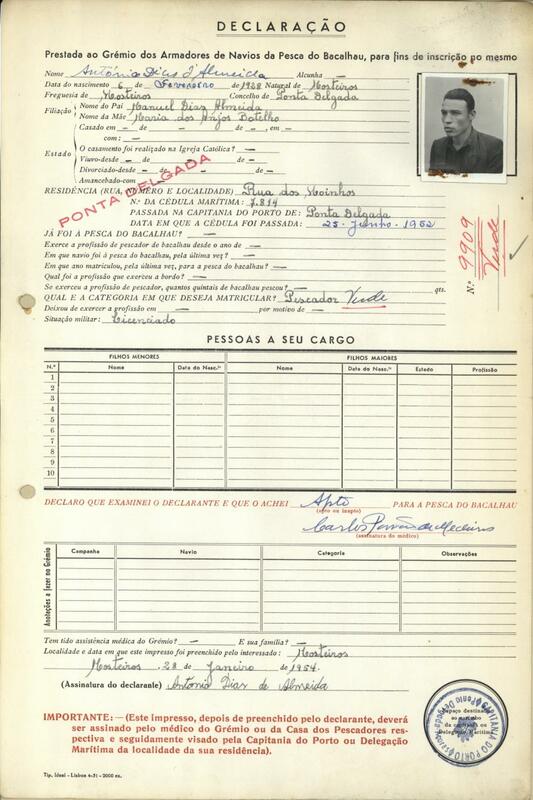 Notes: Manuel de Sousa "Damaso" is the son of Josè de Sousa "Damaso" above. 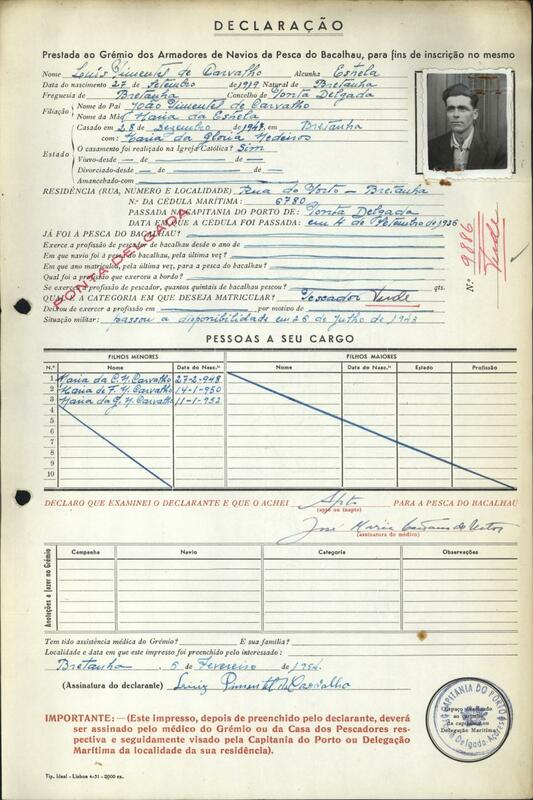 Notes: Francisco de Sousa "Damaso" is the son of Josè de Sousa "Damaso" above. Notes: Raul de Sousa "Damaso" is the son of Josè de Sousa "Damaso" above. Notes: Alberto de Sousa "Damaso" is the son of Josè de Sousa "Damaso" above. 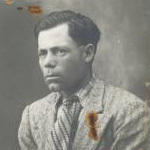 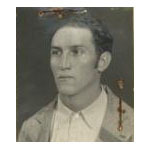 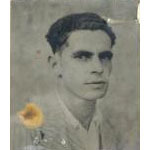 Notes: Josè Carreiro de Andrade is the brother of Agostinho Carreiro de Andrade and Manuel Domingues Carreiro Rebelo below. 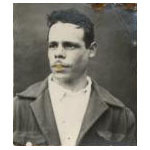 Notes: Agostinho Carreiro de Andrade is the brother of Josè Carreiro de Andrade above and Manuel Domingues Carreiro Rebelo below. 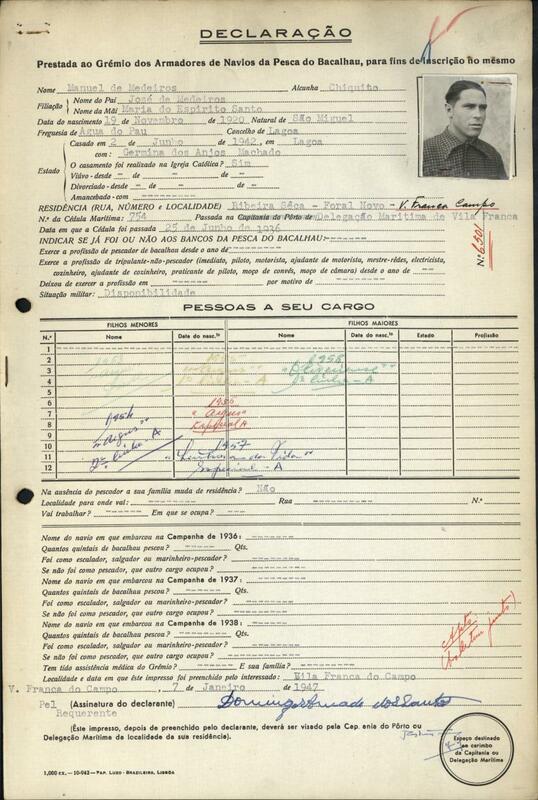 Notes: Manuel Domingues Carreiro Rebelo is the brother of Agostinho Carreiro de Andrade and Josè Carreiro de Andrade above. 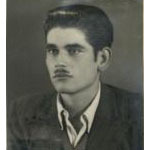 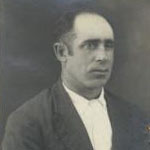 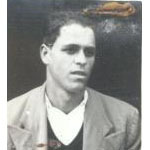 Notes: Josè Rebelo de Andrade Parçeiro is the brother of Agostinho Rebelo de Andrade below. 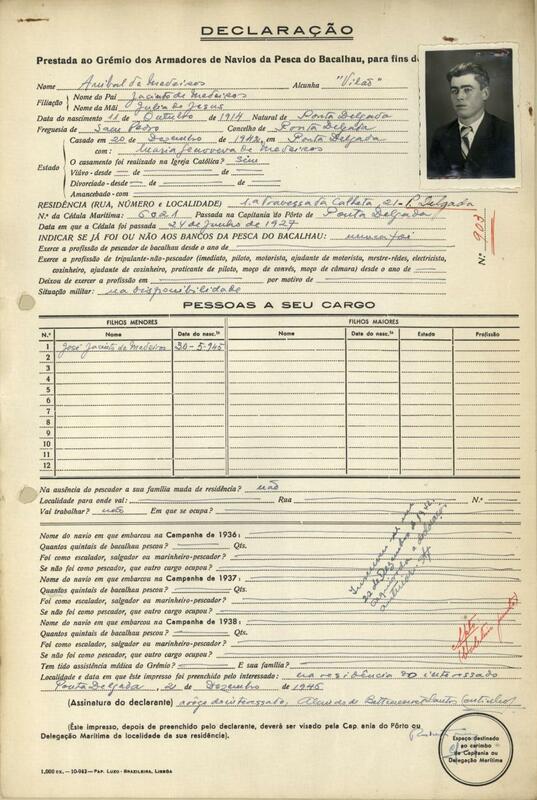 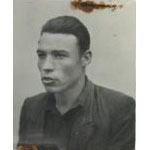 Notes: Agostinho Rebelo de Andrade is the brother of Josè Rebelo de Andrade Parçeiro above. 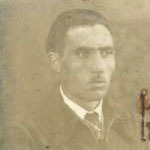 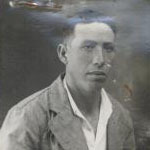 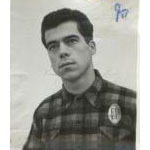 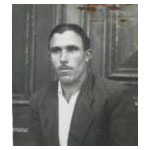 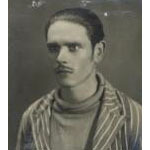 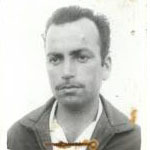 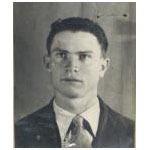 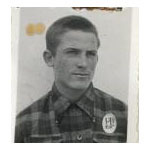 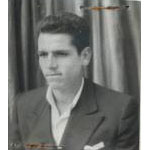 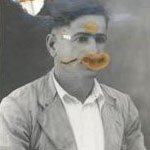 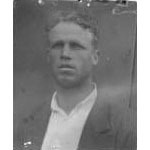 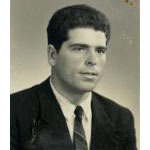 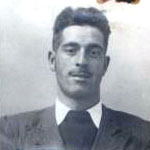 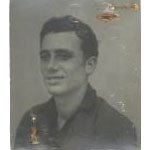 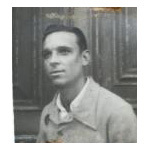 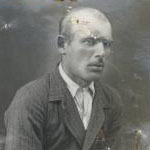 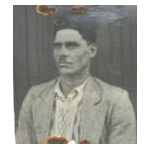 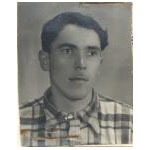 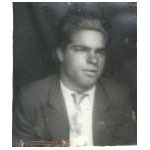 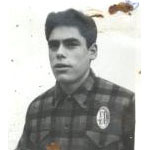 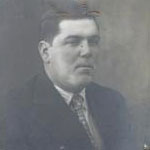 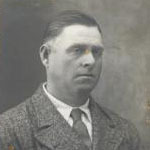 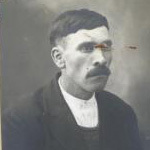 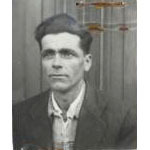 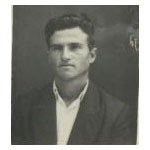 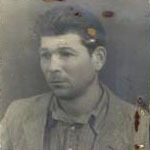 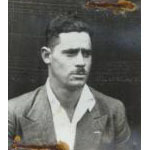 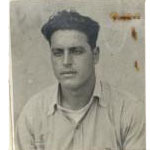 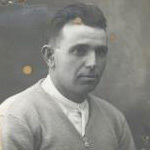 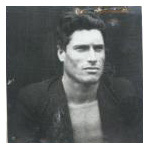 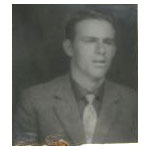 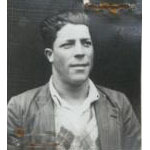 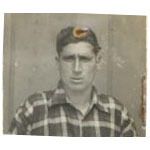 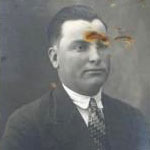 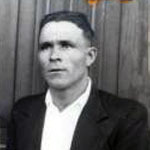 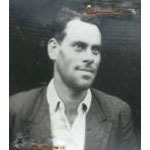 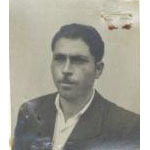 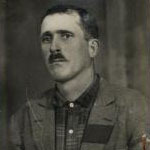 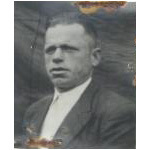 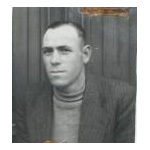 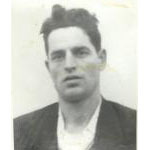 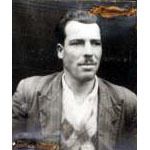 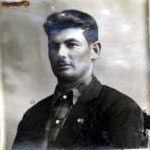 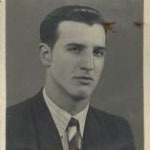 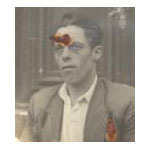 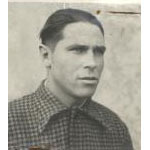 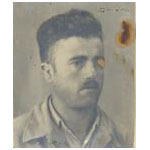 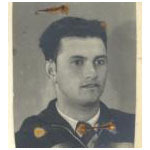 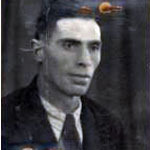 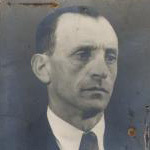 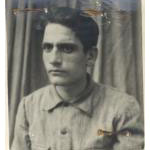 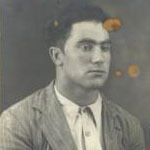 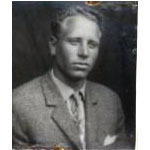 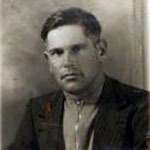 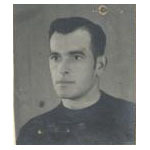 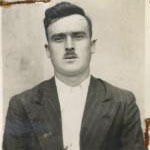 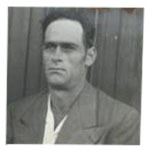 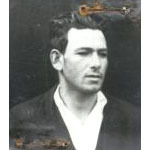 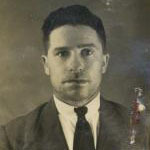 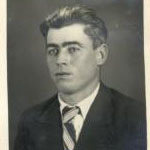 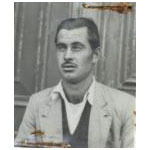 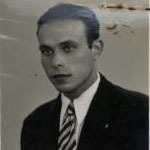 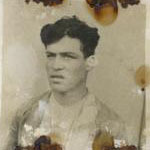 Notes: Antonio Rebelo de Andrade Manquinha is the brother of Josè Rebelo de Andrade Manquinha below. 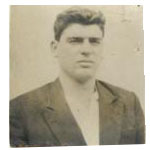 Notes: Josè Rebelo de Andrade Manquinha is the brother of Antonio Rebelo de Andrade Manquinha above. 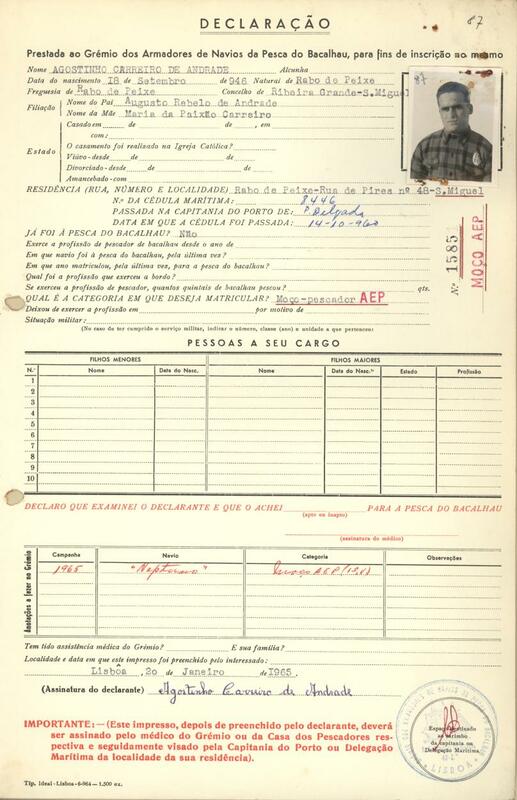 Notes: Arturo da Encarnação Bonança is the Father of Manuel da Encarnação Bonança and Januário da Encarnação Bonança below. 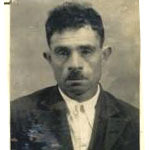 Notes: Manuel da Encarnação Bonança is the son of Arturo da Encarnação Bonança above and brother of Januário da Encarnação Bonança below. 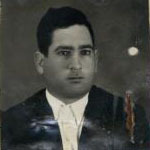 Notes: Januário da Encarnação Bonança is the son of Arturo da Encarnação Bonança and brother of Manuel da Encarnação Bonança above . 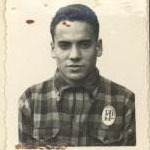 Notes: João Cabral is Brother of Alfredo Cabral and Manuel Cabral Jr. below. 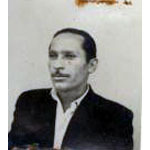 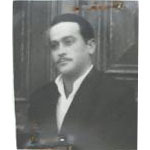 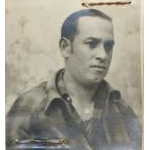 Notes: Alfredo Cabral is Brother of João Cabral above and Manuel Cabral Jr. below. 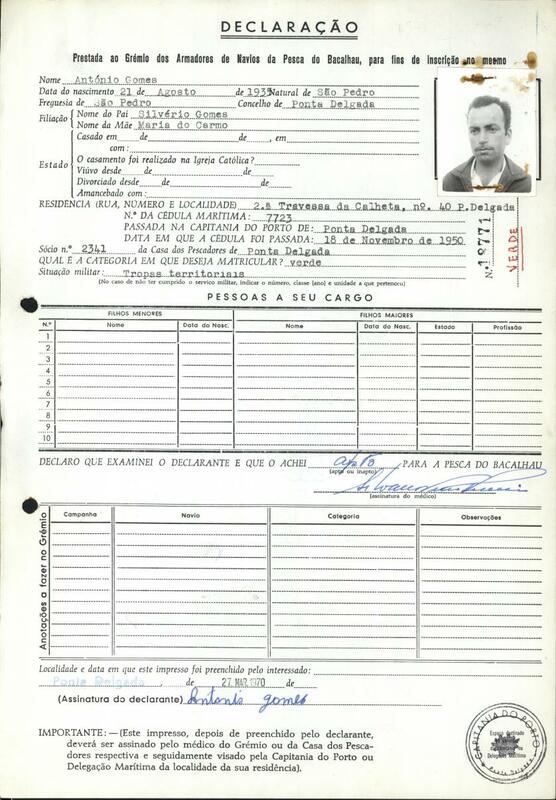 Notes: Manuel Cabral Jr. is Brother of Alfredo Cabral and João Cabral above. 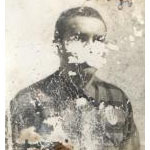 Notes: Manuel Verissimo Cabral iSãolder brother of Antonio Vieira Cabral "B0t&atilde;0" below. 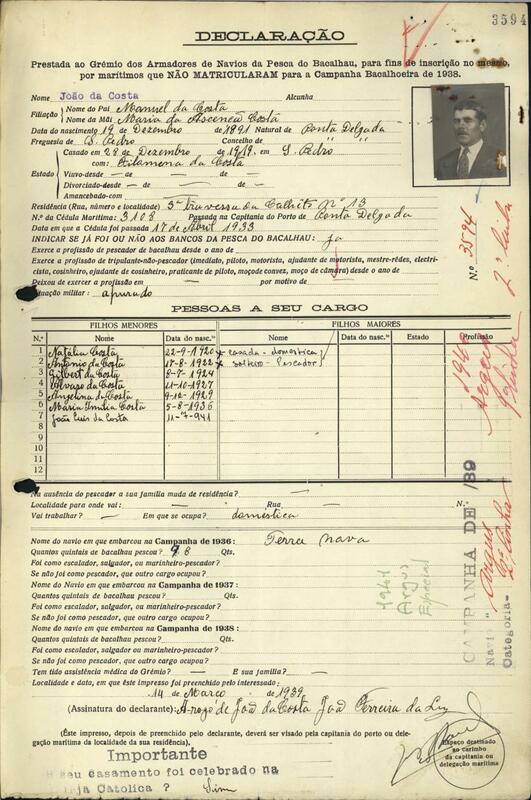 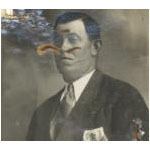 Notes: Antonio Vieira Cabral "B0t&atilde;0" is younger brother of Manuel Verissimo Cabral above. 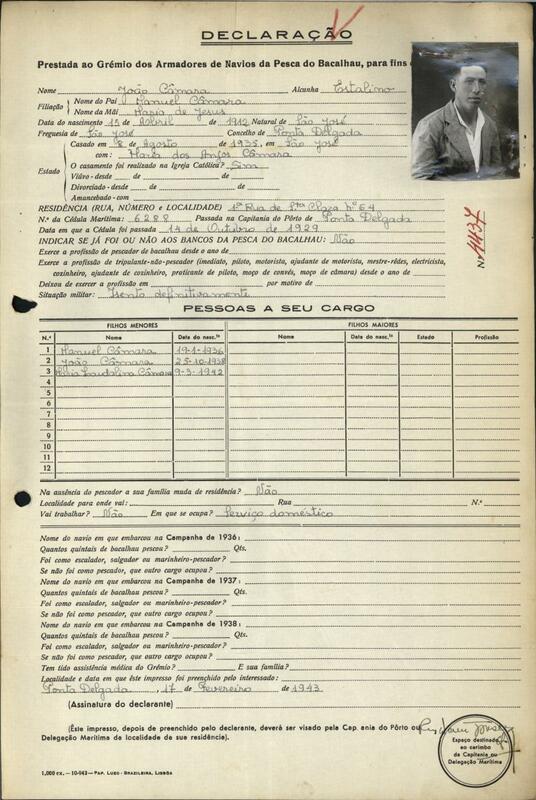 Notes: Antonio do Rego Coelho is the brother of Guilherme do Rego Coelho below. 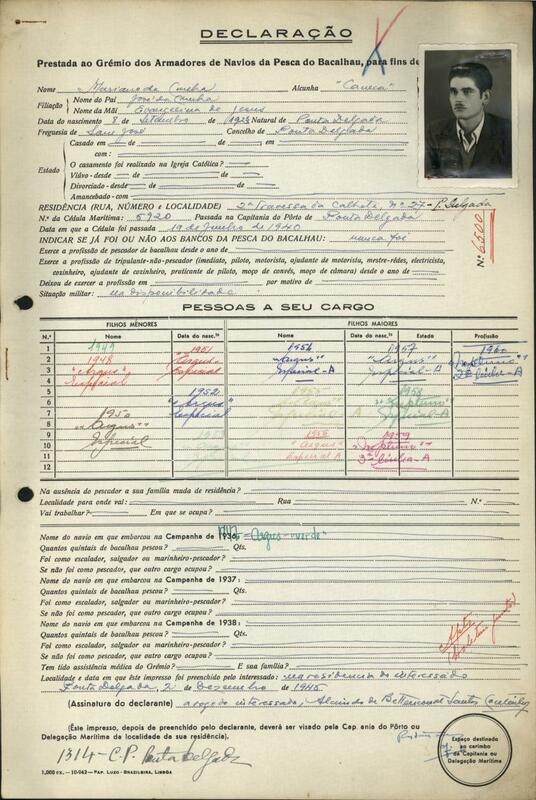 Notes: Guilherme do Rego Coelho is the brother of Antonio do Rego Coelho above. 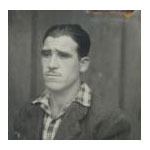 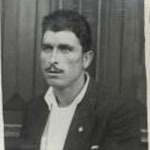 Notes: Josè Marques Coimbra is the Father of Luis Alberto de Andrade Marques Coimbra below. 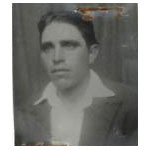 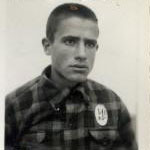 Notes: Luis Alberto de Andrade Marques Coimbra is the son of Josè Marques Coimbra above. 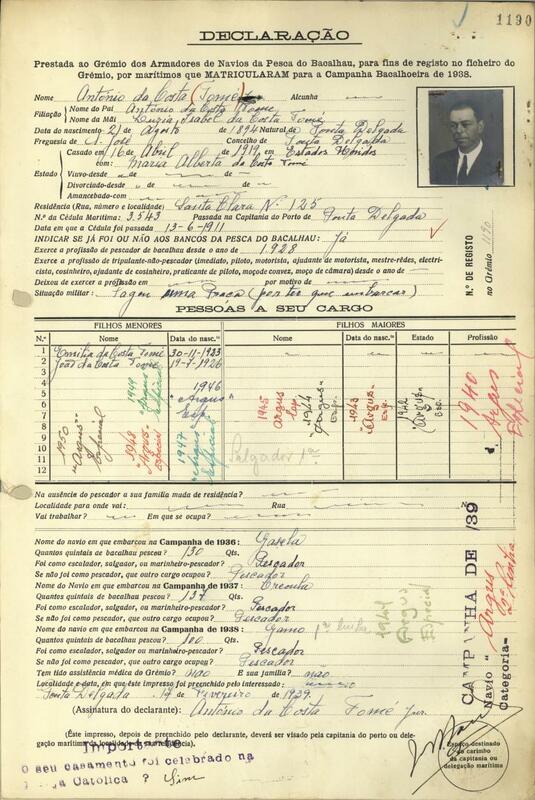 Notes: Jacinto da Costa Sr. Bexiga is the Father of Manuel da Costa "Bexiga" and below. 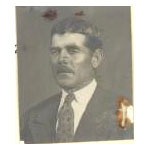 Notes: Manuel da Costa "Bexiga" is the son of Jacinto da Costa Sr. Bexiga above and brother of Jacinto da Costa Jr. Bexiga below. 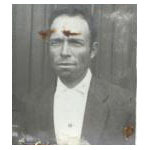 Notes: Jacinto da Costa Jr. Bexiga is the son of Jacinto da Costa Sr. Bexiga above and brother of Manuel da Costa "Bexiga" above. 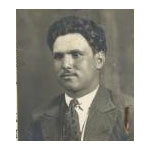 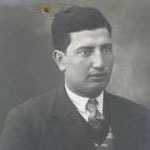 Notes: Josè da Costa is the Father of Antonio da Costa Talefa and brother of Ernesto da Costa below. 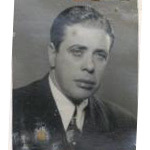 Notes: Antonio da Costa Talefa is the son of Josè da Costa above. 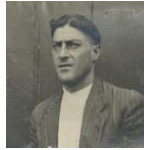 Notes: Ernesto da Costa is the brother of Josè da Costa above. 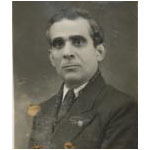 Notes: João da Costa is the Father of Antonio da Costa below. 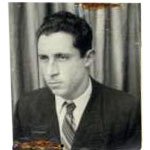 Notes: Antonio da Costa is the son of João da Costa above. 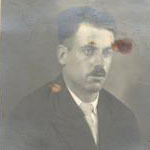 Notes: Josè da Costa Baleia is the Father of Manuel da Costa below. 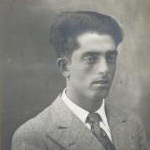 Notes: Manuel da Costa is the son of Josè da Costa Baleia above. 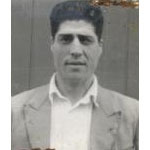 Notes: Manuel da Costa Jr. is the older brother of Laurenio da Costa below. 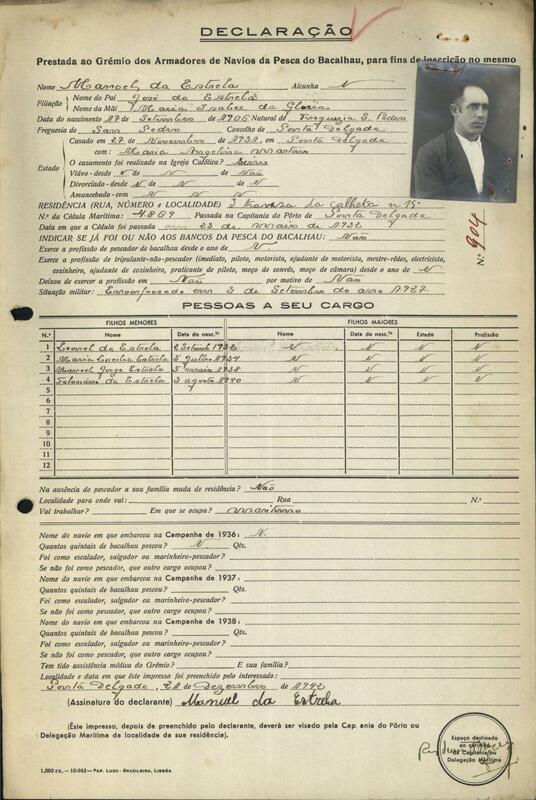 Notes: Laurenio da Costa is the younger brother of Manuel da Costa Jr. above. 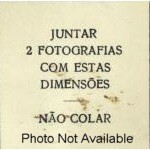 Notes: Not sure if originally from Ponta Delgada. 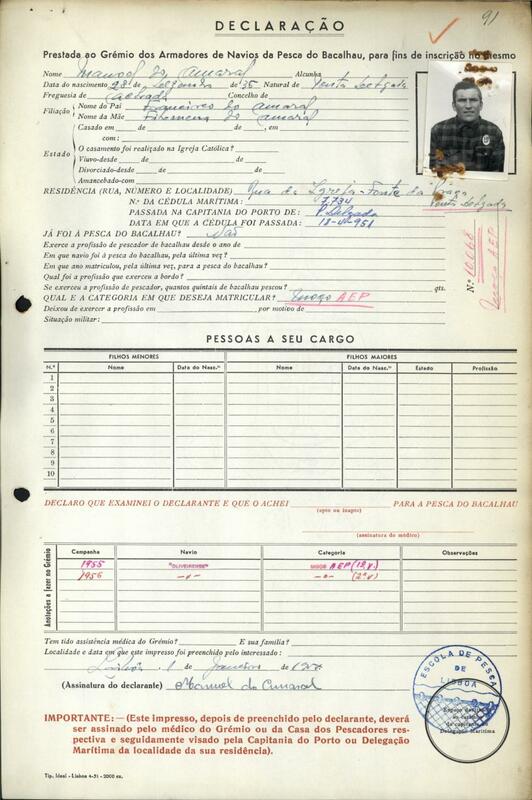 Notes: Josè da Cunha is the brother of Mariano da Cunha, Humberto da Cunha Caneca and Raul da Cunha below. 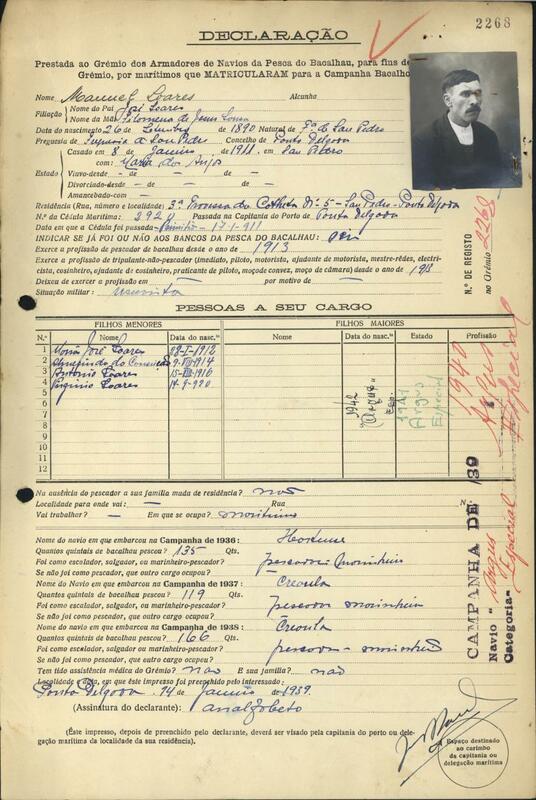 Notes: Mariano da Cunha is the brother of Josè da Cunha above and Humberto da Cunha Caneca and Raul da Cunha below. 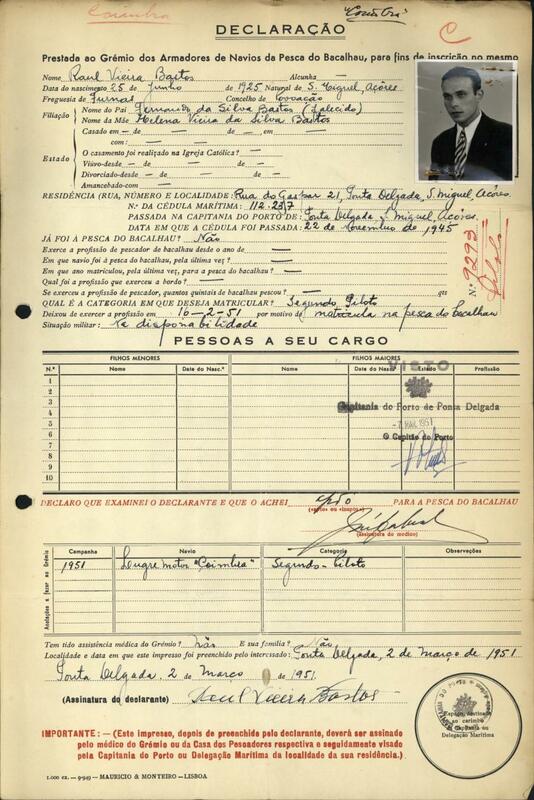 Notes: Humberto da Cunha Caneca is the brother of Mariano da Cunha and Josè da Cunha above and Raul da Cunha below. 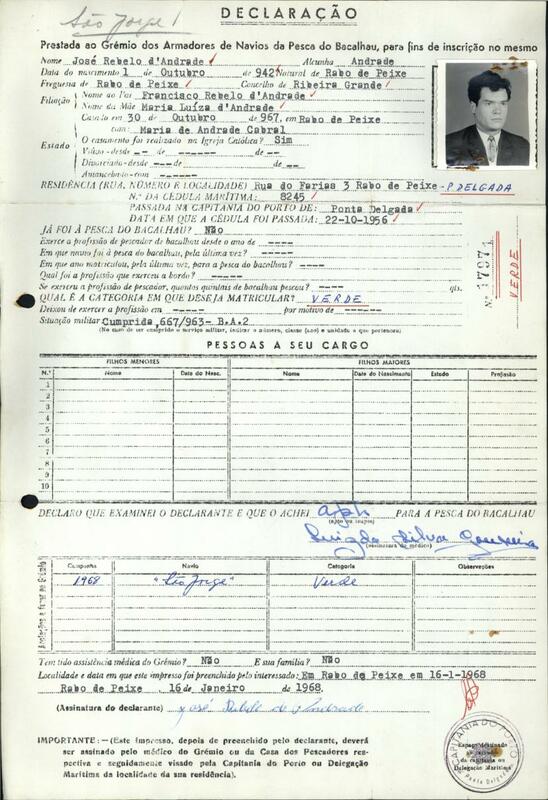 Notes: Raul da Cunha is the brother of Josè da Cunha, Mariano da Cunha and Humberto da Cunha Caneca above. 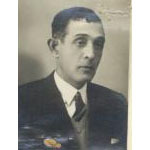 Notes: Josè da Cunha is the brother of Manuel da Cunha below. Notes: Manuel da Cunha is the brother of Josè da Cunha above. 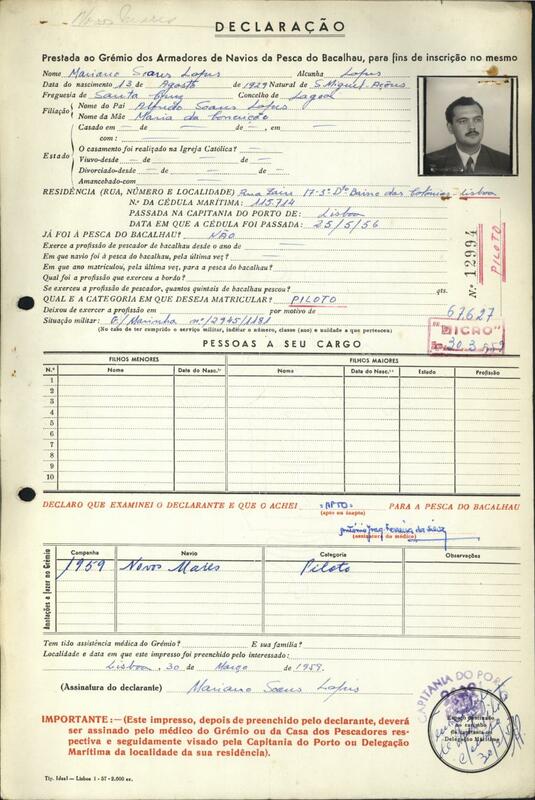 Notes: Manuel Duarte is the Father of Antonio Duarte and Anibal Duarte below. 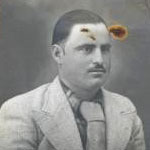 Notes: Antonio Duarte is the son of Manuel Duarte above. 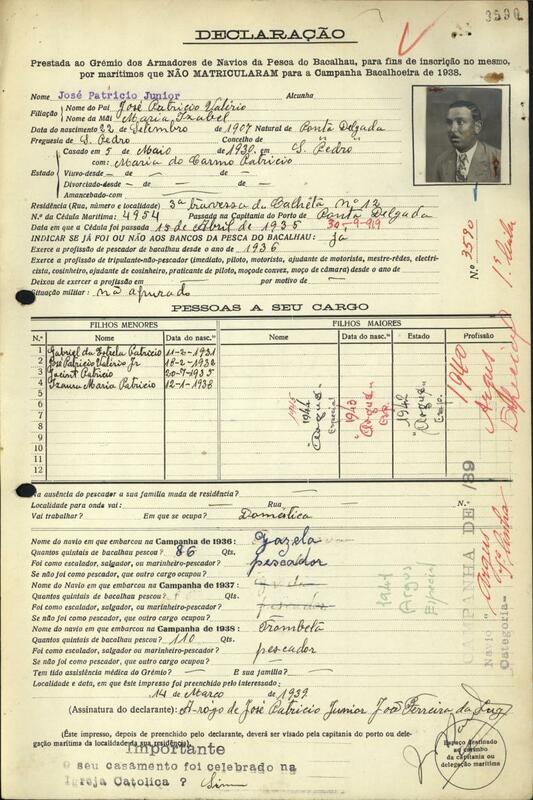 Notes: Anibal Duarte is the son of Manuel Duarte above. 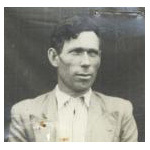 Notes: Jacinto da Estrela is the brother of Josè da Estrela below. 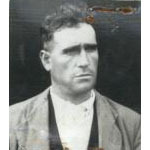 Notes: Josè da Estrela is the brother of Jacinto da Estrela above. 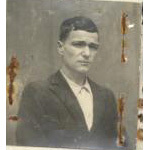 Notes: Manoel da Estrela is the Father of Leonel da Estrela below. 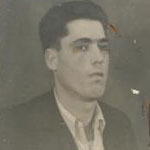 Notes: Leonel da Estrela is the son of Manoel da Estrela above. 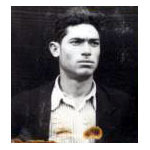 Notes: Eduardo da Estrela Geral is the brother of Josè da Estrela below. Notes: Josè da Estrela is the brother of Eduardo da Estrela Geral above. 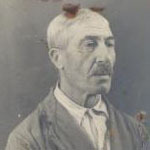 Notes: Manuel Vieira da Estrela is older brother of Josè Bernardo Vieira da Estrela below. 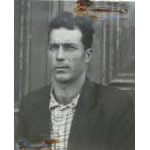 Notes: Josè Bernardo Vieira da Estrela is younger brother of Manuel Vieira da Estrela iSãolder brother of above. 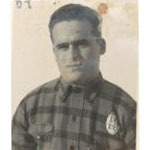 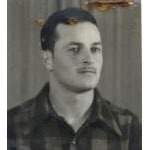 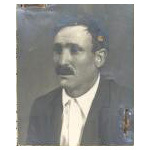 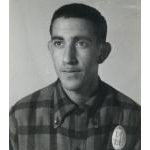 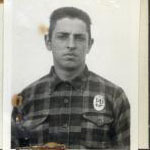 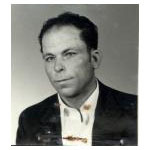 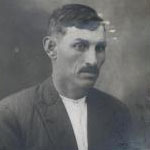 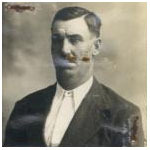 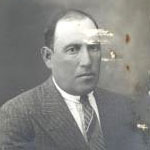 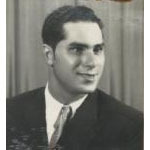 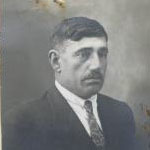 Notes: Manuel Faria is the Father of Manuel Carreiro Faria and brother of Antonio Faria below. 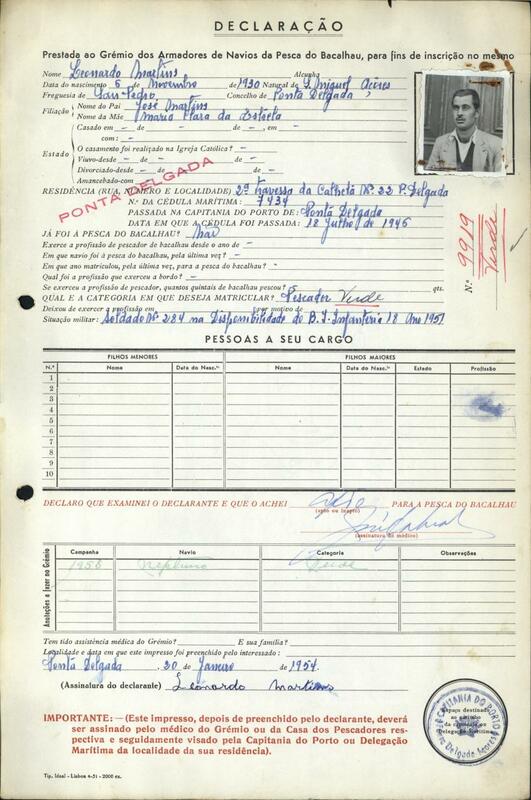 Notes: Manuel Carreiro Faria is the son of Manuel Faria above. 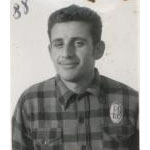 Notes: Antonio Faria is the brother of Manuel Faria above. 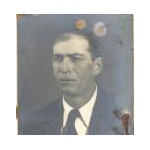 Notes: Manuel Patricio Faria is the brother of Antonio Patricio de Faria Jr. and Jacinto Soares Patricio de Faria below. 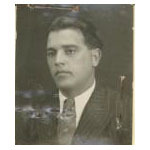 Antonio Patricio de Faria Jr.
Notes: Antonio Patricio de Faria Jr. is the brother of Manuel Patricio Faria and Jacinto Soares Patricio de Faria above and below. 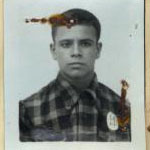 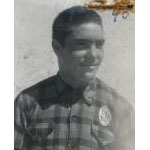 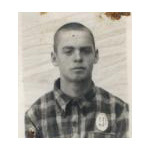 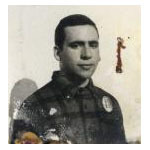 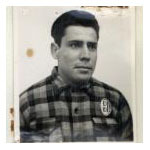 Notes: Jacinto Soares Patricio de Faria is the brother of Manuel Patricio Faria and Antonio Patricio de Faria Jr. above. 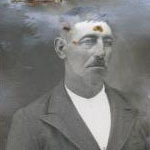 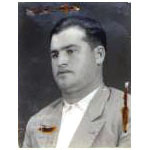 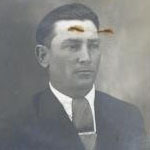 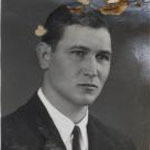 Jacinto Soares Patricio de Faria is the Father of Manuel Farias Manuel Baleia below. 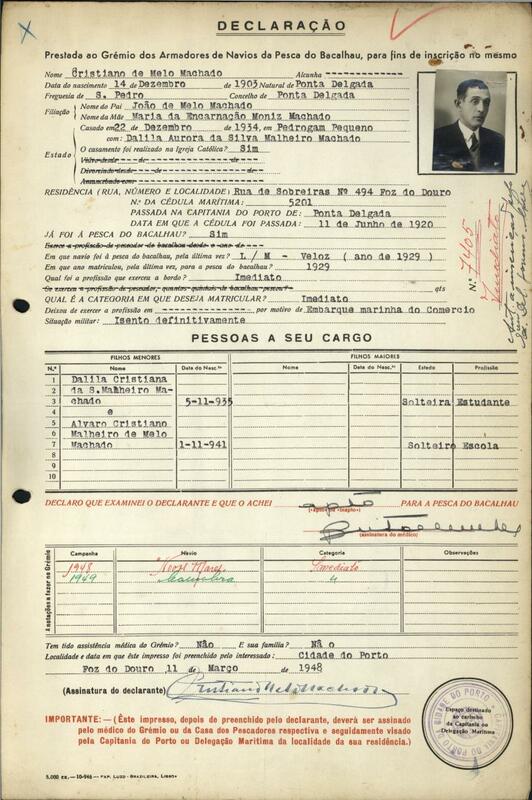 Notes: Manuel Farias Manuel Baleia is the son of Jacinto Soares Patricio de Faria above. 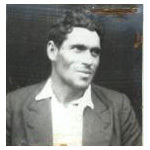 Notes: Josè Luis Estrela Flor is the brother of António Estrela Flor below. 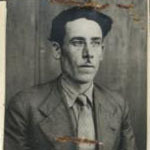 Notes: António Estrela Flor is the brother of Josè Luis Estrela Flor above. 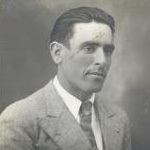 Notes: Josè da Silva Grilo is the brother of Manuel da Silva Grilo below. 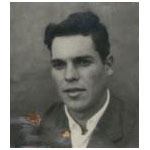 Notes: Manuel da Silva Grilo is the brother of Josè da Silva Grilo above. 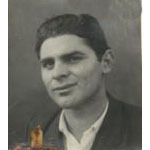 Notes: Manuel Martins Jr. Louro is the brother of Jacintho Martins Louro - Josè Martins Louro and Gil Martins Louro below. 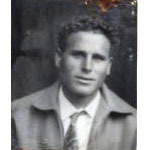 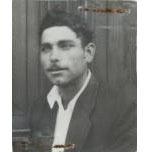 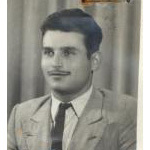 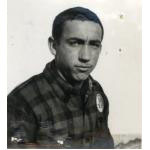 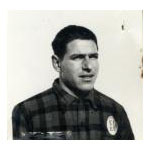 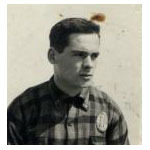 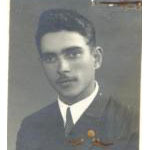 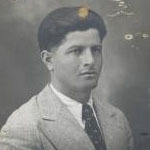 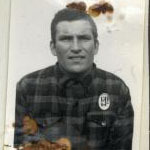 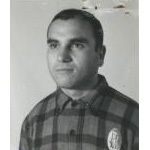 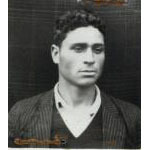 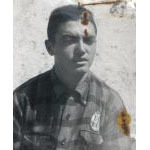 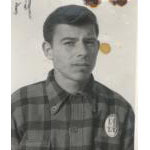 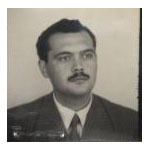 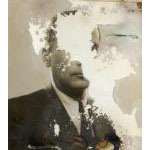 Notes: Jacintho Martins Louro is the Father of Manuel Martins Italiano below. 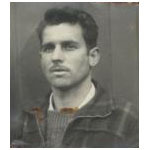 Jacintho Martins Louro is the brother of Manuel Martins Jr. Louro - Josè Martins Louro and Gil Martins Louro above and below. 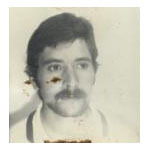 Notes: Manuel Martins Italiano is the son of Jacintho Martins Louro above. 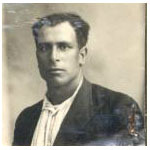 Notes: Josè Martins Louro is the Father of Leonardo Martins below. 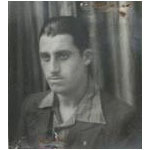 Josè Martins Louro is the brother of Manuel Martins Jr. Louro - Jacintho Martins Louro and Gil Martins Louro above and below. 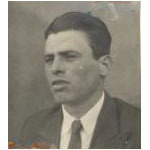 Notes: Leonardo Martins is the son of Josè Martins Louro above. 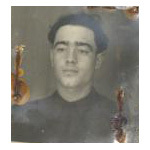 Notes: Gil Martins Louro Is the Father of Gil Martins Louro below. 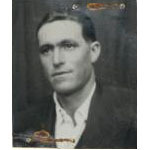 Gil Martins Louro is the brother of Manuel Martins Jr. Louro - Jacintho Martins Louro and Josè Martins Louro above. 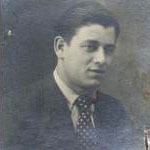 Notes: Manuel Joaquim Martins is the son of Gil Martins Louro above. 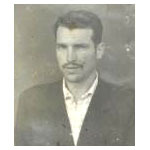 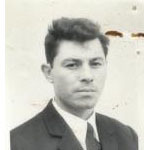 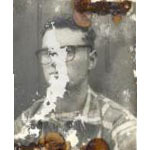 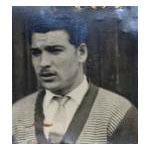 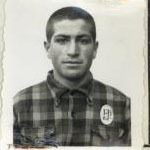 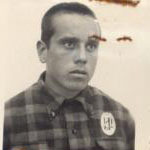 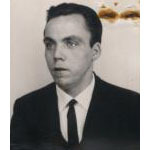 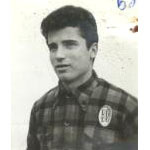 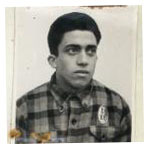 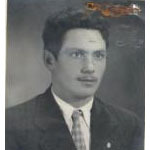 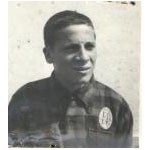 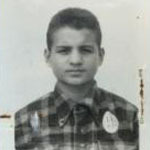 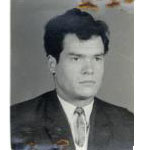 Notes: Francisco Martins Porrãosinho is the brother of Gil Martins Porranzinho below. 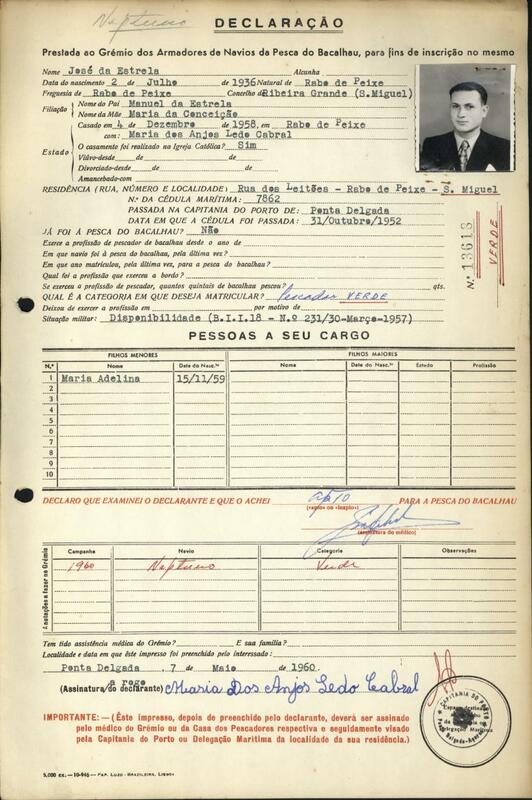 Notes: Gil Martins Porranzinho is the brother of Francisco Martins Porrãosinho above. 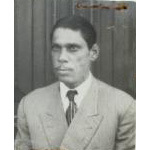 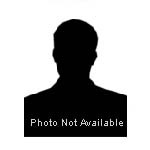 Notes: Alvaro Martins Sago is the brother of Manuel Martins Pretinho below. 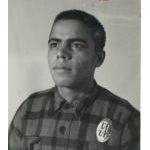 Notes: Manuel Martins Pretinho is the brother of Alvaro Martins Sago above. 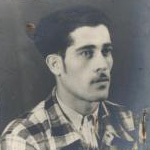 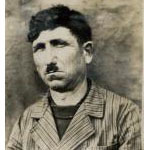 Notes: Manuel Martins Nazar is the brother of Josè Martins below. 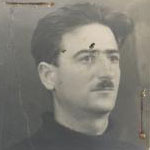 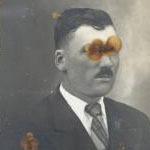 Notes: Josè Martins is the brother of Manuel Martins Nazar above. 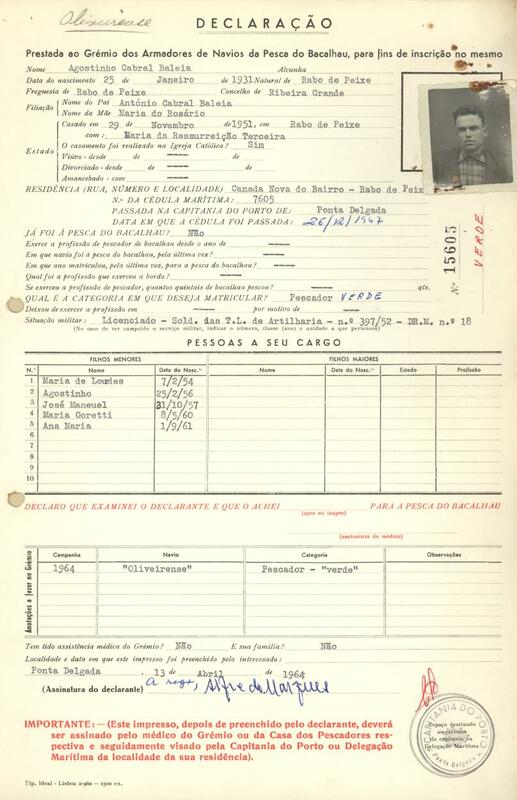 Notes: Francisco Matos is the brother of Manuel Matos and Josè Matos below. 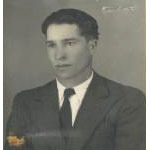 Notes: Josè Matos is the brother of Francisco Matos and Manuel Matos above. 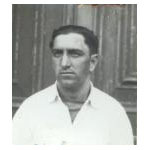 Notes: Manuel de Medeiros Chiquito is the brother of Edmundo de Medeiros below. 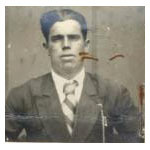 Notes: Edmundo de Medeiros is the brother of Manuel de Medeiros Chiquito above. 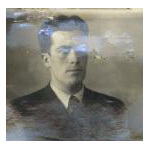 Notes: Manuel Pedro de Melo is the brother of Serafim de Melo below. Notes: Serafim de Melo is the brother of Manuel Pedro de Melo above. 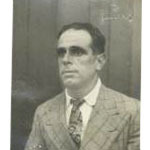 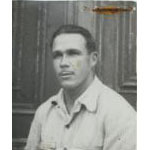 Notes: Henrique Vieira Sebastião Jr. is the brother of Josè de Andrade Sebastião below. 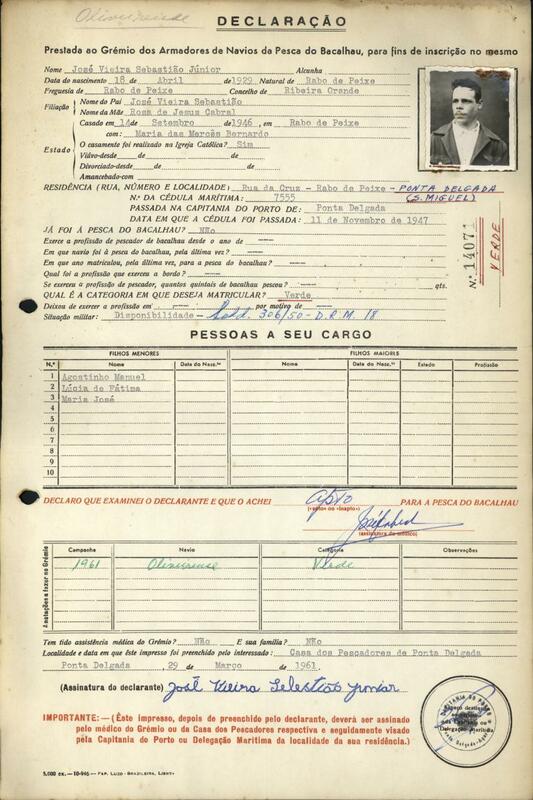 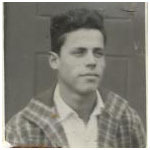 Notes:Josè de Andrade Sebastião is the brother of Henrique Vieira Sebastião Jr. above. 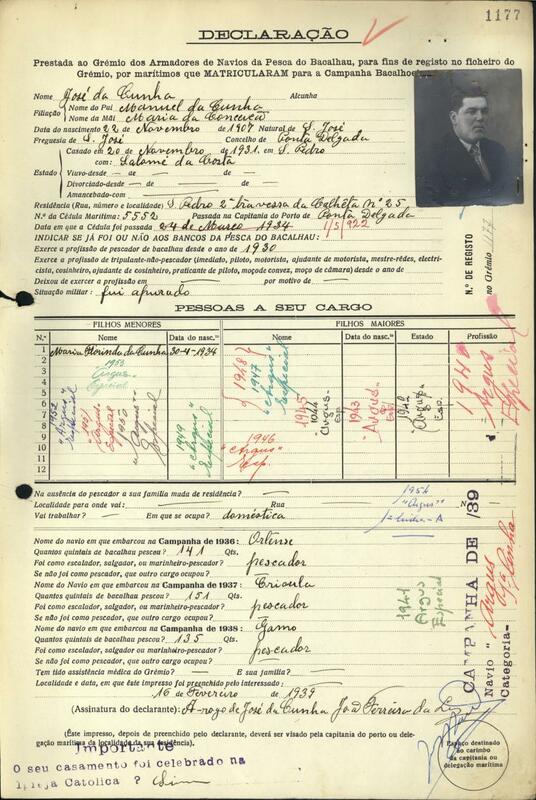 Notes: Sebastião Cabral Vieira is the brother of Francisco Cabral Sebastião Joaquim above and Antonio Cabral Sebastião below. 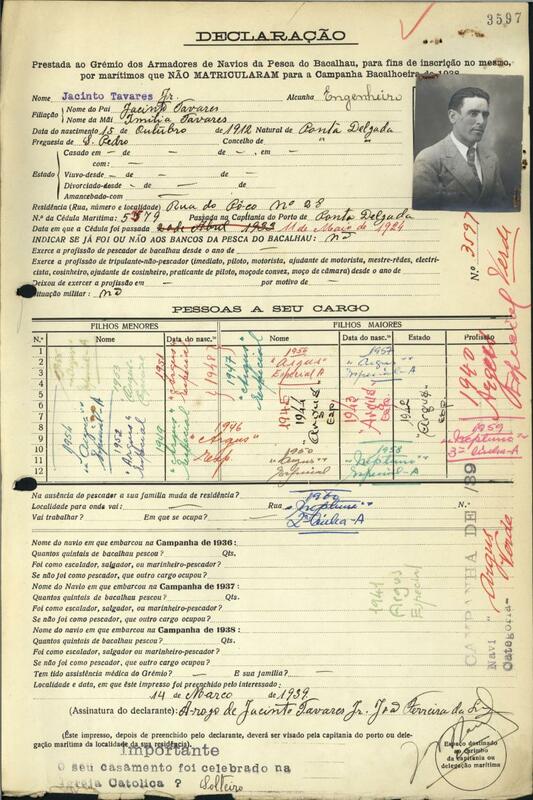 Notes: Antonio Cabral Sebastião is the brother of Francisco Cabral Sebastião Joaquim and Sebastião Cabral Vieira above. 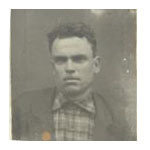 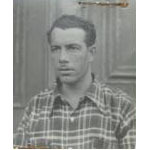 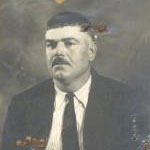 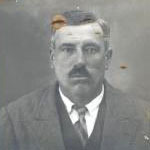 Notes: Manuel Soares is the Father of Antonio Soares Vida Negra and Grandfather of Antonio Manuel Soares below. 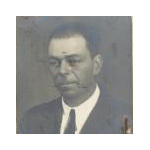 Notes: Antonio Soares Vida Negra is the son of Manuel Soares above and Father of Antonio Manuel Soares below. 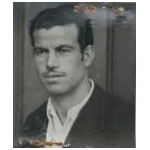 Notes: Antonio Manuel Soares is the son of Antonio Soares Vida Negra and grandson of Manuel Soares above. 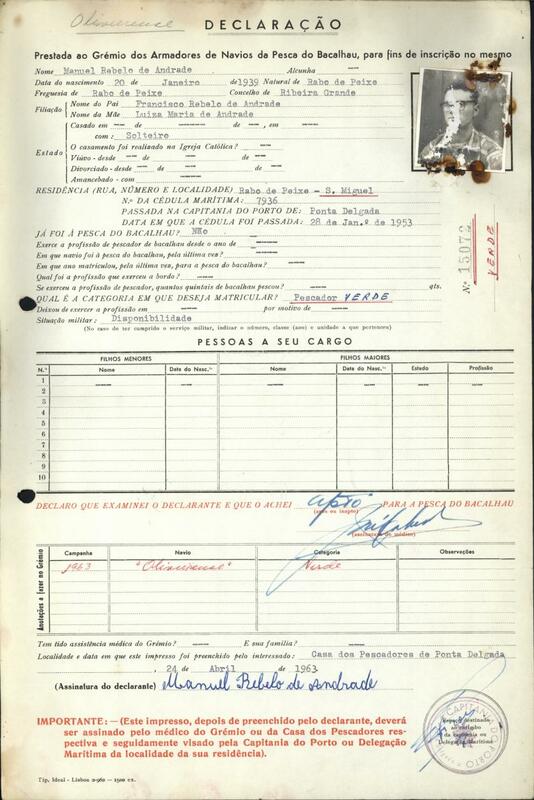 e os Navios: 1916-1936 ??? 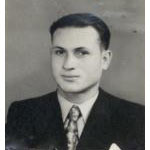 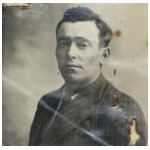 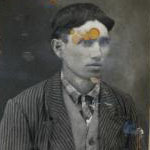 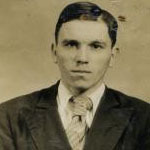 Notes: Antonio de Sousa Jr. Garàlha is the Father of Edmundo de Sousa below. Notes: Edmundo de Sousa is the son of Antonio de Sousa Jr. Garàlha above. 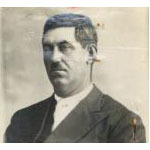 Notes: João de Sousa Garàlha is the Father of Josè Jacinto de Sousa below. 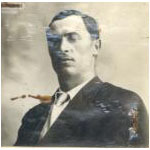 Notes: Josè Jacinto de Sousa is the son of João de Sousa Garàlha above. 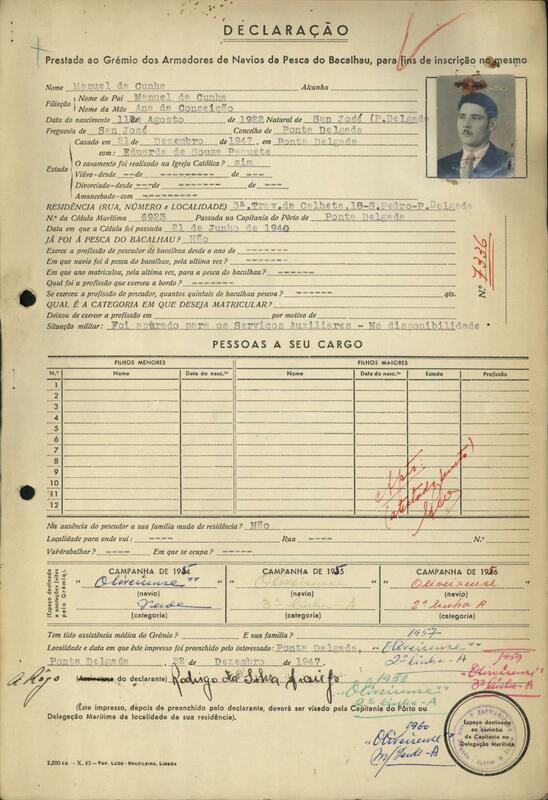 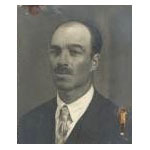 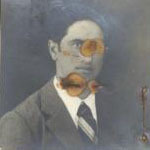 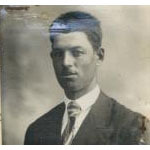 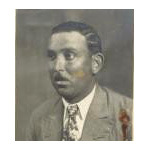 Notes: Jacinto Tavares Engenheiro is the brother of Josè Tavares Engenheiro below. 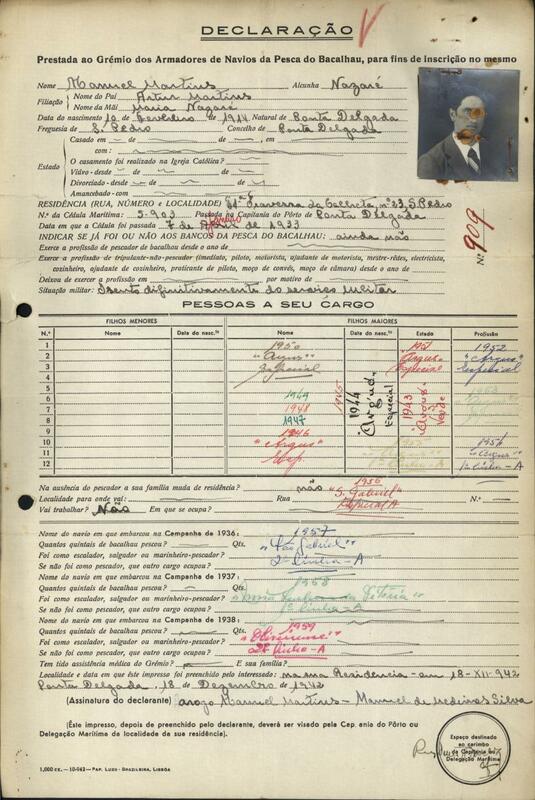 Notes: Josè Tavares Engenheiro is the brother of Jacinto Tavares Engenheiro above. 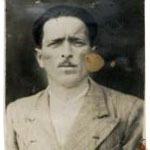 Notes: Antonio da Costa Tomé is the brother of João da Costa Tomé below. Notes: João da Costa Tomé is the brother of Antonio da Costa Tomé above.